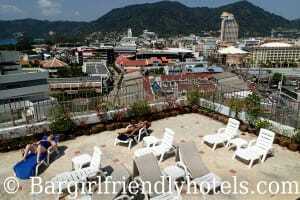 The Phuket guest friendly hotels stated in this list are all located by area either in Patong, Karon or Kata Beach. All offer great value for the money and good service while the rates themselves can greatly vary from budget to 5 star luxury. 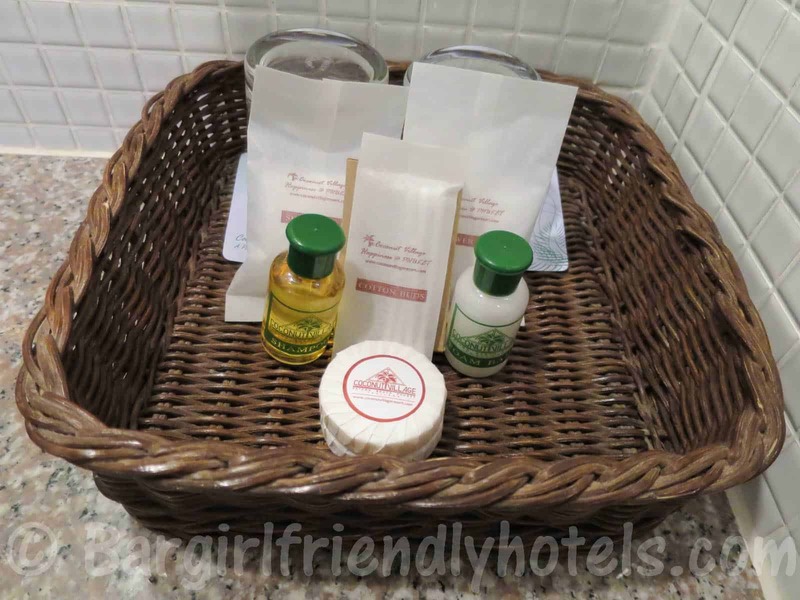 But just what is a Phuket guest friendly hotel? 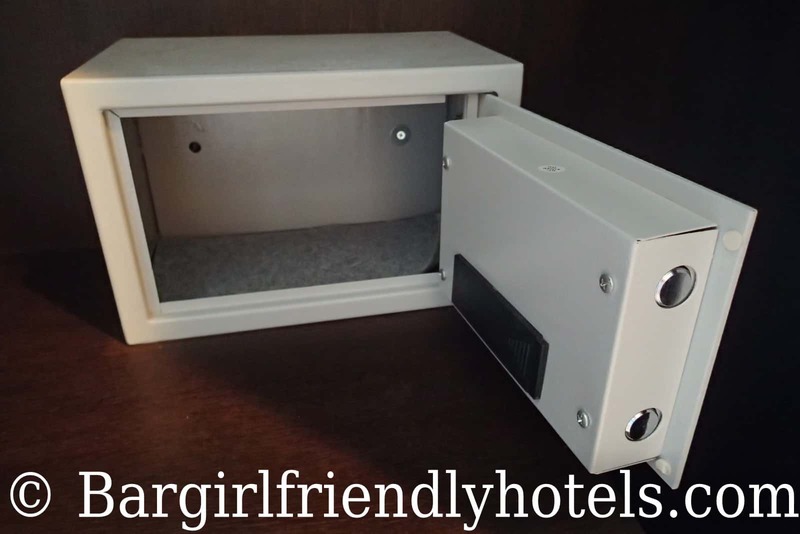 A hotel that is considered guest or girl friendly simply means that the hotel will not charge extra for taking back an unregistered guest to your room. Bear in mind that not all hotels in Phuket have an open policy that will allow you to bring back an unregistered guest to your room. 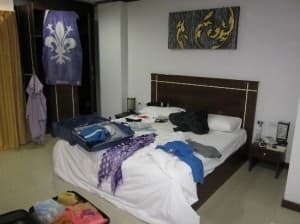 Some do outright refuse while others will smack you with a joiner fee can costs anywhere from 500+ THB a night or more depending on the hotel. 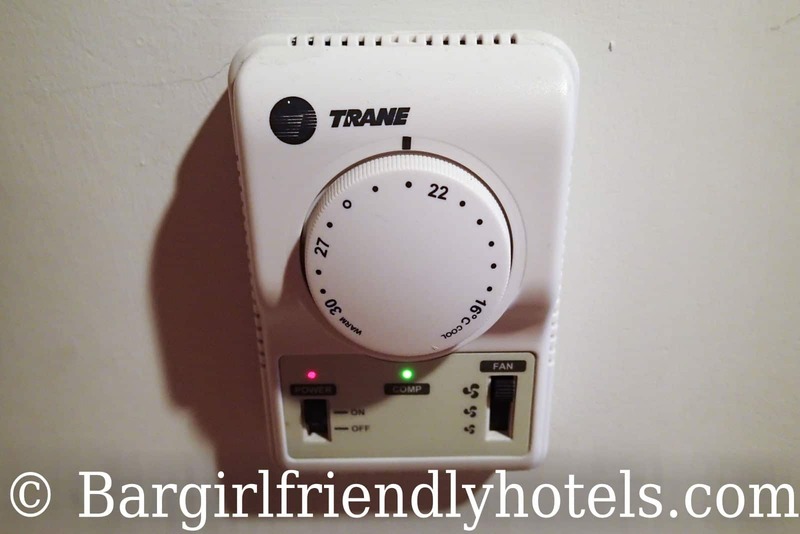 So if you unknowingly book a non-guest friendly hotel and plan on taking a guest back up to your room every night for a week then you’re going to be paying a lot more money unnecessarily. I’ve taken the trouble of making a list of which ones are ok, and allow whoever you want to accompany you to your room. 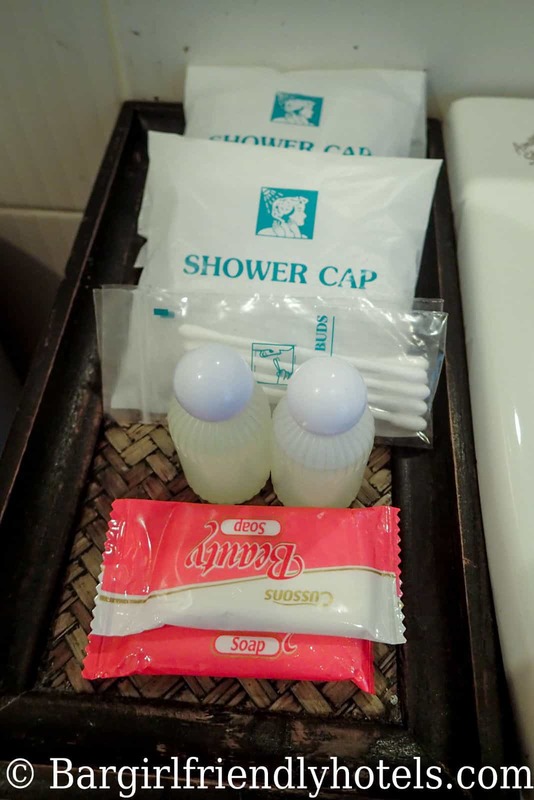 This is by no means an indication of their respectability as each hotel has different policies as long as you’re discreet. 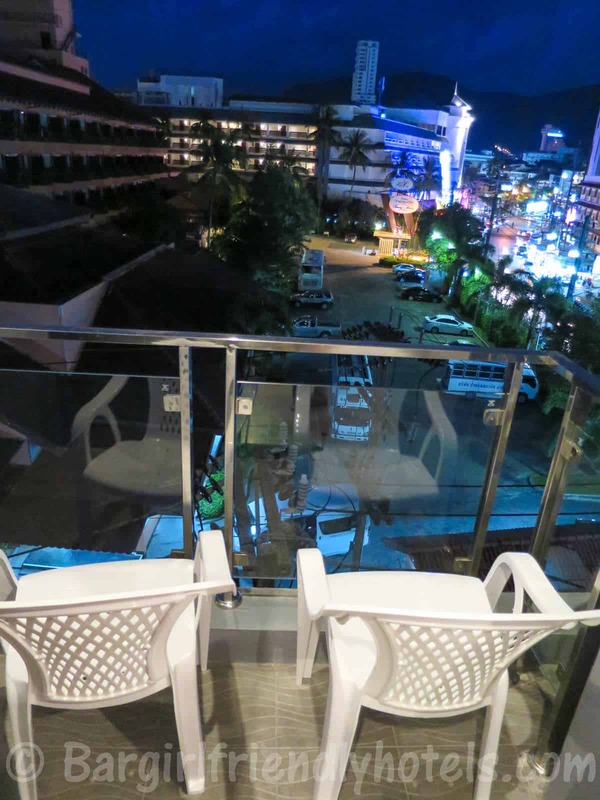 If you're in Patong for the nightlife then the @ White Patong Hotel is at an ideal location with Bangla Road just next door 50 meters away. 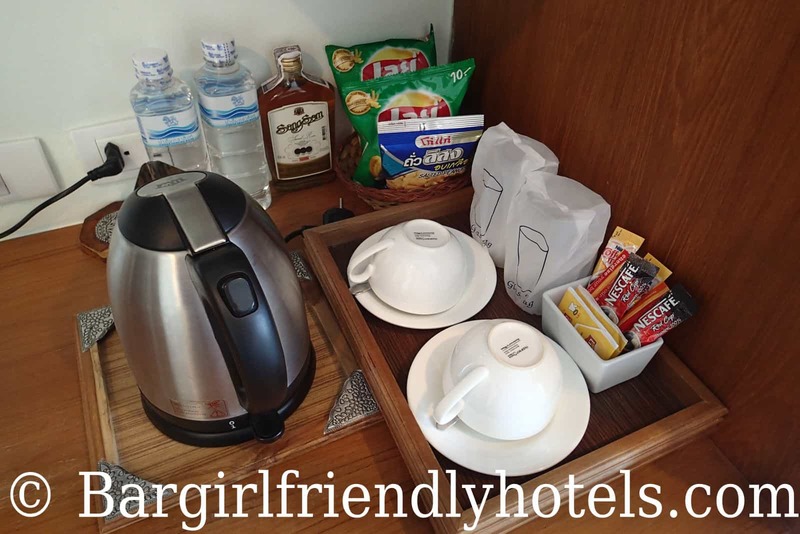 Rooms are simple but cozy and come equipped with these amenities: a proper bed, flat-screen TV with a decent selection of channel, full sized fridge with decently priced drinks, A/C, small bathroom with free shower gel & shampoo, in room safe & reliable free Wi-Fi. 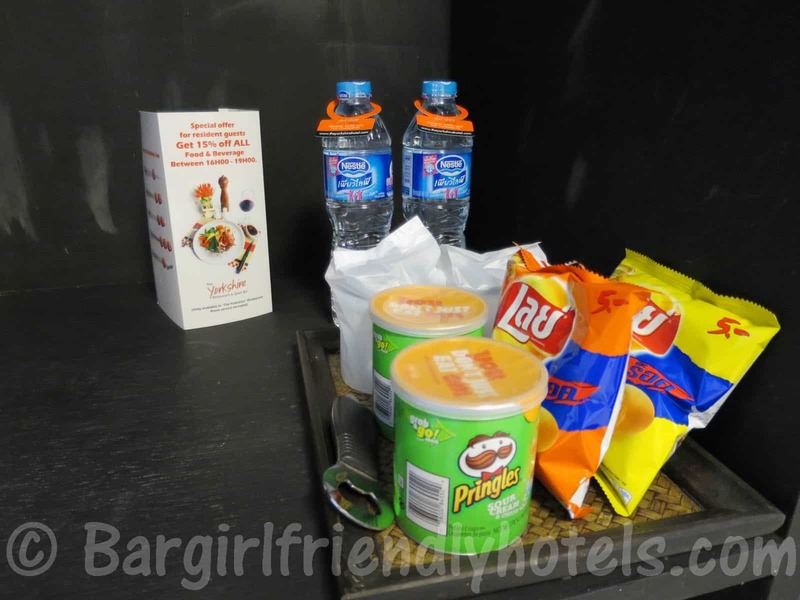 They also have a nice little restaurant attached to it that makes good food + does room service if you fancy eating in your room. No problems bringing back freelance girls as long as you keep it to one at a time, 2 will set you back 500 THB. Considering the location, my room was relatively quiet when it came the time to sleep. For the price I paid I was happy, they also have been awarded TripAdvisor's 2013 Certificate of Excellence so they must be doing something right. 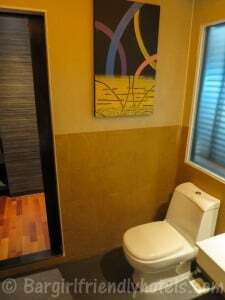 Last Date Visited: Pictures of the @White Patong Hotel were taken during my last visit in March 2014 and reflect their most basic accommodation on offer found Online : “The Standard room”. 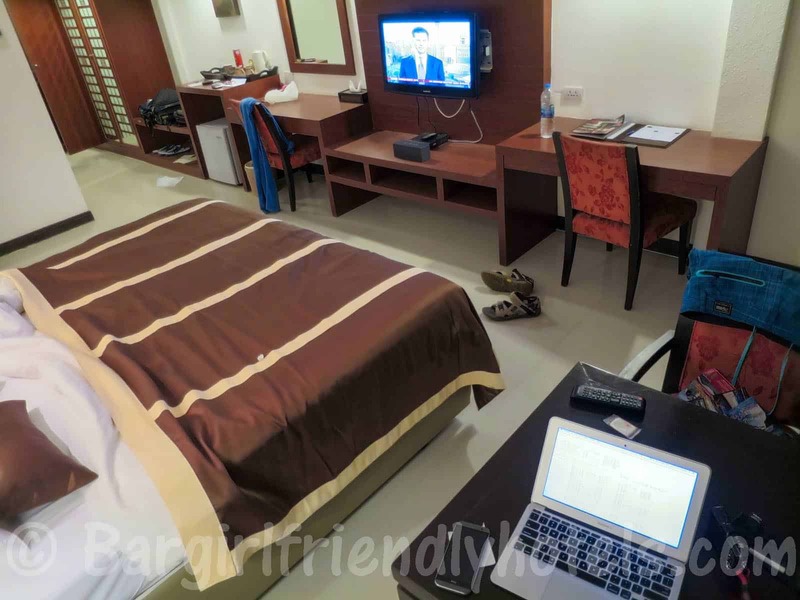 PROS: Central location close to Bangla and the beach, good value Winner of TripAdvisor's 2013 Certificate of Excellence Award, free WiFi was fast. 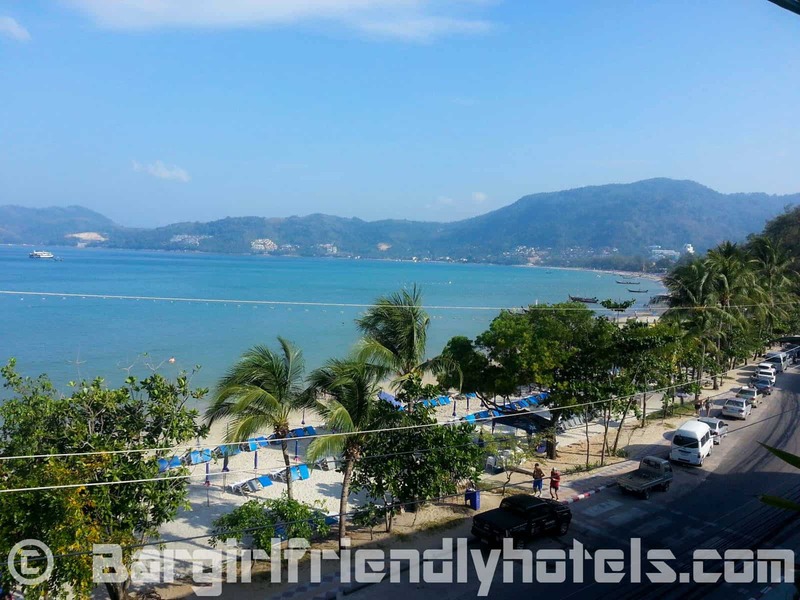 Guest Friendly policy reply by The White Patong Hotel: "We are hotel guest friendly. 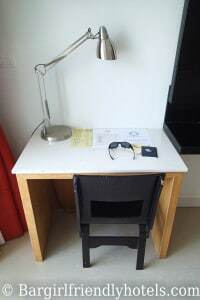 It is no extra charge for joiner as long as only 2 persons in room. 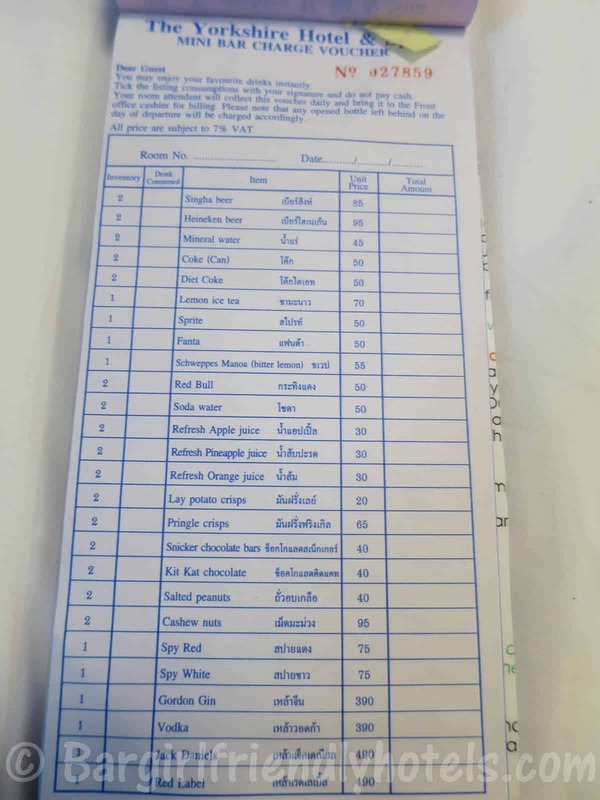 The third will charge for 500 baht/person. Thank you very much, Anna ". 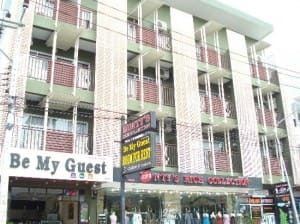 The Acca Patong is conveniently located 3/4 down Soi Sansabai just opposite to Phuket's nightlife center Bangla Road, less than 5 minutes walk away & from there an extra 5 mins to the beach. The Acca Patong is a newly renovated hotel that has a boutique feel where modern interior design mixes with a vintage atmosphere. Arriving early I accepted a Twin room with balcony that was ready instead of waiting hours for the double bed one I had booked. 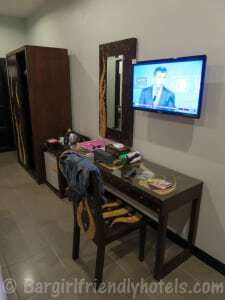 Room was nice and modern with all the expected facilities: Comfortable beds, 32-inch LCD TV, Free Wi-Fi, small Fridge, an A/C unit control was very effective to cool down the room, bathroom with shower wasn't the biggest but very clean with gel and shampoo provided, safety deposit box, water boiler with free coffee & tea. Staff was very pleasant and never experienced any problems bringing back bargirls to the room so no qualms here. The Acca Patong is also a recipient of TripAdvisor's Certificate of Excellence 2013 so it's ranked pretty highly in Phuket in it's category. 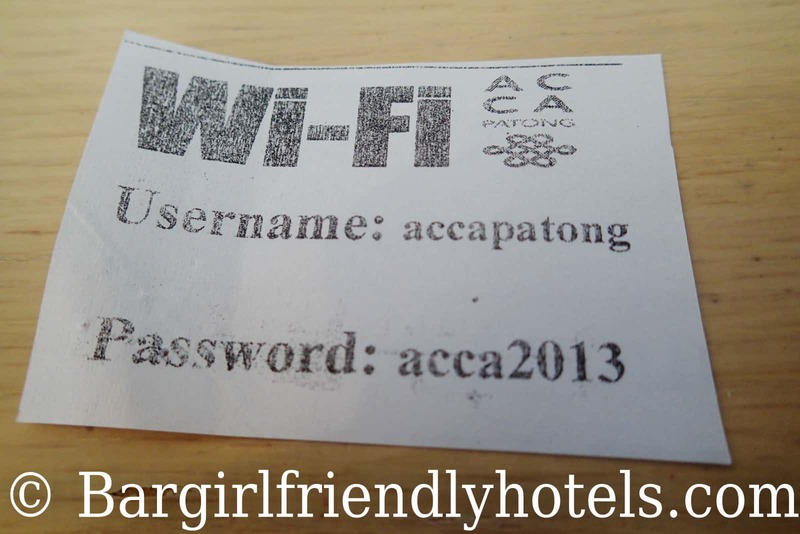 Last Date Visited: Pictures of the Acca Patong Hotel were taken during my last visit in March 2014 and reflect their most basic accommodation on offer found Online : “The Acca Superior Room”. 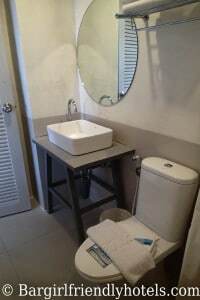 PROS: Winner of TripAdvisor's Certificate of Excellence 2013, Location near Bangla, new property, Free Wi-Fi, Friendly staff. CONS: Rooms on street side can be noisy so try to get one a few floors up or on the opposite side. Guest Friendly policy reply by the Acca Patong: "Thank you for your kind interested in our property for your upcoming valuable holidays. Don't be concern we do not charge for lady joiner! 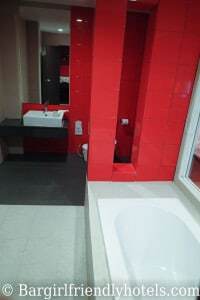 We look forard to see you soon at Acca Patong Best Regards, Somsak P". 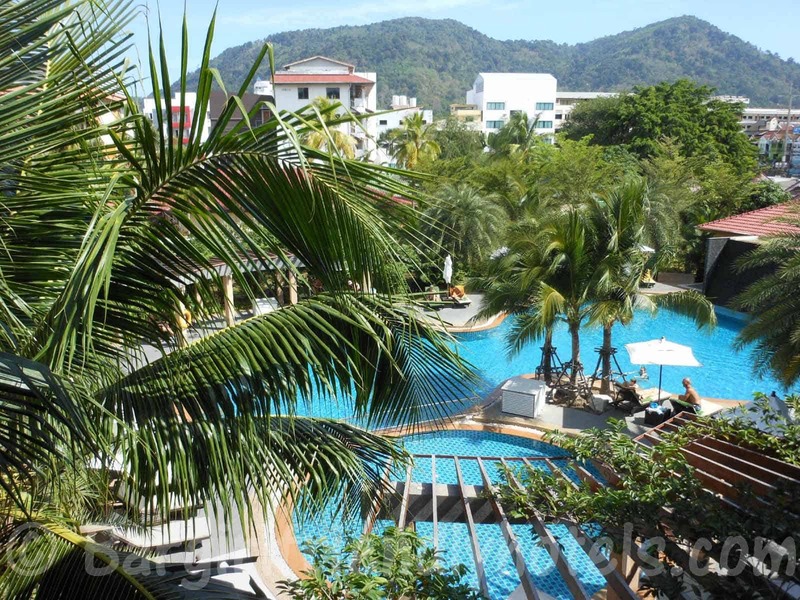 The Alfresco Phuket hotel was one the pleasant discoveries of my 2014 trip to Patong. While it did help they upgraded me to a suite room for free I would have happily paid the full 50$ price tag it was offered for on Agoda. The Alfresco is a great new little hotel with a modern decor and stylish design that was built 3½ years ago. 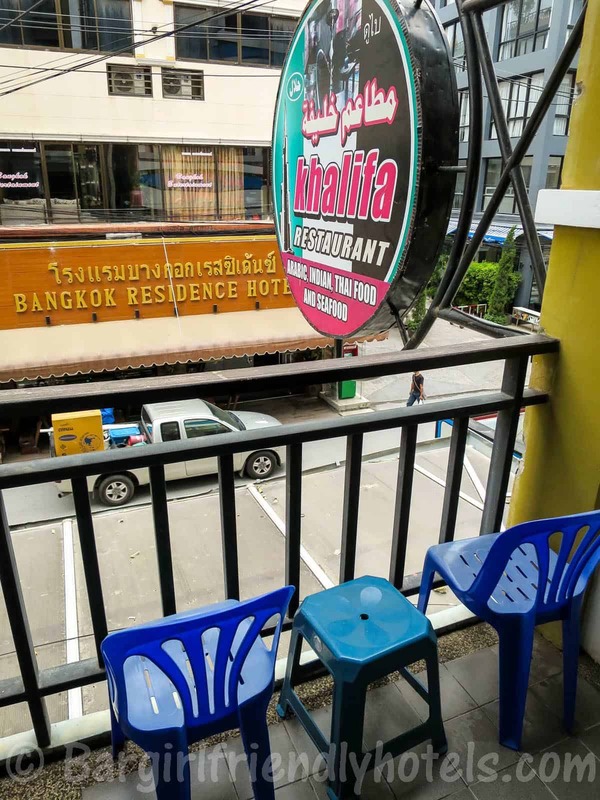 The only downside is it's location, a little far from the action with Bangla Road and the beach a good 15-20 minutes walk away, a free tuk tuk services is available but only until 5 pm. 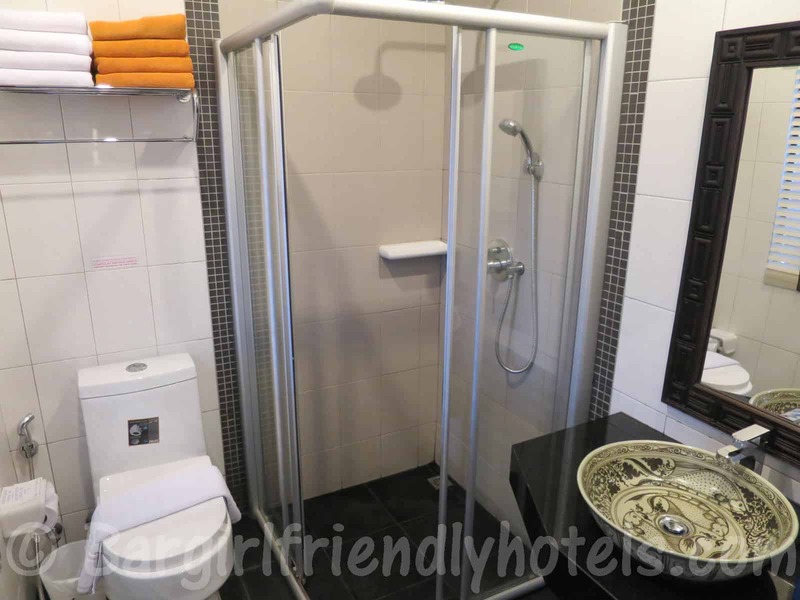 Regarding the suite room, what you see on their booking website is what you will get: Clean and modernly designed rooms with an excellent mood lighting. 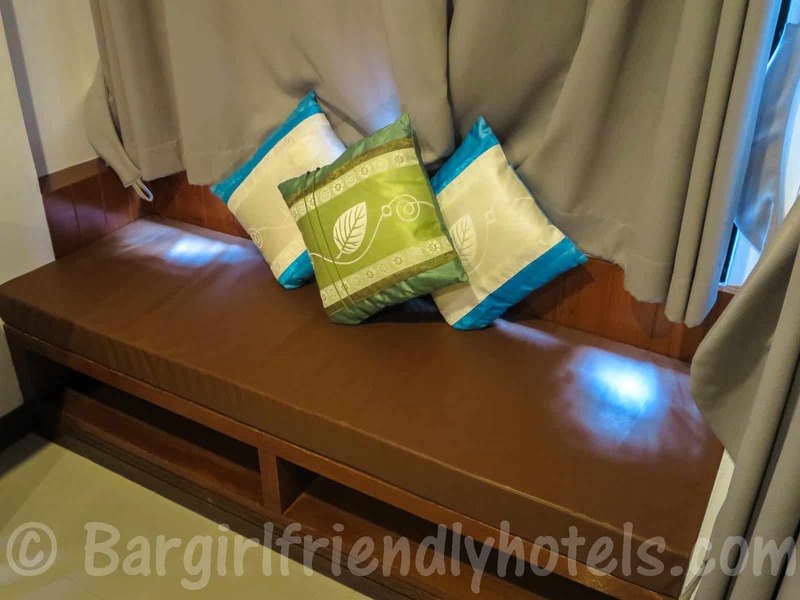 I really liked the layout with a small seating area with pillows at the base of the bed and see-through bathroom, heck even one the bargirls I brought back complimented me about the room and was suprised of the low end price. 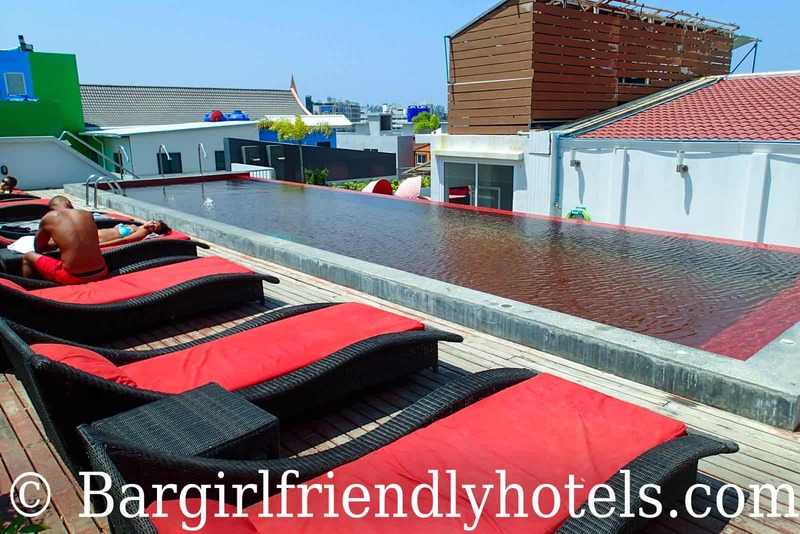 The hotel also has a nice little rooftop pool with sunbeds and a lounge area that's pleasant to chill at in the daytime. 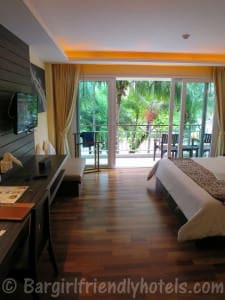 For those of you out there interested in overall reviews and ratings, the Alfresco Phuket hotel was awarded the Certificate of Excellence 2013 by TripAdvisor so you can't really go wrong here. Comfy bed with a small seating area, big LCD TV & DVD player with some good selection of English channels, proper A/C control, see-through bathroom with bathtub and separate room for shower with free toiletries, mini-bar has a selection of drinks, spirits and snacks all at very decent prices, boiler with free coffee/tea, free & fast WiFi for each individual floor and wardrobe with electronic safe. 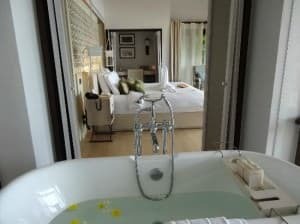 Last Date Visited: Pictures of the Alfresco Phuket Hotel were taken during my last visit in March 2014 and reflects their room type on offer found Online : “The Alfresco Suite”. CONS: Distance from Bangla Rd & beach, Free tuk-tuk stops at 5PM. Guest Friendly policy reply by the Alfresco Phuket Hotel: "Please be inform that for over night guest our hotel are free of charge. Best Regards, Reservation Dep. 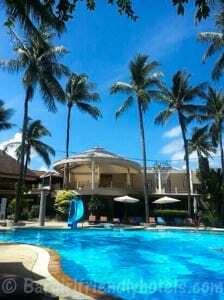 Alfresco Phuket Hotel". 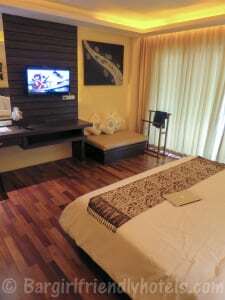 Rooms at the Amata Resort are modern and spacious with all the expected facilities (Great air-con, free Wi-Fi, mini-bar, in room safe, TV, etc. ) 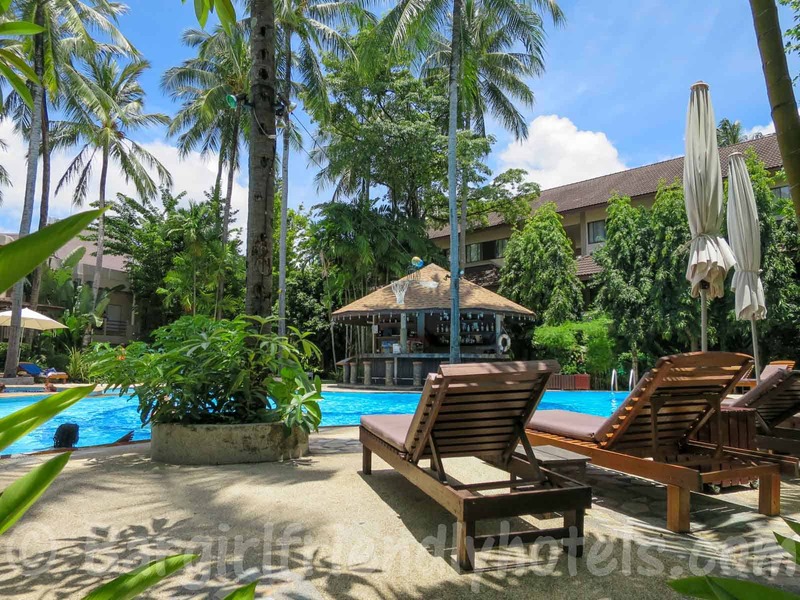 and while it's an easy walk to everything you could possible want (5-10 minutes to Bangla road or 10-15 to the Patong beach) it remains tucked in a quiet location for a good night's sleep. 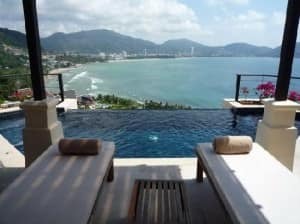 The Amata also has two pools of which the rooftop one is particularly attractive since it offers some great 360° panoramic view of Patong and has a bar where you can enjoy a few beers and a meal. 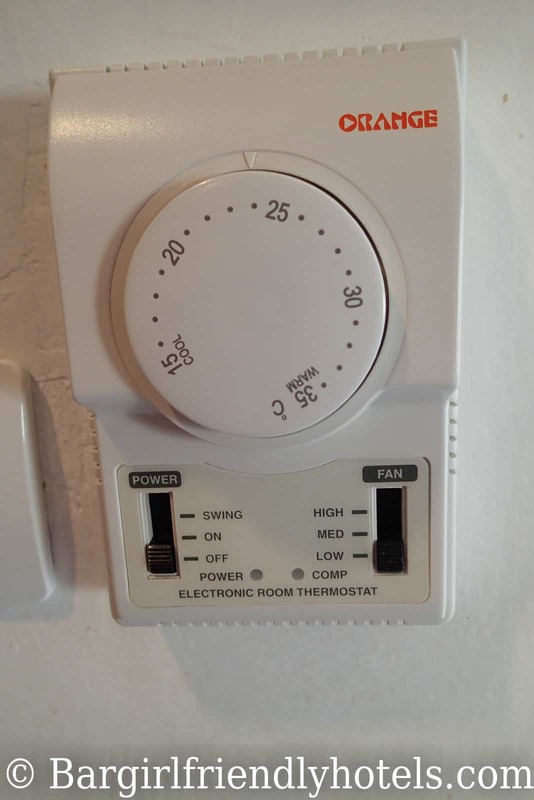 Overall very good value for money! Clean rooms of decent size with tiled floors, a comfortable king size bed with two small sofa chairs next to it, strong Air Con unit, Free in-room WiFi as well as throughout the hotel and it's pools, while the TV has a nice selection of channels it's an older CRT model so don't expect a crisp an sharp image, rooms also has a nice little balcony looking out to the main street and pool, clean bathroom with shower & a few free toiletries, mini-bar with drinks at these prices, in-room safe to store your valuables, extensive selection of food from the room service menu and nice rooftop pool providing 360° views of the surroundings with deck chairs for relaxing or tanning. No issues with the staff either, they were all very nice and no problems bringing back this nice little bargirl from the Tiger beer bar complex back to my room. 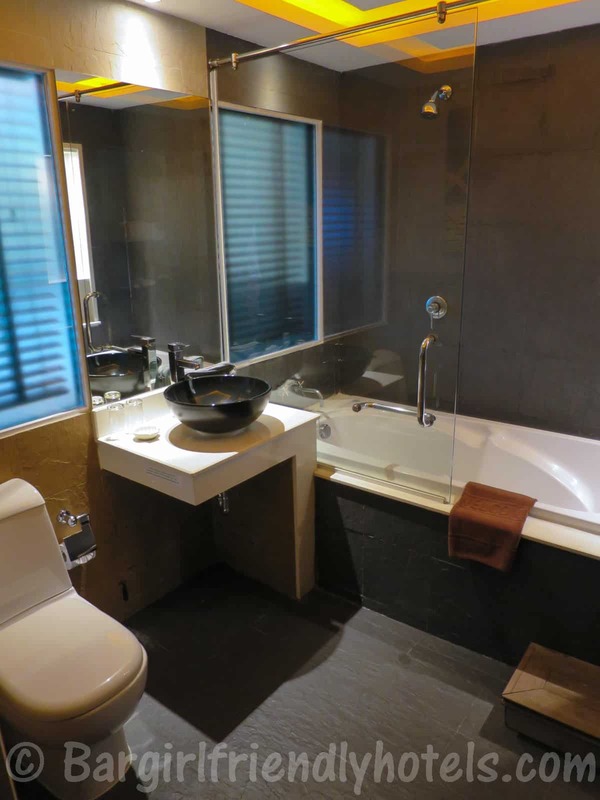 Last Date Visited: Pictures of the Amata Resort were taken during my last visit in March 2014 and reflect their most basic accommodation on offer found Online : “The Double Standard Room”. 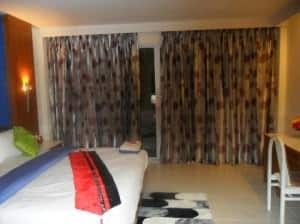 PROS: Very close to everything, quiet location, nice pools, friendly staff, good price/quality ratio, check-in/out quick & easy. CONS: Older generation CRT TV. Guest Friendly policy reply by the Amata Resort: "About our joiner policy, one room can stay 2 people, if you stay one person, you can have one extra person per night with no charge. 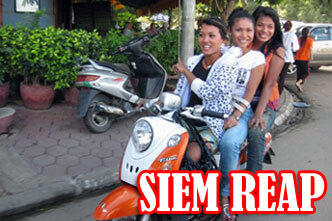 More than one, 500 baht will be applied for each extra person. Please note: for security policy, extra person MUST leave the ID at the front desk. Best regards, Reservation Team". 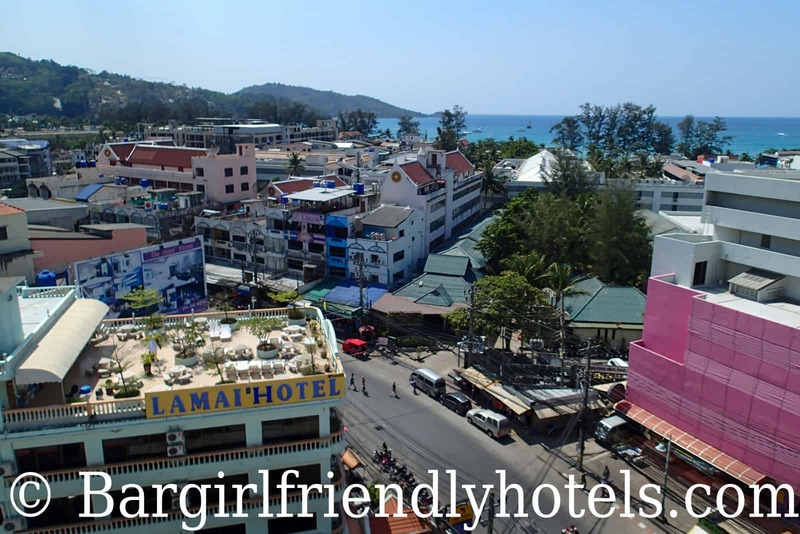 The Anchalee Inn is located at the Southern end of Patong's main road, only a short 5 minutes walk to the beach. To get to Bangla it's a bit more of a stroll, around 15-20 minutes but there are many bars and restaurants to chose from if you need any pit-stops on the way. 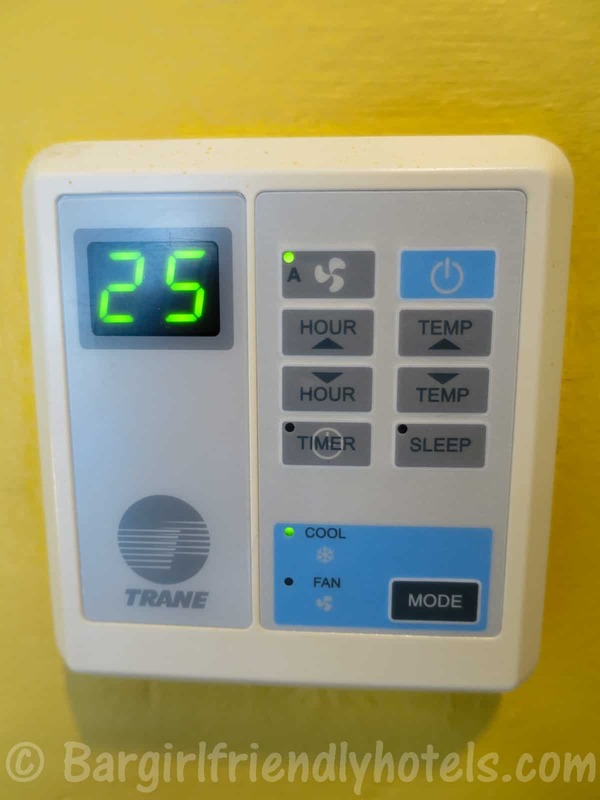 With prices consistently in the lower end of the spectrum, the Anchalee Inn offers more facilities than most budget hotels: Swimming pool with sauna, free to play pool tables, fitness room & a good restaurant with room service. 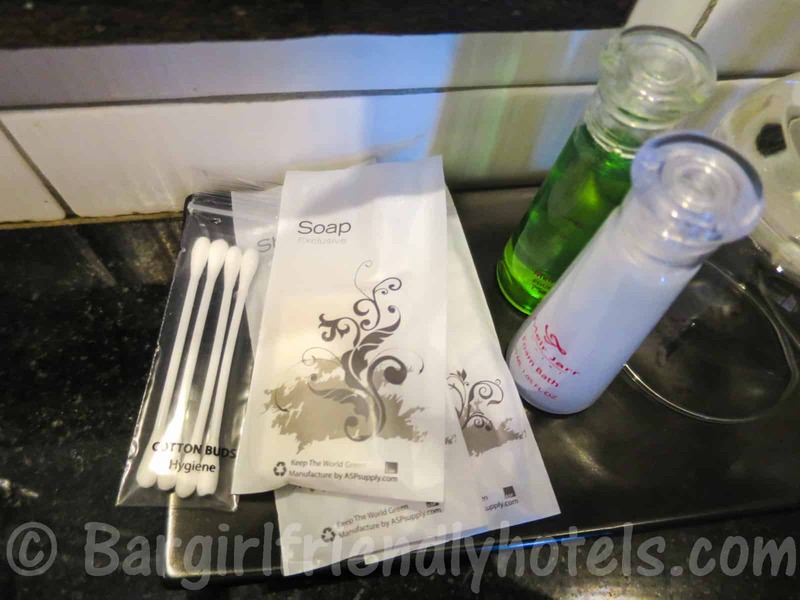 While maybe not the most up-to date, the room was very clean and kept that way by the cleaning staff with new fresh linen for the big double bed changed on a daily basis as well as the complimentary water bottles and toiletries. All the basic amenities were covered besides the in-room safe (although one is available for free at the 24-hour reception) and perhaps a modern flatscreen-TV, on a positive note the small CRT TV model did have loads of international channels to chose from and a DVD player was available, air-con unit was efficient and quiet, mini-bar had a decent selection of drinks at these prices and a room service was available from their restaurant (good food btw) if you needed anything else, the bathroom has only shower in a wet room but there was always plenty of hot water, room also had a balcony overlooking the pool. Staff very friendly and no issues bringing back bargirls picked-up in Bangla road to the room. In the end, good value for the price I paid. 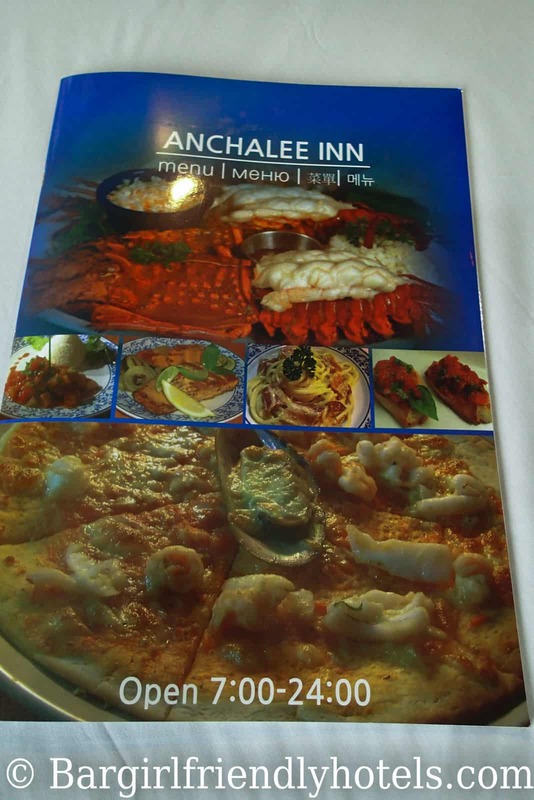 Last Date Visited: Pictures of the Anchalee Inn Hotel were taken during my last visit in March 2014 and reflect their second cheapest accommodation on offer found Online : “The Deluxe Room”. 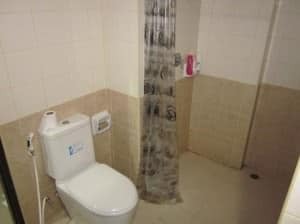 PROS: Quiet location, nice little pool, very friendly staff, nice restaurant, good price for value ratio. 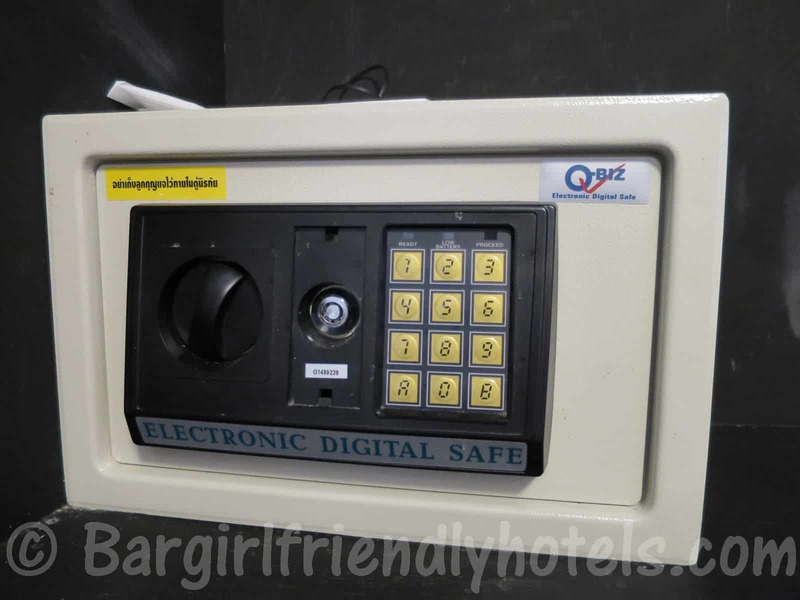 CONS: No in-room safe but available at the 24-hour reception, Older generation CRT TV. Guest Friendly policy reply by the Anchalee Inn: "We require that they leave an ID card at the reception desk. We do not ask for any extra charge and you can bring any "joiner" any time you like.. Richard, General Manager". 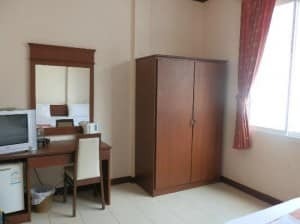 The Apsara Residence has a very strategic location along Soi San Sabai, 3 minutes walk from Bangla Road where all the nighlife goes on, Patong beach only another 5 to 8 mins away from there and with the Jungceylon Mall (biggest shopping mall) & Bangla boxing stadium right around the corner. Housekeeping are great, did a great job cleaning up the mess I left every day. Staff and Belgian owner also very friendly, made sure I was comfortable and asked if I required anything also kept my iPhone & laptop charger I had forgotten in the room for later restitution. Room aren't the biggest but very clean and well maintained with a big bed at it's center, the sheets were of good quality and the mattress very comfortable, air-conditioning was more than adequate for the room size, flat screen TV had a proper selection of international channels, Wifi was stable & fast, small bathroom attached to a hot shower with basic free toiletries provided, mini-bar stocked with drinks that weren't ridiculously priced, iPhone docking sound-bar next to the bed, wardrobe with safety box inside. Room also has a tiny balcony that was barely enough to peek your nose outside. The only downsides is it can get noisy with all the the bars nearby going on through the night, get some earplugs if you are an early sleeper, also there is no lift. Staff are great and no problem with bringing back bargirls back as long as they can provide some ID at reception, very girl friendly hotel. Last Date Visited: Pictures of the Apsara Residence were taken during my last visit in March 2014 and reflect their cheapest accommodation on offer found Online : “Standard Double Room”. 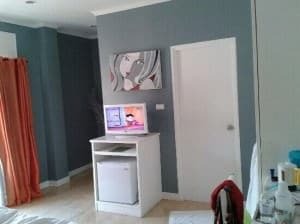 PROS: Very close to everything, quick Wi-Fi in room (up to 30 mbps! ), Nice bedding, kept very clean. CONS: Room can be a bit noisy due to location, no elevator, tiny balcony. Guest Friendly policy reply by the Apsara Residence: "Regarding your request we can inform you that at Apsara Residence we have a JOINER FREE policy. It mean if you stay ALONE in a room you can take ANY guest, FREE of charge inside your room. For your and our own security we will ask your guests ID card. Best Regards, Gunter Willemaerts Manager/Owner". The Aspery Hotel is located in a nice and quiet area of Patong just a few minutes walk from one of the best parts of the beach. While not exactly right next door from Bangla Road it's still very accessible on foot anywhere and will take you anywhere from 10 to 15 minutes to get there at a normal pace. 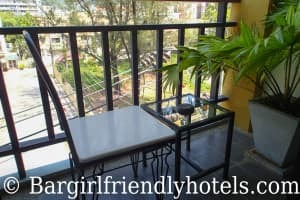 The rooms are clean, modern and have a little balcony. 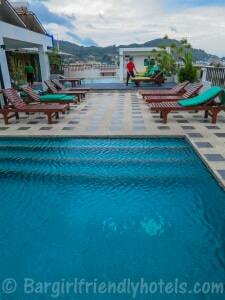 I liked their rooftop swimming pool quite a lot, nice spot to cool down and sunbathe in Phuket’s steamy weather. 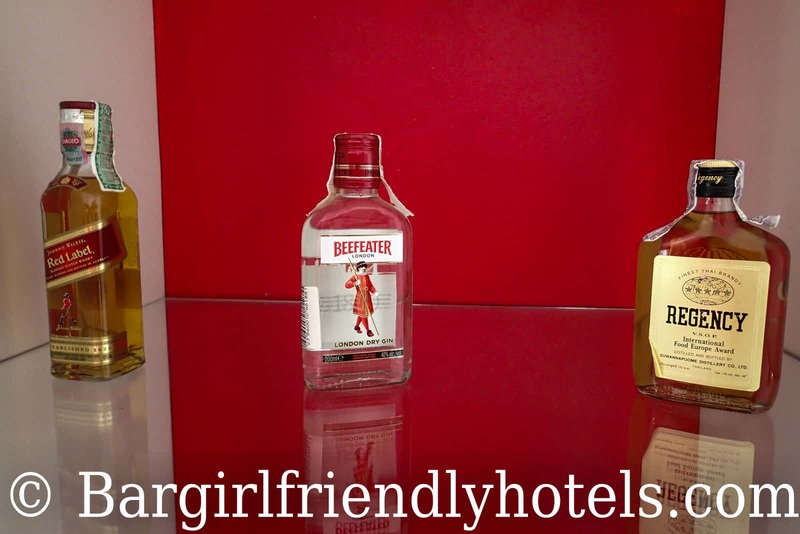 The Aspery Hotel is also very girl friendly, tested their policy and had no problems with bringing back this Tiger Beer bar girl to my room. Winner of TripAdvisor's Certificate of Excellence 2013 award. Overall good experience here, I had a Classic Room in the new wing of the hotel which was modern and clean equipped with new furnishing: Comfortable king size bed with crisp white sheets, nice LCD TV & DVD player with a good English speaking selection of channels, the A/C was efficient and could be easily controlled via remote, in-room safe and a closet to hang your clothes, small desk with chair and lamp, Wifi signal was good, kettle with tea/coffee making facilities, modern bathroom consisting of a toilet and generously sized shower with excellent water pressure, basic toiletries, the room also has a balcony to allow you to easily dry off your clothes after coming from the beach. Excellent room/cleaning service. Last Date Visited: Pictures of the Aspery Residence were taken during my last visit in March 2014 and reflect their second cheapest accommodation on offer found Online : “The Classic Room”. 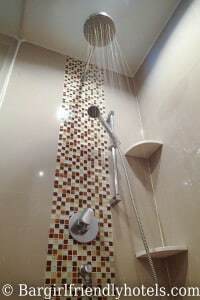 PROS: Good value, clean & modern rooms, nice little pool on the rooftop, Awarded TripAdvisor's Certificate of Excellence 2013. 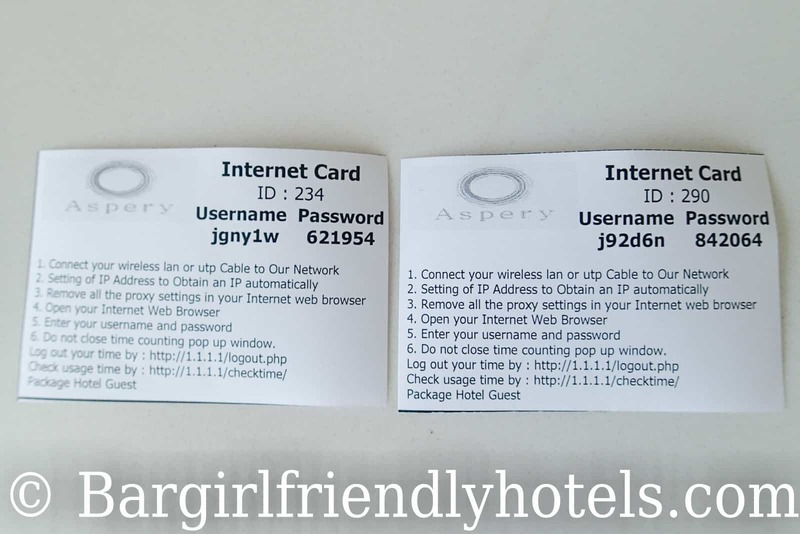 Guest Friendly policy reply by the Aspery Hotel: "We pleased to inform you that we are no longer charging for joiner fees. Ann Michelle Cacar (Ms) RSVN Officer". The Bliss Hotel is located at the southern end of Patong, right across from the beach and around a 10-15 minute walk from Bangla Road. 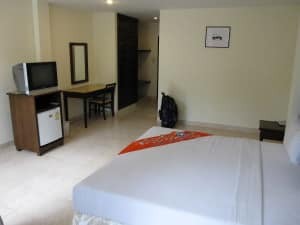 Starting at 32 sq.m even the cheaper Sea View category rooms are decently sized, come furnished with modern amenities and have a private balcony overlooking the beach. Facilities include two pools,one smaller at the front facing the sea and a bigger and more private pool in the back. Staff were great and very easy going with security bringing back bargirls overnight, not the cheapest of places but good all around, awarded again the Trip Advisor's Certificate of Excellence in 2018. 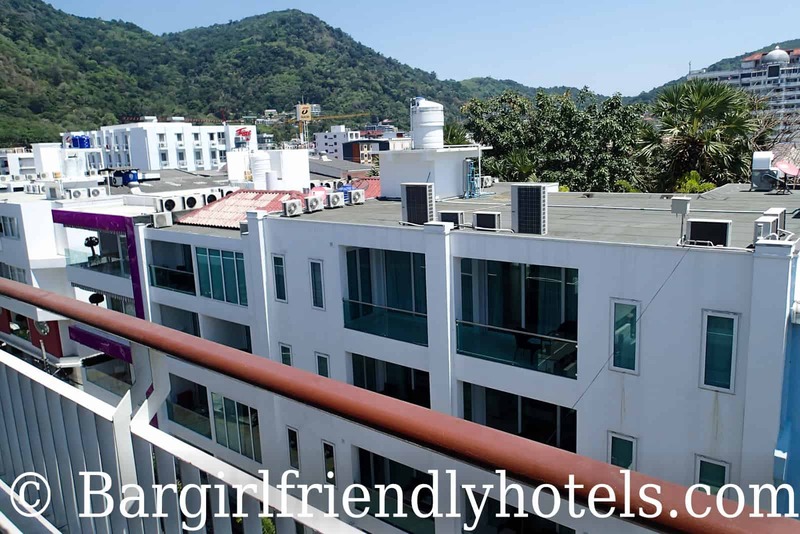 PROS: Quiet location, right across from Patong beach, two pools, rooms are spacious and modern, balconies overlooking the beach and pool, awarded Trip Advisor's Certificate of Excellence 2018. 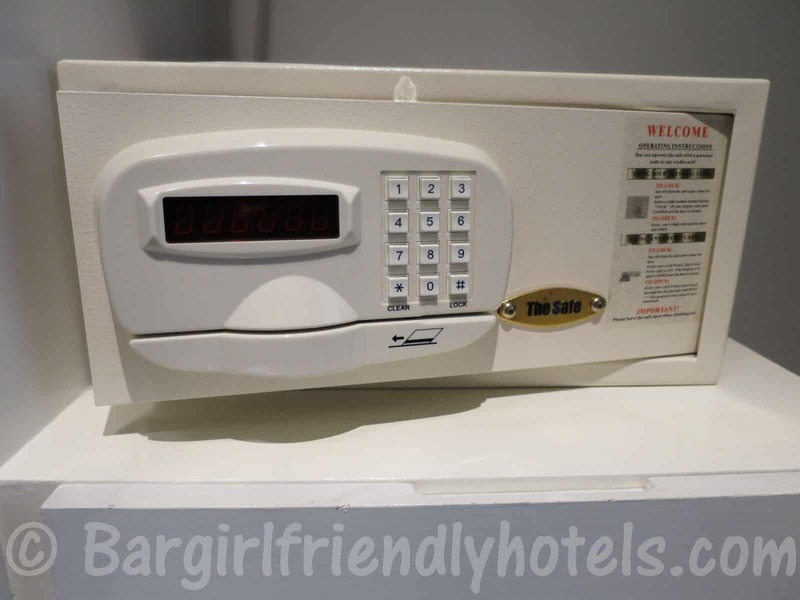 Guest Friendly policy reply by the Bliss Hotel South Beach Patong: "We would like to inform you that hotel do not charge for a visitor or joiner fee but they have to provide ID CARD for security reason but other facilities of the hotel are prohibited to them. Best regards, Natthanicha Art-on (Anna) -Reservation Manager". 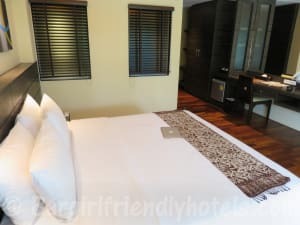 The Centro Hotel @ Sansabai (Previously Phil Boutique Hotel @ Sansabai) is located right in the heart of Patong, Bangla road is a stones throw away and the beach an easy 5 minutes walk through it. The Jungceylon shopping center, fresh market and tiger boxing stadium are also just around the corner so no need for tuk-tuks to get around if you plan on staying here. 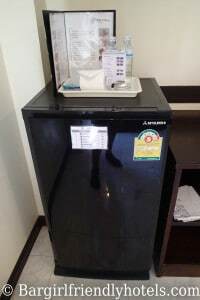 Since the Centro Hotel is a very small hotel with only 24 rooms their facilities are quite limited, they have no bar or restaurant but being on Soi Sansabai everything is available right at your doorstep, there is a big fridge at the reception full of cold drinks for sale if you don't want to walk to the 7/11 or FamilyMart 2 minutes away. Guests do have access to a rooftop pool (they have two pools actually) with bar/restaurant from the We [email protected] just next door. 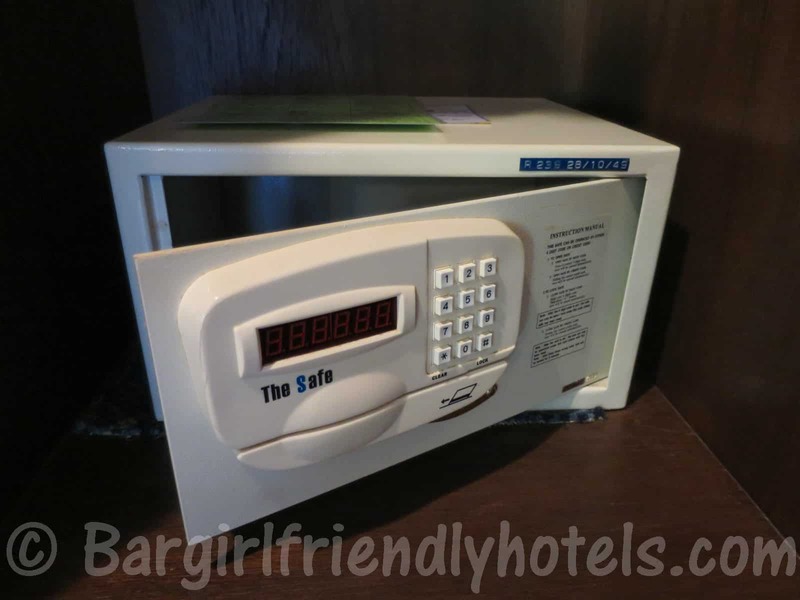 The reception staff and two owners are very helpful and have no problems with guests bringing back joiners, I tested their policy with this Thai girl picked up at Tai-Pan Disco and can confirm the Centro Hotel @ Sansabai is indeed girl friendly policy. 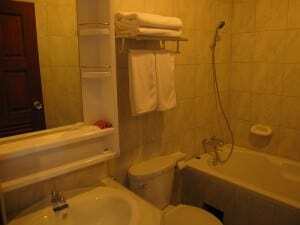 The Deluxe room I booked was perfectly fine, small as expected for the price but very clean. Amenities include a comfortable Queen sized bed, LCD TV with around 50 channel of which 10 or so were in English, A/C unit with proper wall mounted control, mini bar with 2 free bottles of water, free Wi-Fi with excellent signal, small in-room safe (don't expect to fit a laptop here), large wardrobe, cushioned bench near the window, small balcony with just enough rooms for 2 plastic chairs and a table overlooking soi Sansabai where you can enjoy a beer and watch the world go by, spotless bathroom with a walk in wet room type powerful shower and a basic set of toiletries, kettle for coffee/tea and beach towels. The housekeeping was good and the rooms were thoroughly cleaned every day, including all the bedding. 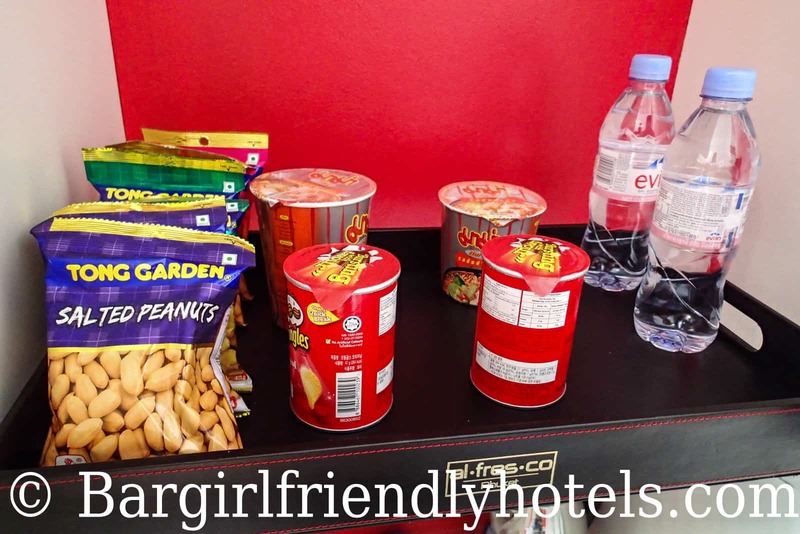 Overall, Centro Hotel @ Sansabai is good value for money if you are on a budget and looking for somewhere decent to stay without burning a hole in your pocket. Don't just take it from me, TripAdvisor has again awarded them their Certificate of Excellence in 2014 . 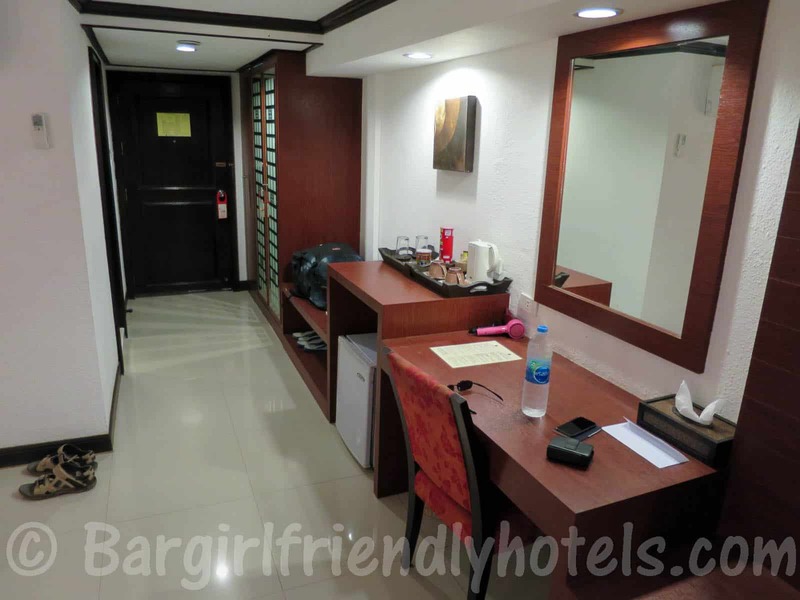 Last Date Visited: Pictures of the Centro Hotel @ Sansabai seen here were all taken during my last visit in September 2014 and reflect the only room category the hotel : “The Deluxe Double Bed”. 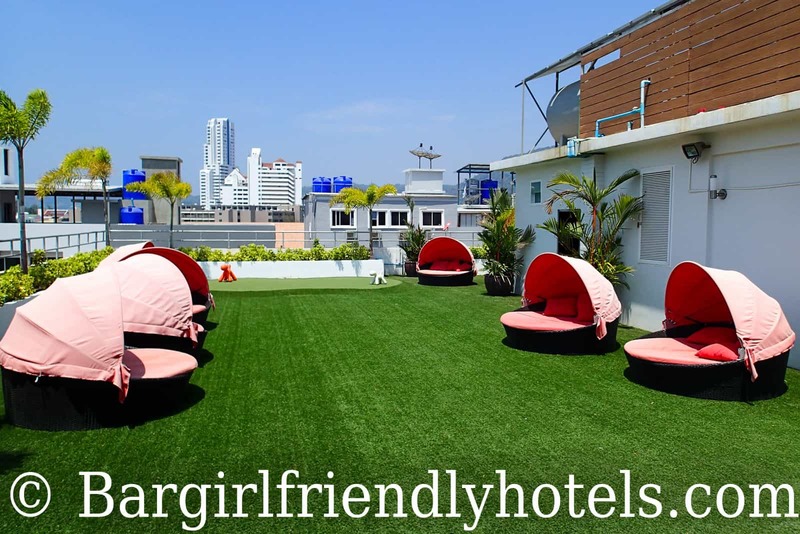 PROS: Awarded TripAdvisor's Certificate of Excellence 2014, Central location right next to Bangla Road, little balcony overlooking soi Sansabai, 10 mins walk to the beach, value for money, one of the lowest priced hotels in it's category on soi Sansabai. 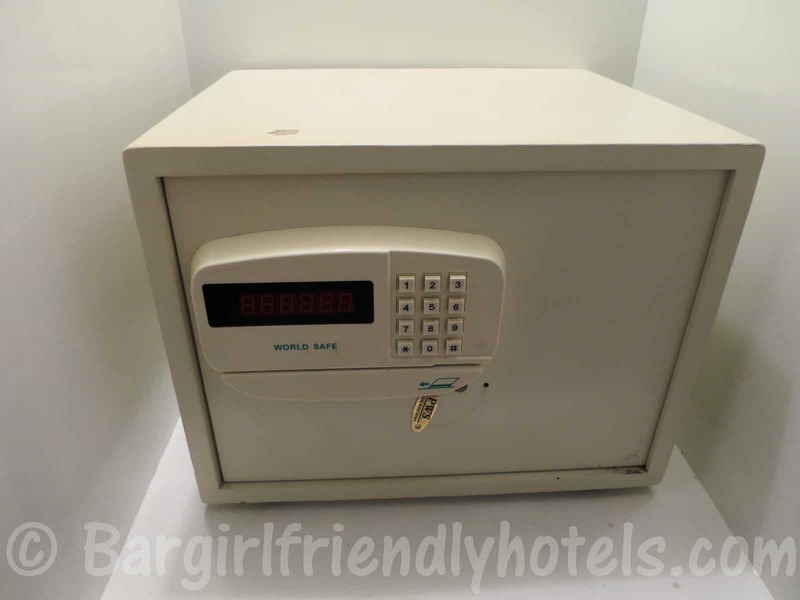 CONS: Some room furnishings could do with a refurb, very small safe, no bar or restaurant. 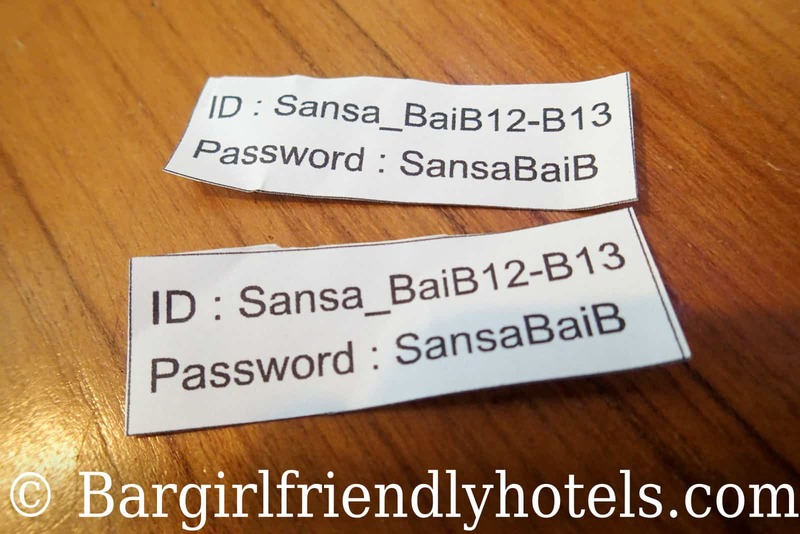 Guest Friendly policy reply by the Centro Hotel @ Sansabai: "Thank you for contacting us, nice to hear from you Greetings from [email protected], yes, we are still guest friendly hotel Thank you". The Coconut Village Resort is ideal for those looking for something on the quieter side of town with an easy access to the beach just 5 minutes away. Getting to Bangla is a bit more of a stroll, a good 15 to 20 minutes walk via Beach Road and while it's relatively easy to get there during the evening, getting back is often another story after a few many drinks so a motorbike or tuktuk driver could be needed. 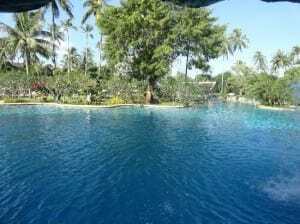 The resort offers a peaceful environment surrounded with coconut trees and greenery, their pool area is particularly attractive with a deep swimming pool (2.7m), Jacuzzi & bar. Definitely a great place to grab a drink, swim and unwind during the day. 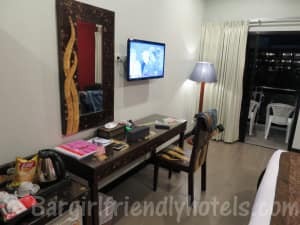 The overall service was ok, nothing to complain about, staff was friendly and no issues with the front desk at night bringing back bargirls, the Coconut Village Resort is confirmed girl friendly! I tested their policy with this Thai girl freelancing at Tiger Disco. There is however a sign at the front desk stating that joiners are 600 THB but no need to worry, after inquiry that's only if you go over the room capacity. While at the time of my booking on Agoda all the rooms were good for 2 people, do make sure you don't book a "single room promo" that pop up at some hotels offer from time to time. 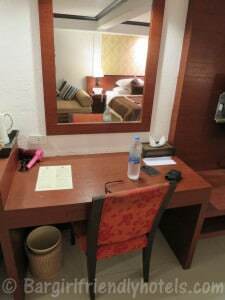 I was very happy with the Deluxe Room I booked, the place felt quite cozy and had lots of space. The rooms are clean, well-maintained and come furnished with: a nice big bed to sleep in, flat-screen TV with many English speaking channels, a mini-bar just under it with a limited selection of drinks at these prices, air-conditioning unit that did it's job, in-room safe that's big enough to store a small laptop and other digital gadgets, plenty of wardrobe storage space, Tea/coffee making facilities, little desk & seating area and a private balcony that looks out to either the pool or courtyard depending of the room location, WiFi is only for free in common areas but can be purchased at the front desk. 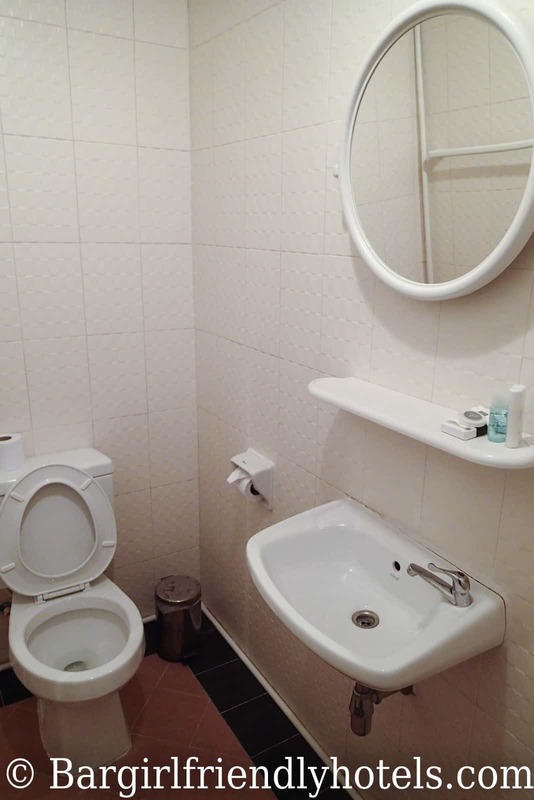 I found the bathroom to be sub-par compared to the rest of the room standard and could do with a little refurb to get more modern fittings, it comes is equipped with a bath/shower and offers the usual free toiletries next to the sink. 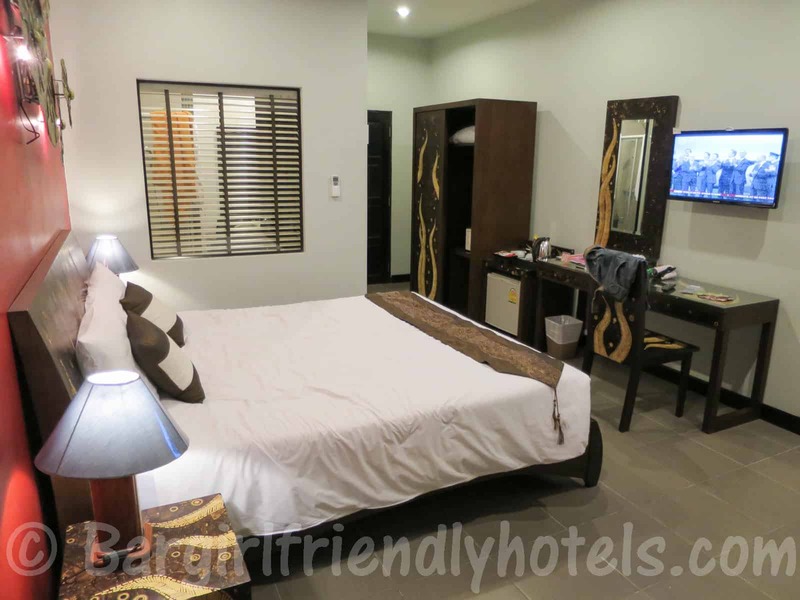 Last Date Visited: Pictures of the Coconut Village Resort seen here were all taken during my last visit in September 2014 and reflect one of their mid-range category rooms on offer found Online : “Deluxe Room”. 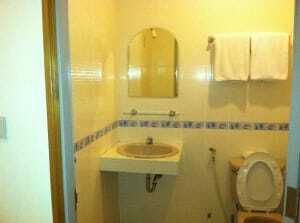 PROS: Easy acess to the beach, nice big rooms, nice deep swimming pool (2.7m) with bar, friendly staff, very clean, quiet. 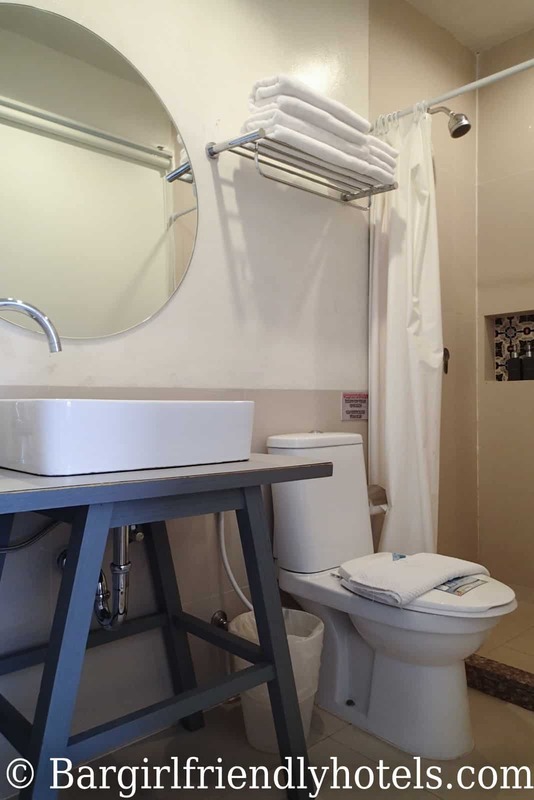 CONS: No free Wi-Fi in room only common areas (some rooms have signal others not near pool/reception) otherwise need to pay, 15-20 mins walk from Bangla Road, bathroom in need of upgrade. 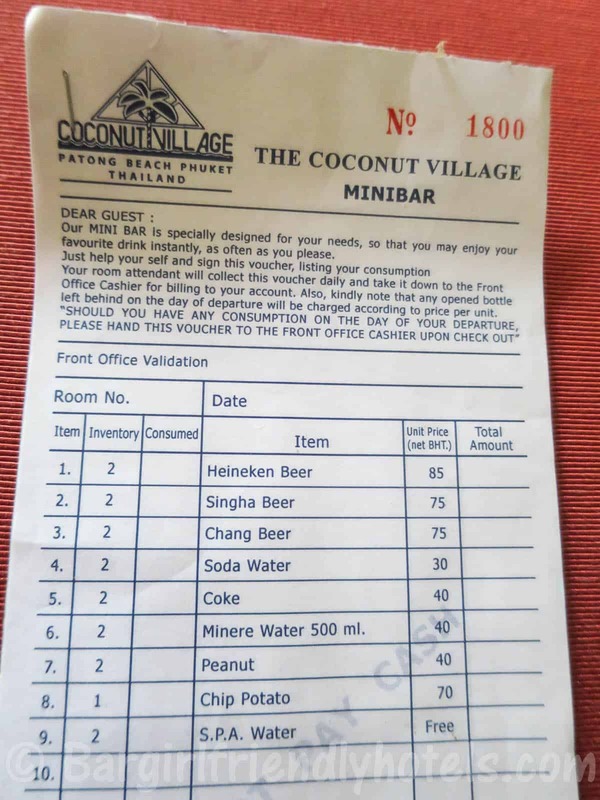 Guest Friendly policy reply by the Coconut Village Resort: "Dear Sir, If you booked the room for 02 person but you come alone on checkin no pay for joiner fee. Best regards, Saroj S". Last Date Visited: Pictures of La Vintage Resort seen here were all taken during my last visit in November 2016 and reflect the only room category the hotel has Online : “The Deluxe Studio”. 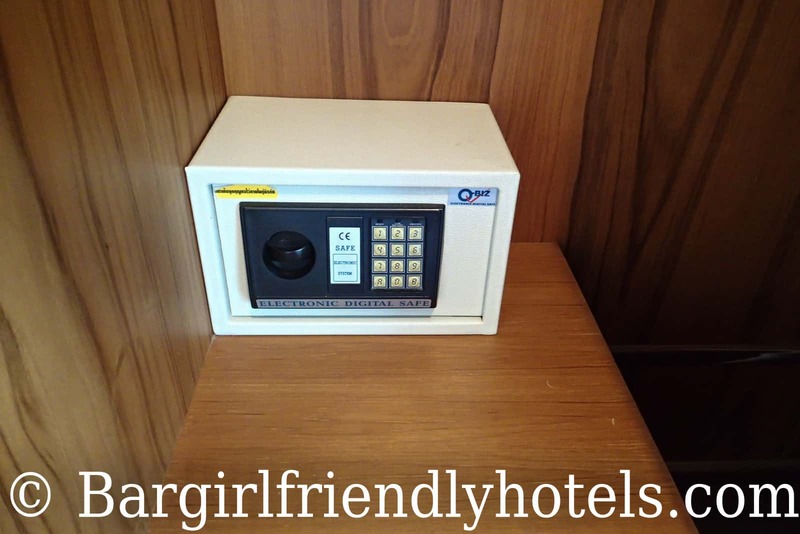 Guest Friendly policy reply by the La Vintage Resort: "Joiner fee if you stay 1 person in room Hotel no charge for.If you stay 2 persons in 1 room then 3rd person joiner you have to pay 500.- (first time only) at reception : Lady have to keep ID card at reception every body. Ann". 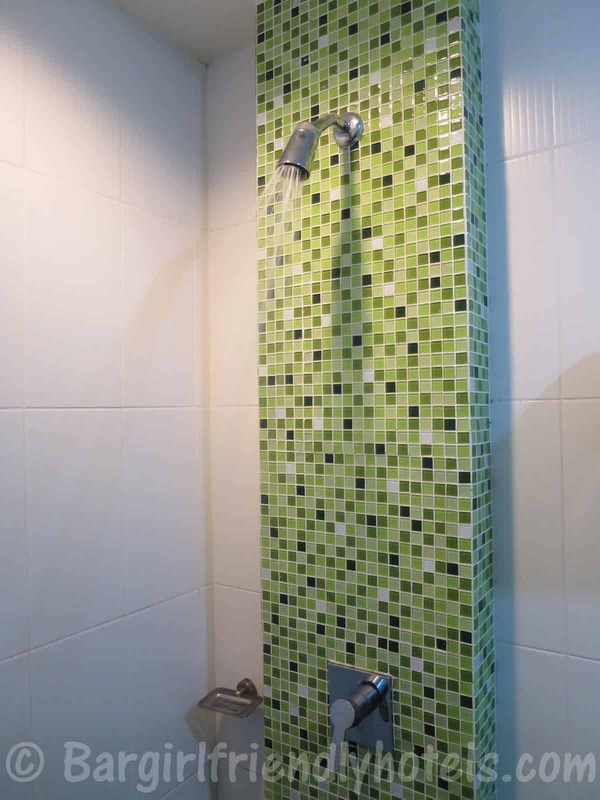 The Meir Jarr hotel is a new modern property that offers 70 nicely designed rooms. 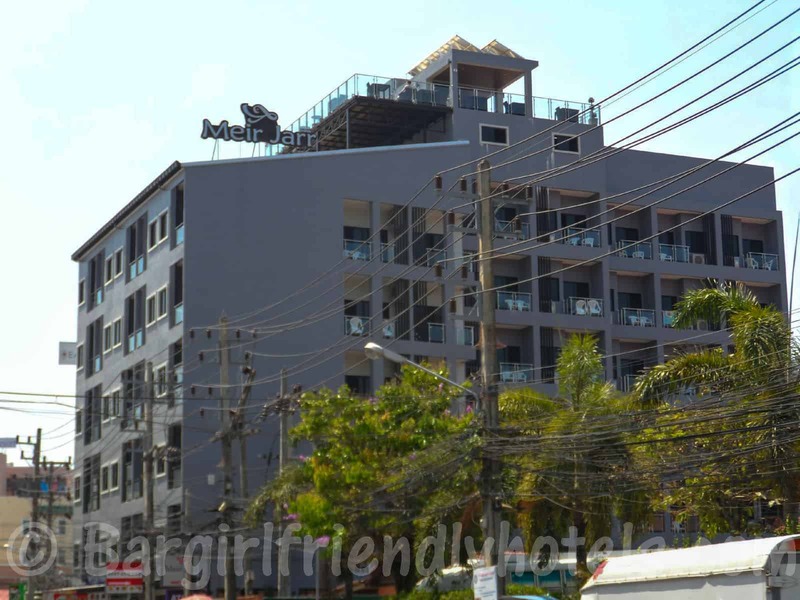 Recently opened in the fall of 2013 it is located just 2 minutes away from the Hard Rock Café (as seen from rooftop pool area), 5 minutes walk from Patong beach and 10 to 15 from Bangla road. 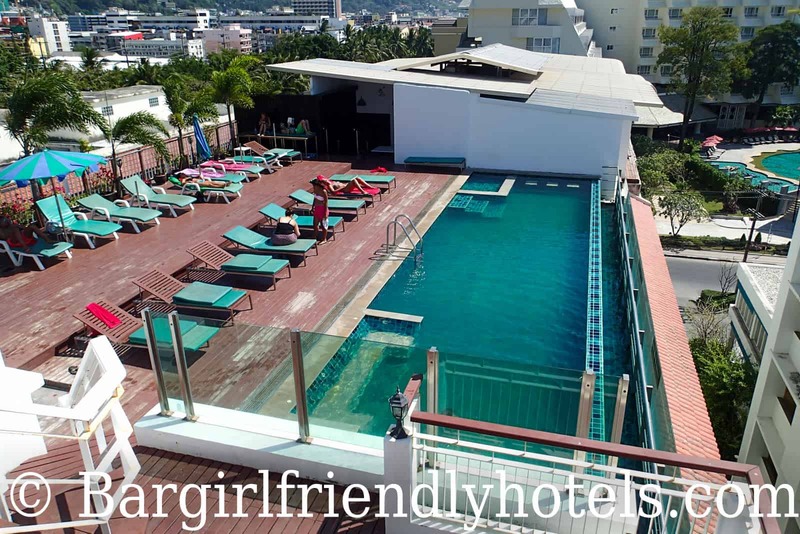 The hotel facilities include a nice little infinity pool and bar on the 7th floor that's offer a lovely view of the beach and surrounding Patong. Great place to relax on a sunbed with a drink in your hand from the bar or get some food from their restaurant delivered at one of their terrace tables. 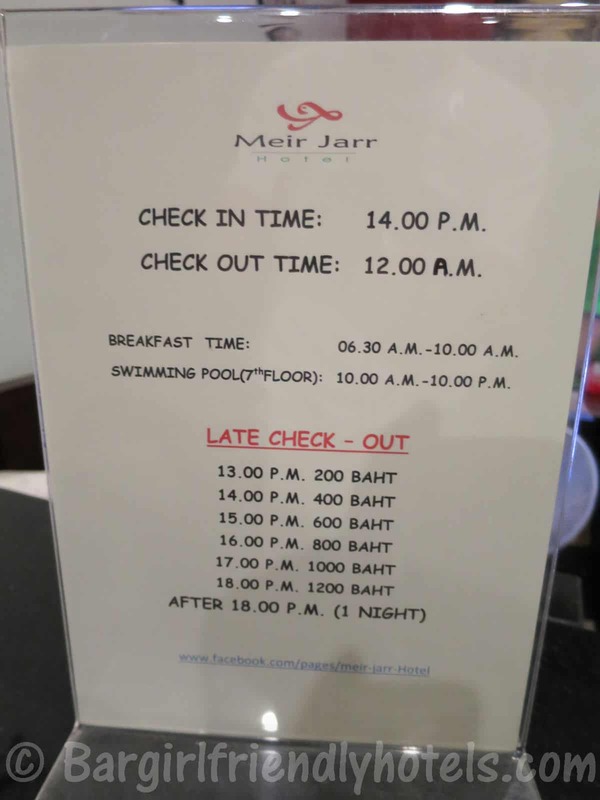 Staff at the hotel were both efficient and friendly, never had any problems neither with the reception personnel showing up with overnight guests late at night so the Meir Jarr hotel is definitely in the girl friendly category. 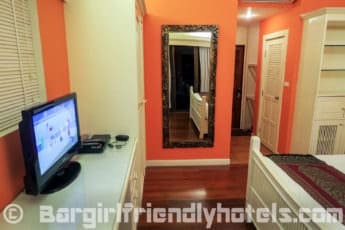 I stayed in one of their Superior rooms and although a little on the small side, it's still perfectly adequate for solo travelers who plan on bringing back a late night companion. On the other hand if you are looking to host some parties with friends & a few ladies you better look elsewhere or upgrade to their deluxe catergory which is more roomy. 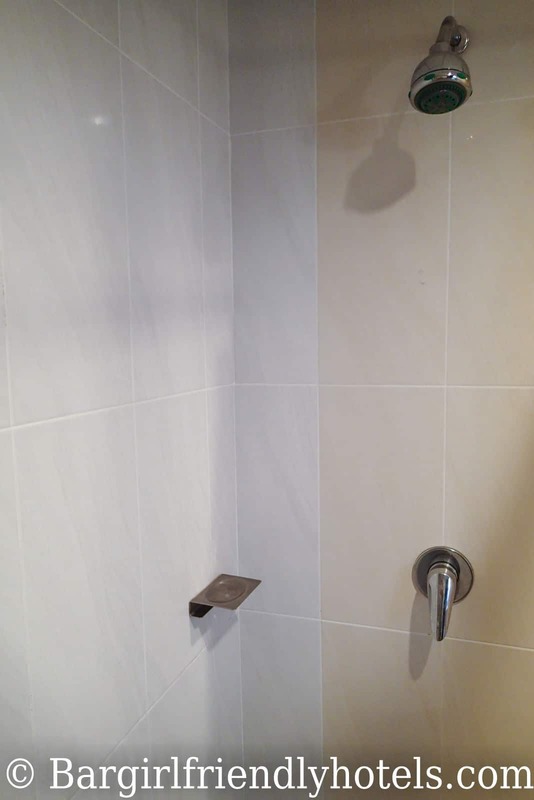 As the Meir Jarr Hotel is brand new, everything is spotless and you can see that quite some detail has been put into the designing and decoration of the rooms. Amenities include: Queen-sized bed with a little couch next to it, 32" flat-screen TV offering a decent enough selection of international channels, minibar with a limited selection of drinks at these prices (a 7/11 is just across the street), medium sized electronic safe that could fit my laptop & other electronic gadgets, great air-con unit located on the ceiling just on top of the bed, Free WiFi (not really impressed here with the signal often dropping), lots of storage space in the wardrobe, table and chair, kettle with free water/coffee/tea/sugar resupplied daily, small balcony with two chairs if you need a little fresh air or sample the outside temperature, nice modern bathroom with shower that comes with the usual set of free toiletries. Housekeeping did a brilliant job, rooms were cleaned daily with fresh towels, sheets, shampoo, etc. I liked their late check out options by the hour, sometimes after a night out few extra hours sleep go a long way! In the end very pleased with my stay, what you see on the booking website is exactly what you get so if you like don't hesitate to book. Last Date Visited: Pictures of the Meir Jarr Hotel seen here were all taken during my last visit in September 2014 and reflect their mid-range category rooms on offer the: “Superior Room”. 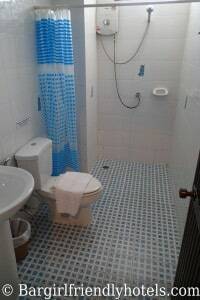 PROS: New property, modern rooms, nice rooftop infinity pool with bar & restaurant, lots of plugs available in the room to charge your electronic gadgets, good staff and housekeeping. 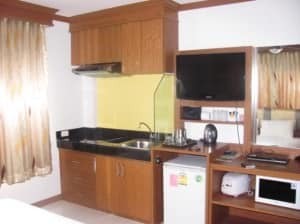 CONS: Wi-Fi signal, rooms not too big, only 6-7 sunbeds right at the pool for people but more in the back. 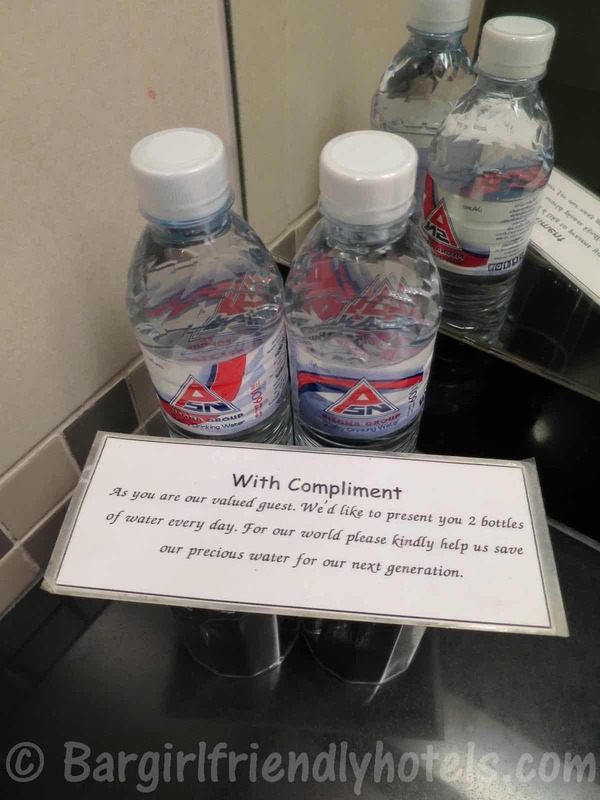 "Dear Sir, Greeting from Meir Jarr Hotel. We do not have a joiner fee. Best Regards, Reservation Dept". The Patong Bay Garden Resort's location simply can't be beat! Right on the beach and only a minute's walk from all the action on Bangla road, it just doesn't get any better than this !!! 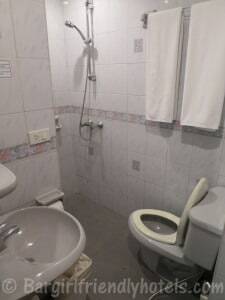 The hotel facilities are quite good, maybe not the most up to date but nothing in the way of having a pleasant stay. The interior courtyard was particularly nice with a big swimming pool overlooking the ocean and a double-story bar/restaurant right at the beachfront. I found it to be a great place to relax on a sun lounger after a night out drinking. The overall service was fine, the girls at the reception were cordial but not overly, staff at the bar/restaurant were much friendlier. 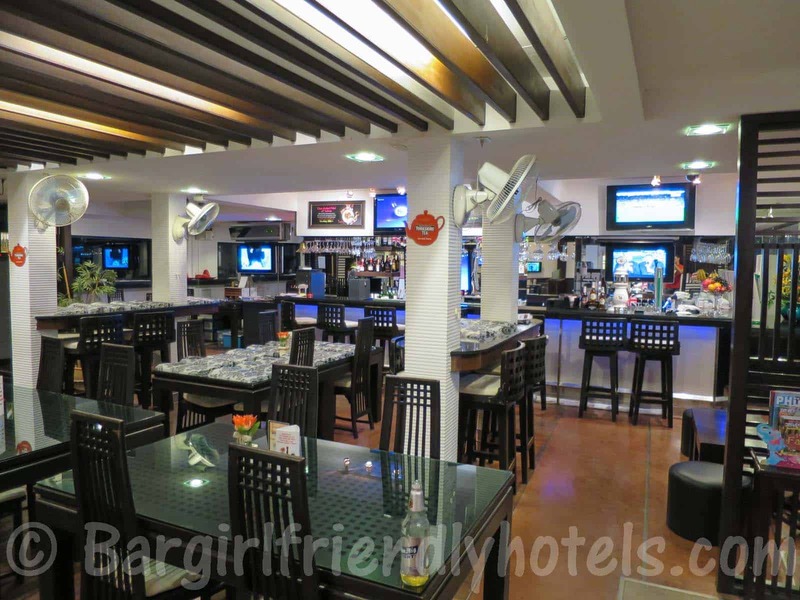 No issues with bringing bargirls (sometimes twice during the course of a night) back to the room, I tested their policy and the Patong Bay Garden Resort is confirmed girl friendly, just drop her ID card and off you go, no questions asked beyond room number. I booked the Deluxe Room Balcony and was very happy with it, lots of space and well appointed with: Comfy king size bed, big new flat-screen TV with around 50 channels to chose from, properly stocked mini-bar with 2 free bottles of water a day but the rest of the drinks are charged at inflated prices (Family Mart just next door fixes that), good A/C unit, big safe with plenty of room for a laptop and other electronics, you will also find lots of electrical outlets in the room to charge all your gadgets, free Wi-Fi with a really good signal, table next to the bed, a sofa that has seen better days on the other side, balcony with chairs and table overlooking the courtyard & swimming pool with partial view of the ocean, small desks with chair, modern bathroom with generously sized shower (great water pressure) and your typical free toiletries of soap/shampoo/Q-Tips and a Coffee/tea maker to start your day. 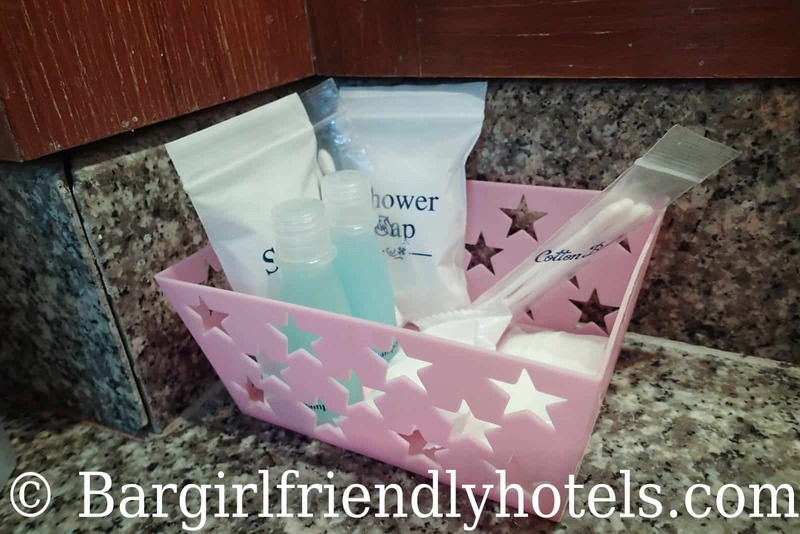 During my stay Housekeeping did an excellent job with keeping everything clean and tidy. 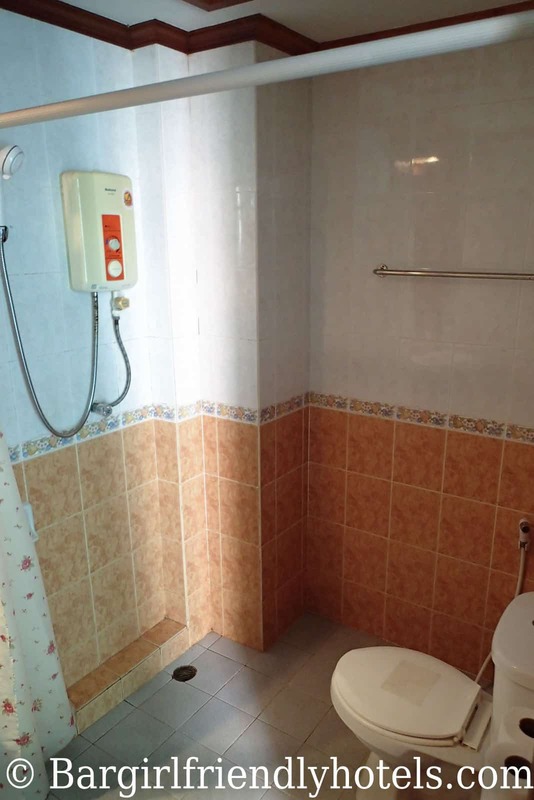 Room could do with a new fresh coat of paint but overall good experience, you can probably get a nicer resort for the same price but you won't have this prime location where everything is available on the doorstep, feel like a walk on the beach? The sand touches the hotel. A swim in the pool? 15 seconds and your in. 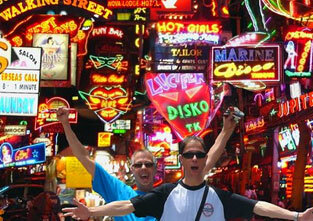 A drink on Bangla road? Within a minutes walk you are there. 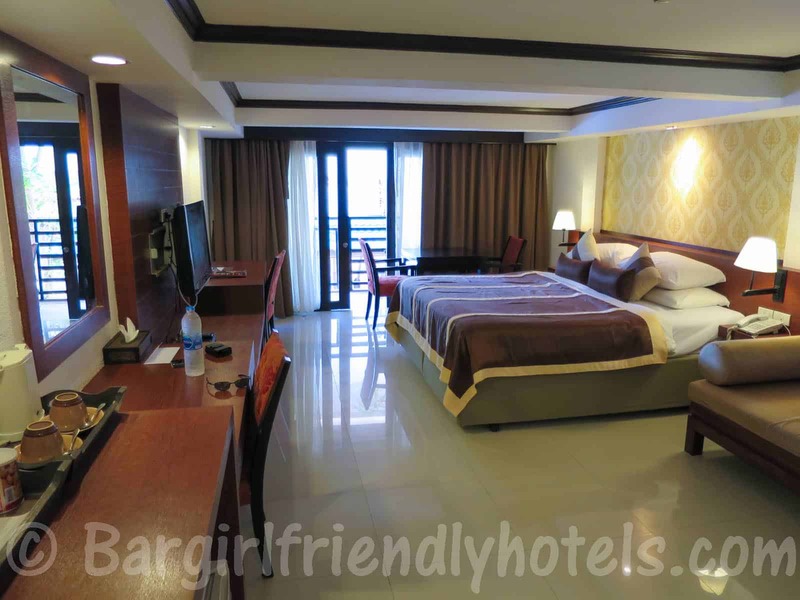 Last Date Visited: Pictures of the Patong Bay Garden Resort seen here were all taken during my last visit in September 2014 and reflect their mid-range category rooms on offer found Online : “Deluxe Room Balcony”. 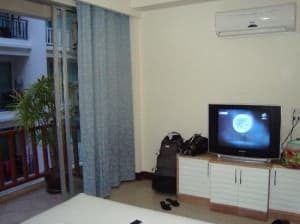 PROS: Right on the beach, 100 meters from Bangla road, quiet at night. CONS: Pool closes a little early at 7PM, staff at bar/restaurant/pool friendly but girls over at reception hit and miss. 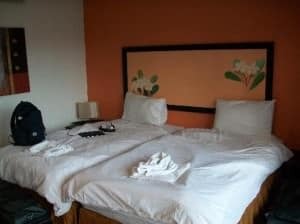 Guest Friendly policy reply by the Patong Bay Garden Resort: "Dear Sir, Actually if you reserved the room for 2 pax and you come alone. You can have 1 lady come to join with you. Sincerely Yours, thank u Miss Chonticha P. Reservation". 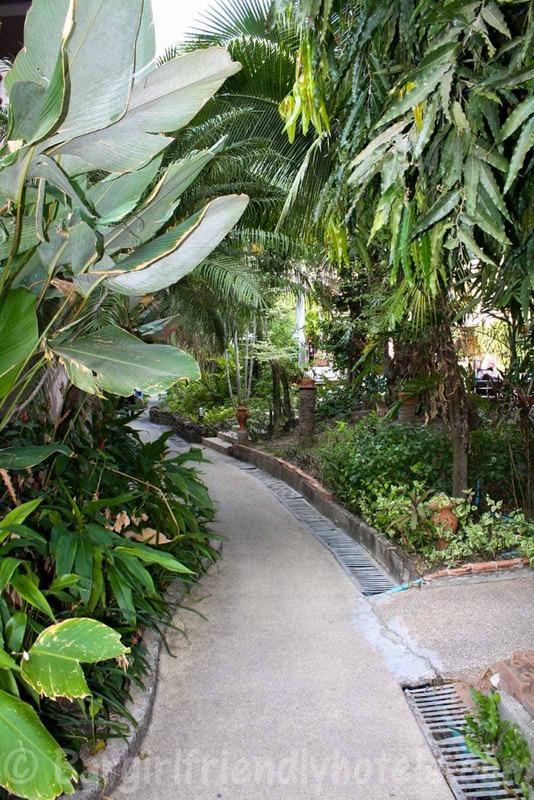 Tucked down an alleyway between the main roads (Rat-U-Thit & Beach rd), The R Mar Resort and Spa manages to offer a little oasis of peace and tranquility right in the heart of Patong. 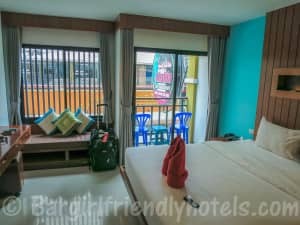 Located only 250 meters from the beach and Bangla road the hotel is spacious and well maintained, I particularly loved their pool area with a huge lagoon shaped swimming pool and bar serving food/drinks throughout the day, really a great place sit back and relax on a sunbed recovering from the previous night out. 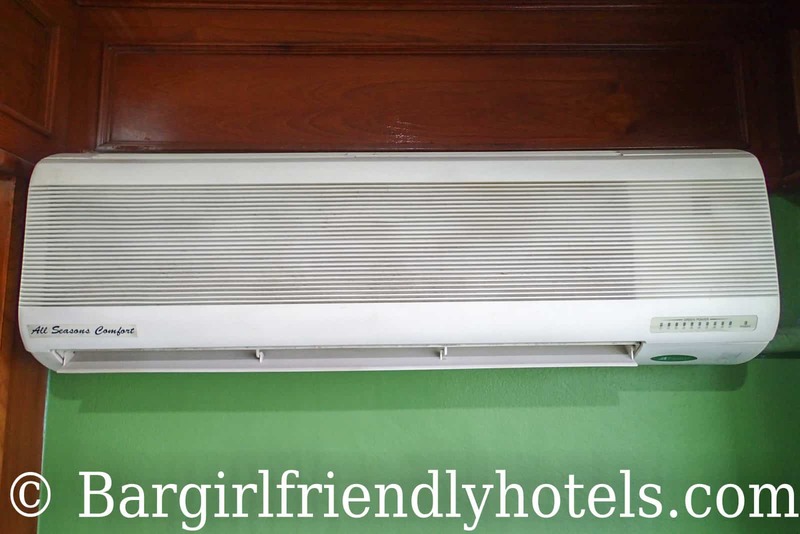 The staff is very friendly and helpful, same goes with the guys behind the reception desk whenever I would show up with a bargirl from Bangla road, dealing with overnight guests was always a breeze so the R Mar Resort and Spa is certified girl friendly! I was very happy with the deluxe room I booked, spacious and elegantly decorated with dark wood furnishing it was exactly just how it looked in the pictures on their website. 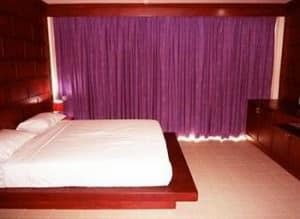 The room facilities include an extremely comfortable king size bed, large flat-screen TV with selection of international movie/news/entertainment channels, big safety deposit box that can fit a laptop, good air-conditioning unit, Free minibar (replenished daily with 2 chang beers, 1 coke, 1 sprite, 1 fanta and 2 water bottles), bedside control panel operating the room's TV, lighting and temperature, fast Wi-Fi (but only works with one device at a time), electric kettle with Tea/Coffee, en suite bathroom with a bathtub/shower and a proper selection of free toiletries, seating area and desk, big wardrobe with lots of place for your stuff and a large balcony to sit and have a few pre-going out drinks. 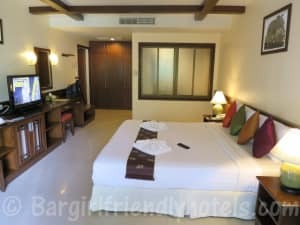 Overall I had an extremely pleasant stay at this hotel, lots of positives here: Only a few minutes walk from Bangla but still very quiet once inside the resort, big pool, modern rooms, very pleasant staff, good housekeeping, HIGHLY RECOMMENDED! 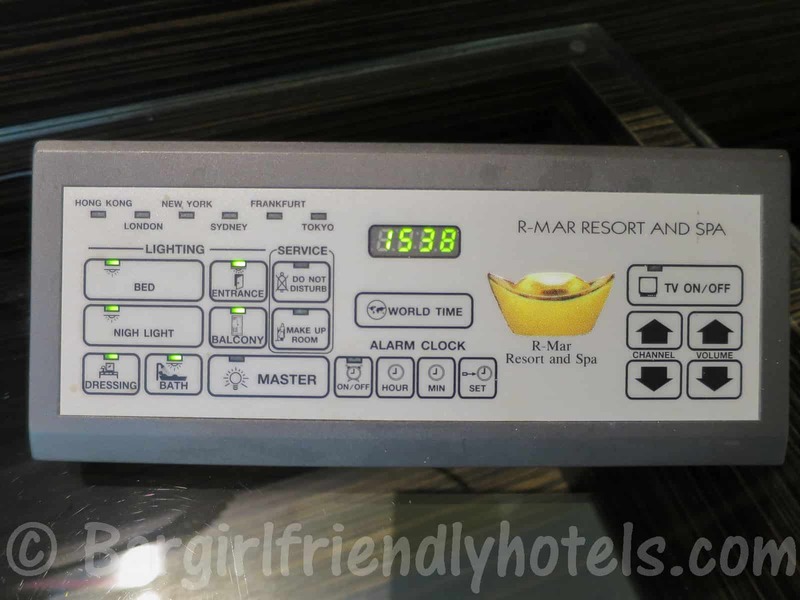 Last Date Visited: Pictures of the R Mar Resort and Spa seen here were all taken during my last visit in September 2014 and reflect their mid-range category rooms on offer found Online : “The Deluxe”. 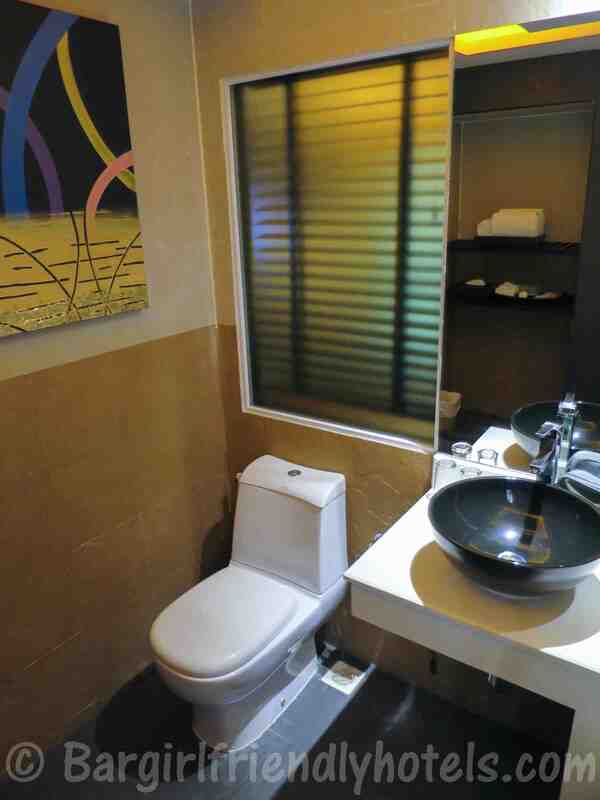 PROS: Modern rooms, free min-bar, fast wifi, Central location, quiet once inside the resort. CONS: Good wifi signal but only once device at a time, shower tends to spray onto the floor but it drains quickly. Guest Friendly policy reply by the R Mar Resort and Spa: "Thank you for your request and for considering our hotel for your stay in Patong. There are no fees for joiners, they can stay overnight in your room for free. Best regards Philippe, co-owner". Last Date Visited: Pictures of the Royal Royal Phawadee Village Patong Beach Hotel were taken during my last visit in November 2016 and reflect their mid-range accommodation on offer found here Online : “Deluxe Room”. 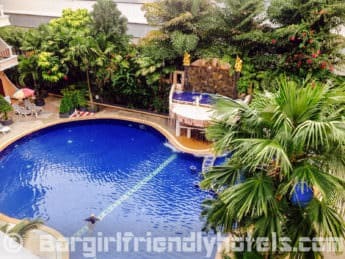 PROS: 2 mins walk from the beach and under 10 mins from Bangla Road, Resort is designed in traditional Thai style, lush tropical grounds with big pool, great staff, from Superior & up rooms are very nice. 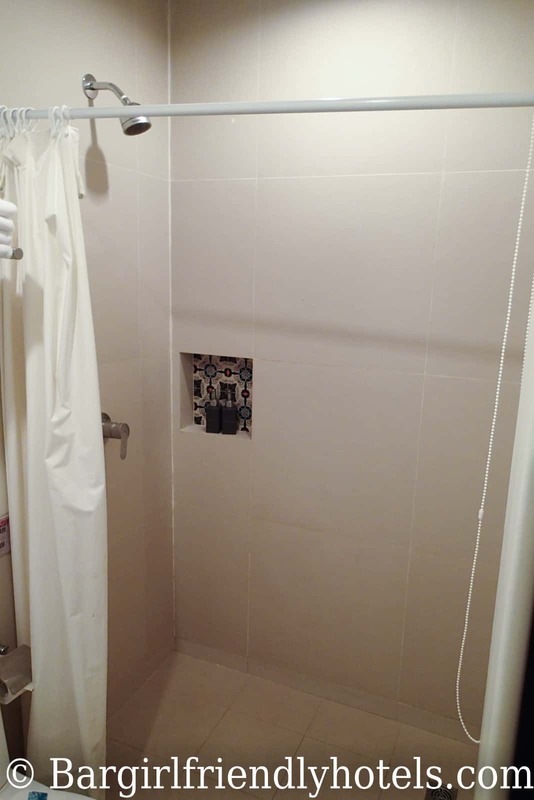 Guest Friendly policy reply by the Royal Phawadee Village Patong Beach Hotel: "Yes, you can book a room and come alone than we do not charge a joiner. We look forward to welcoming you to Royal Phawadee Village. Kind regards, Chutiman Nukrak Reservation". 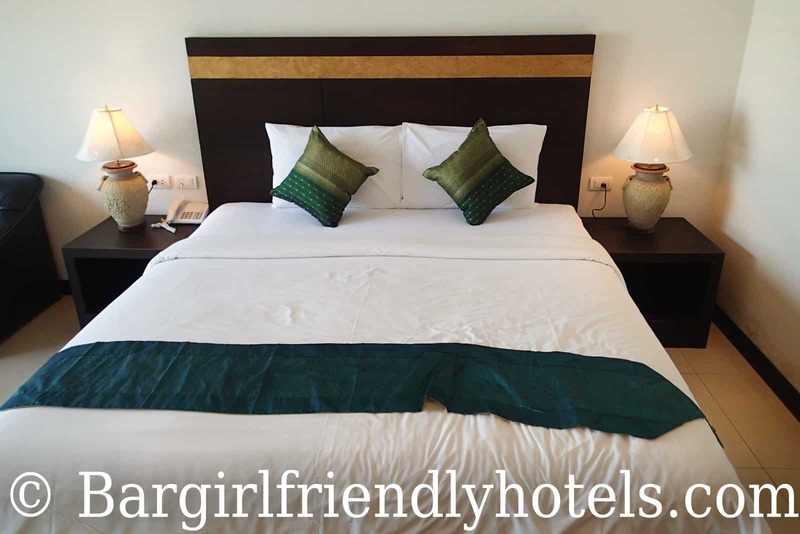 The location of the Safari Beach Hotel is superb, at the corner of Bangla Roand and just opposite to the beach you just couldn't ask for any better. 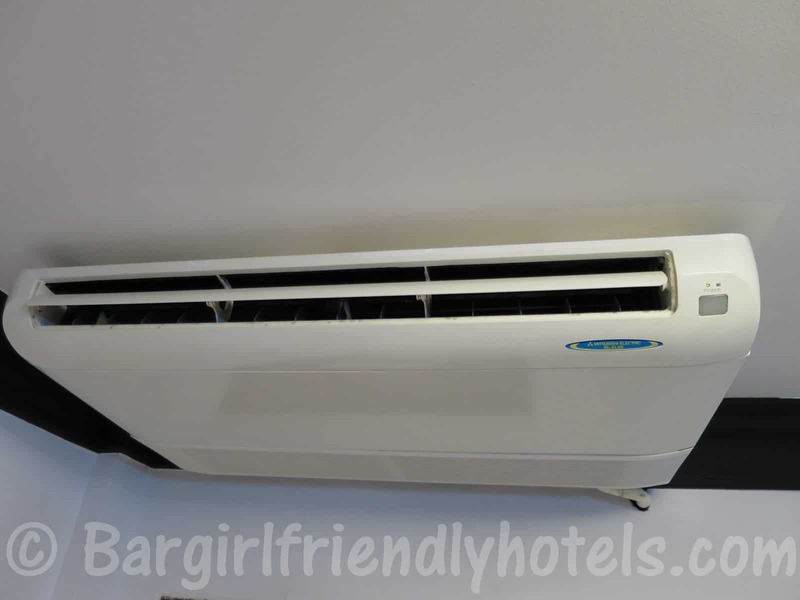 Rooms were nice and big with comfy bed, TV & DVD player, safe, A/C, free Wi-Fi, fridge and well appointed bathrooms with plenty of hot water & a balcony. 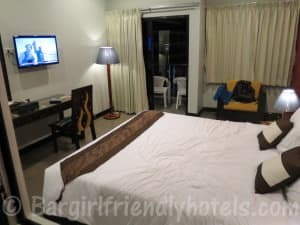 Last Date Visited: Pictures of the Safari Beach Hotel were taken during my last visit in November 2016 and reflect their second cheapest category of accommodation on offer found here Online : “The Safari Deluxe”. 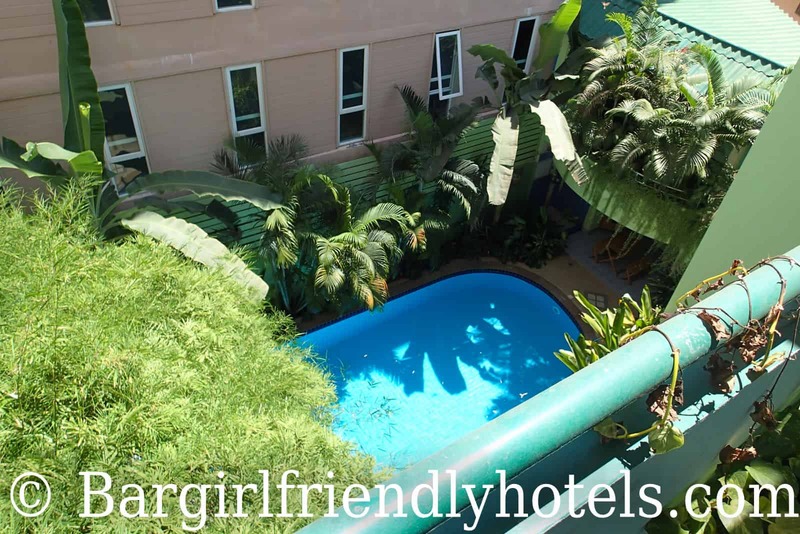 PROS: Awesome Location next to both the beach and bangla road, clean and tidy pool with lush tropical garden, big rooms, great seafood restaurant & bar. CONS: Downside from location is the noise from Bangla Road, slow Wi-Fi, pool closes at 6PM. Guest Friendly policy reply by the Safari Beach Hotel: "Greetings from Safari Beach Hotel! We don't charge anteing for joiner but you much to live ID card at the Front desk. Thank you. Best Regards, Phanit B.". 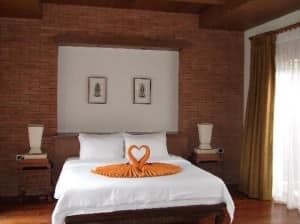 The Chambre Patong has a great location, tucked up a small lane just behind Soi Sansabai it has the advantage of being quiet enough to sleep at night while being only 300 meters away from the hustle of bustle of Bangla road. Jungceylon mall is a 5 minutes walk and the beach anywhere between 10 to 15 mins depending on crowds and traffic. 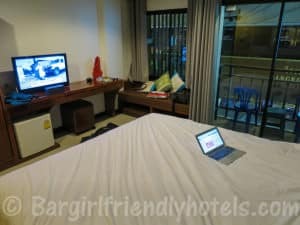 The Chambre Patong Hotel is also very guest friendly, upon check-in I got a little nervous because there is a sign at the back of the counter that says it's 500 THB for joiners but after asking clarification to the girl at the reception that's only if you go over the maximum room capacity of 2 person. 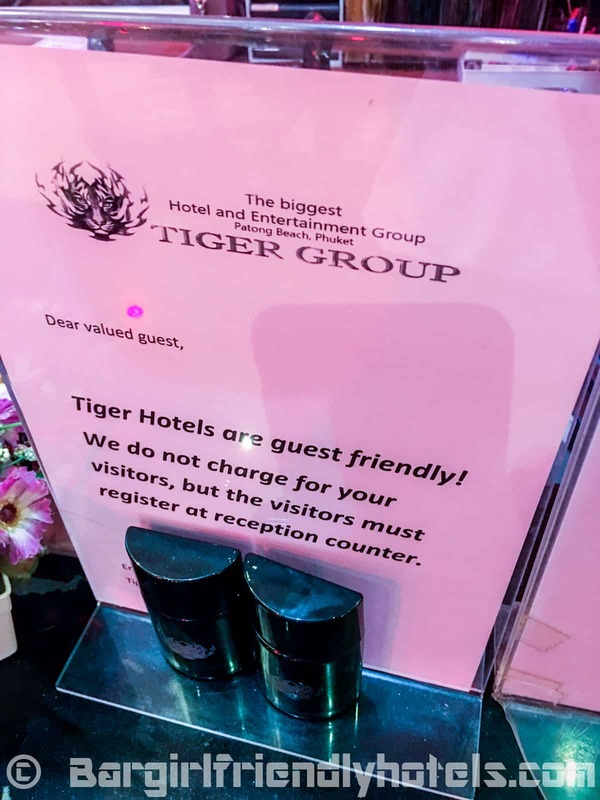 When I tested their policy later that night, there was indeed no problems bringing back this Tiger disco girl back to my room with another employee present. Just make sure she has ID because they do ask for that. 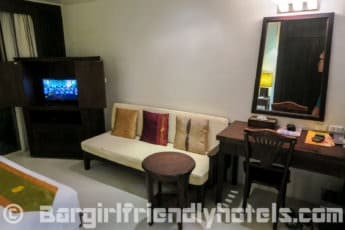 I found the superior room to be medium to small in size but very welcoming with nice decoration and all modern amenities: The big king size bed and pillows were a little hard but nothing out of the ordinary for Thailand, nice flat-screen TV with around 100 channels, quiet A/C unit with easy to use wall mounted control, mini bar with drinks, small in room safe, free WiFi, cushioned bench seating area near the window, the usual two daily complimentary bottles of water with coffee & tea making facilities, small bathroom with a good shower and free toiletries, room also had a small balcony with table and chair facing the backstreet. 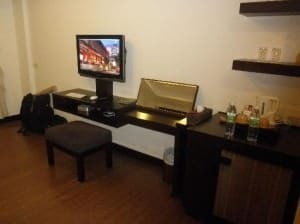 Overall very comfortable stay at a good price, no problems with recommending the Chambre Patong. 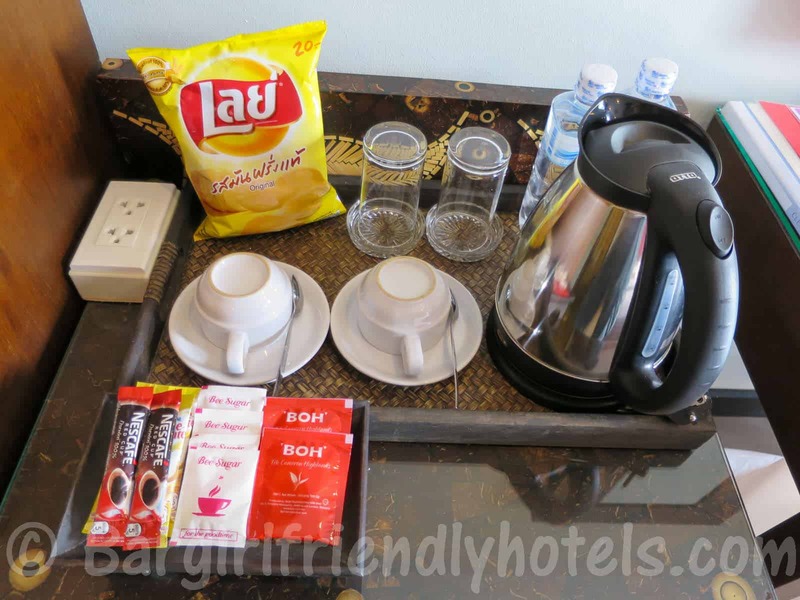 Last Date Visited: Pictures of the Chambre Patong were taken during my last visit in March 2014 and reflect the only type of accommodation on offer found here Online : “The Deluxe Room”. 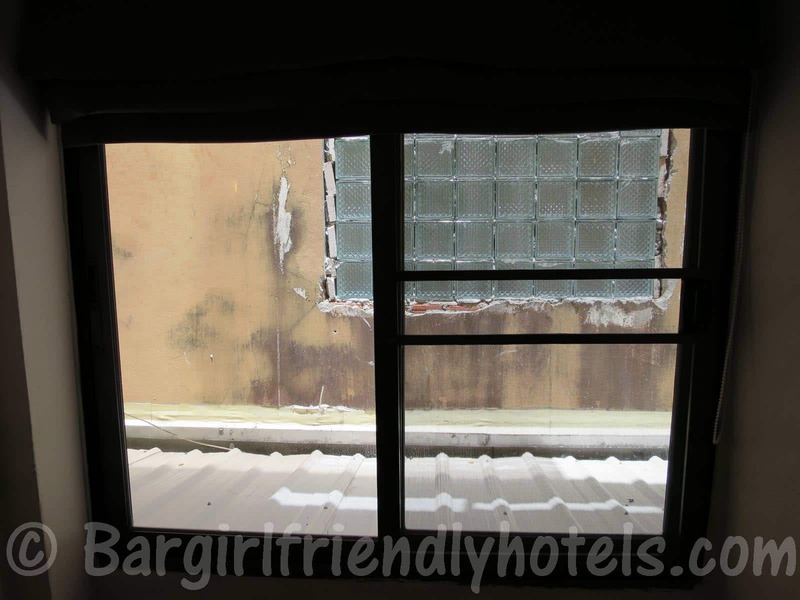 CONS: In some rooms the view is non existent as the window directly faces the opposite building wall meters away. Guest Friendly policy reply by the Chambre Patong: "Dear Sir, If you stay alone in your room and bring just 1 girl, you don't need to pay for her. Because we allow 2 person to stay in 1 room. 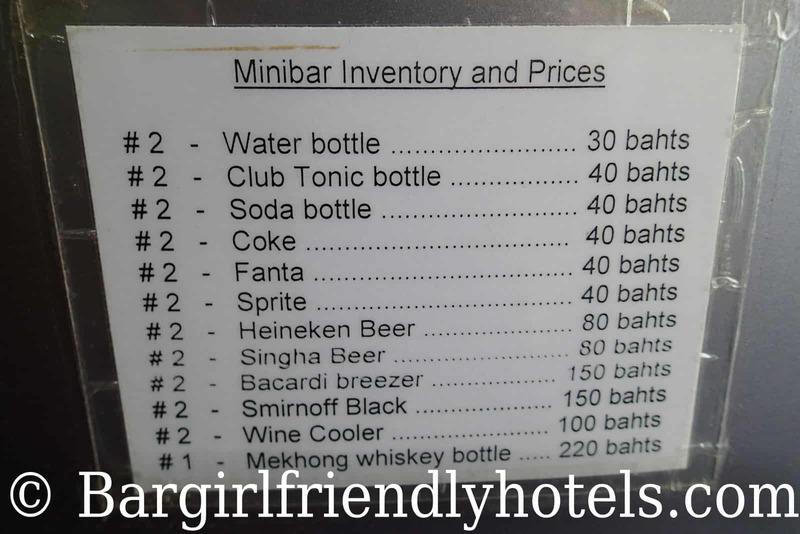 But If you stay with 2 lady 300 Baht per night. Best regards, The Chambre". 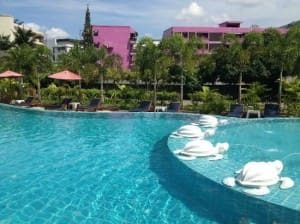 Last Date Visited: Pictures of the Lantern Resorts Patong were taken during my last visit in November 2016 and reflect their poolside category of accommodations found here Online : “The Pool Access Pent”. PROS: Nice modern resort with great rooms, 2 pools, big bathroom with separate shower and tub, Pool access rooms, good restaurant, awarded Trip Advisor's Certificate of Excellence 2016. CONS: Wi-Fi disconnects after a short time when idle, limited menu at the restaurant. 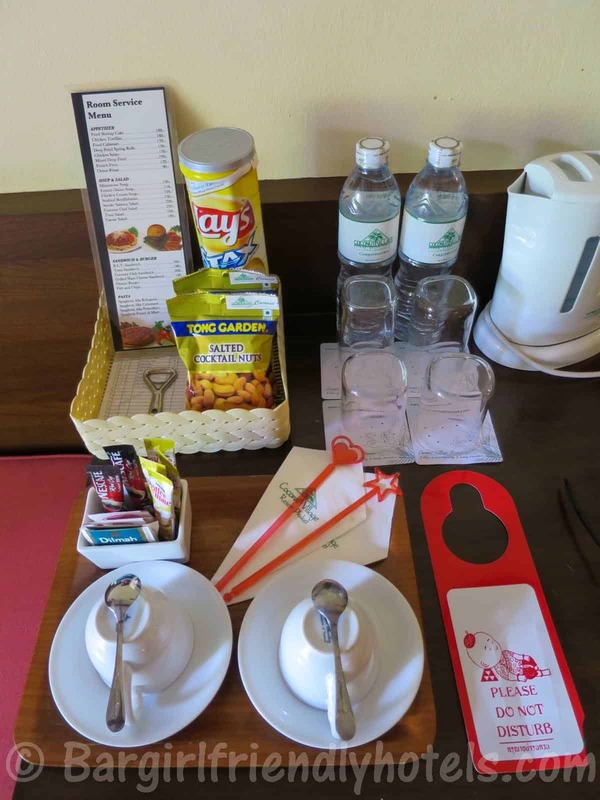 Guest Friendly policy reply by the Lantern Resorts Patong: "I would like to inform you that in case of the reservation for 2 People but single person use , There is no charge for extra person without any privilege such as free breakfast. Best Regards, Ben ". 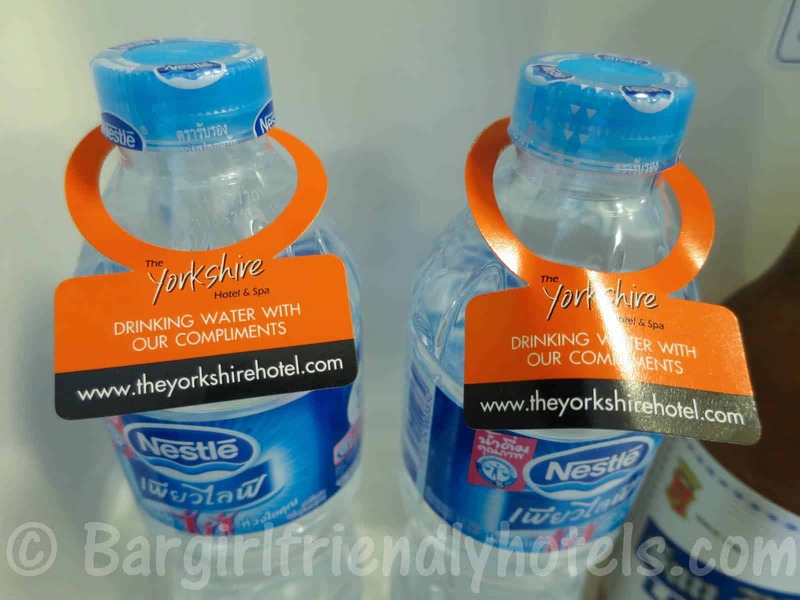 The Yorkshire Hotel is a recently refurbished English owned property located less than 100 meters from Phuket's party central, the famous Bangla road. The beach, Jungceylon Shopping Center (Biggest mall of Patong) and boxing stadium are all also easily accessible within less than 5 minutes walk. 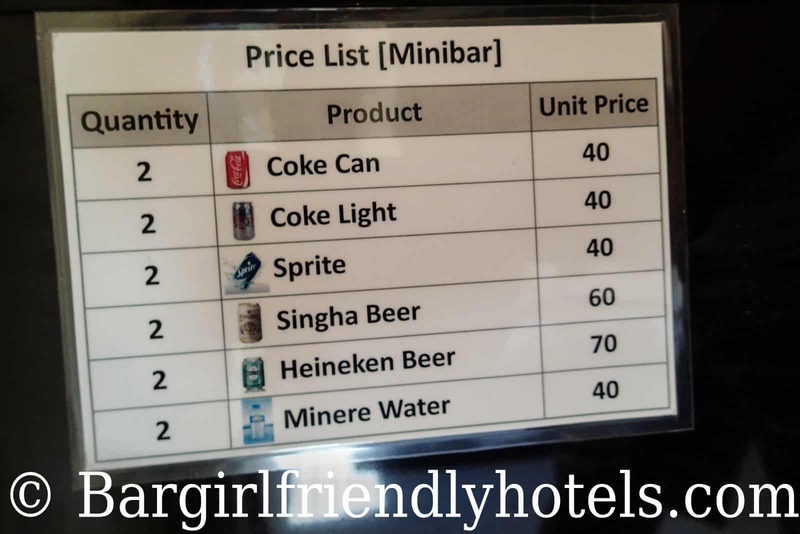 What makes the Yorkshire Hotel stand out from the competition on Soi Sansabai is the amount facilities they offer for a hotel of this size and price. You get a great pool area with bar to hang out on a lazy day, complete with adjacent sauna and steam room, on the first floor facing the swimming pool you have a fitness center offering an extensive range of equipment and at the front a restaurant offering a good selection of Thai and Western food. 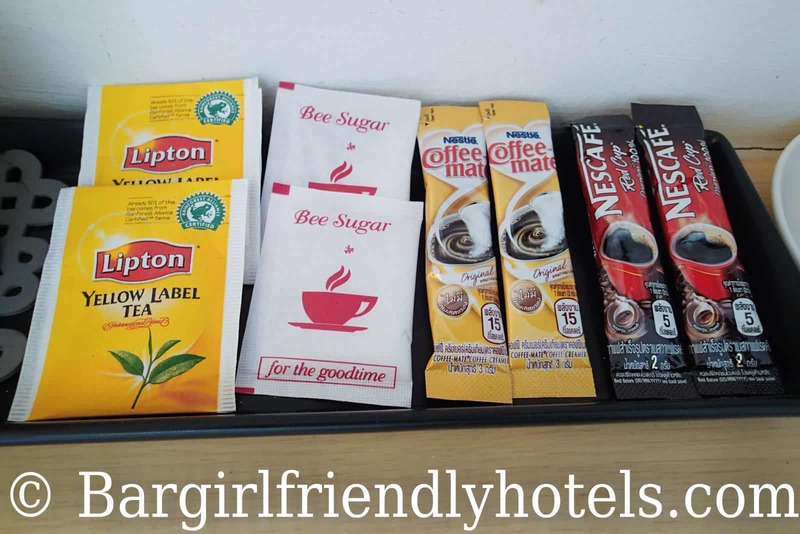 The hotel is well managed and has a real British feeling to it. No elevators, but keep in mind it's only 2 floors.The Yorkshire hotel is also definitely very girl friendly, on arrival the staff at the reception will no doubt mention it in their welcome speech as they give you a quick rundown of the place. As always tested their policy bringing back in this case at two separate occasions that night a girl picked up at Tai Pan disco without any issues. The Yorkshire hotel finished the renovations they started 1 1/2 year ago so all the rooms have been updated and everything feels modern and new. I gave the Standard Deluxe (2nd cheapest room) a try and while they are a little on the small side it wasn't like I felt cramped neither. Room was comfortable, nothing particularly fancy but everything was very clean and well appointed with a big cozy bed, flat screen TV with 85 channels (15 in English), a well stocked minibar (at these prices) with 2 free bottles of water/day + some snacks, small safe (no room for laptop), free Wi-Fi, good air-con unit, a small table, plenty of power outlets that will charge your electronic devices even when you leave your room, small bathroom with open shower that provides plenty of hot water & a very basic toiletries set. 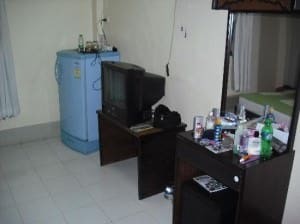 Rooms have good sound isolation, I remember even with the music blasting next-door could barely hear it once inside my room, housekeeping also did a very good job keeping the place clean. The only negatives I can think of is while the rooms have been nicely refurbished even adding a little space there is no more wardrobe or drawers just an open rack for hanging clothes, also my window provided no view. But overall even with a little few setbacks i can definitely recommend this hotel for their facilities and well priced rooms. They keep being awarded Trip Advisor's Certificate of Excellence and 2014 is no exception so don't take it just from me they must be doing something right. 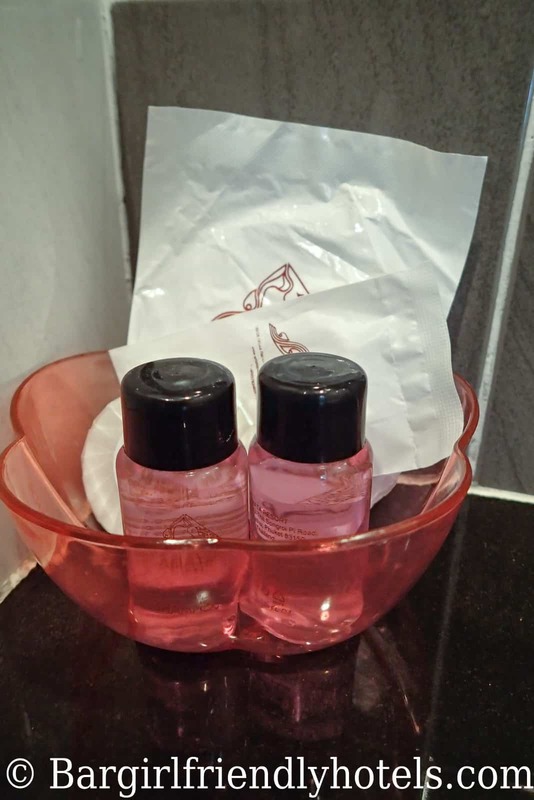 Last Date Visited: Pictures of the Yorkshire Hotel were taken during my last visit in September 2014 and reflect their 2nd cheapest accommodation on offer found here Online : “The Standard Deluxe Room”. PROS: Central location, newly renovated rooms, free WiFi, awarded TripAdvisor's Certificate of Excellence 2014, relaxing pool area with sauna and stream room, good soundproofing, no fees for joiner even when booking single rooms, electricity & A/C don't automatically turn off when you leave the room. CONS: No elevator, no window view, no wardrobe or drawers. Guest Friendly policy reply by The Yorkshire Hotel (Formerly the Yorkshire Hotel and Spa): "Our hotel is guest friendly and does not charge for an overnight guest. Kind Regards, Rachael". 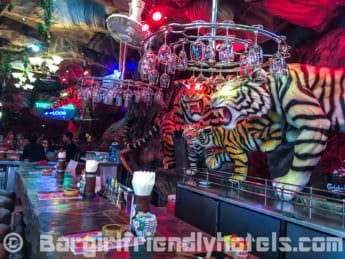 The Tiger Inn's prices are good, starting between $33 USD/night & 66 US/night depending on the season you get a big clean room decorated in a safari theme just 5 minutes walk from Bangla road and about 7 minutes from the beach. 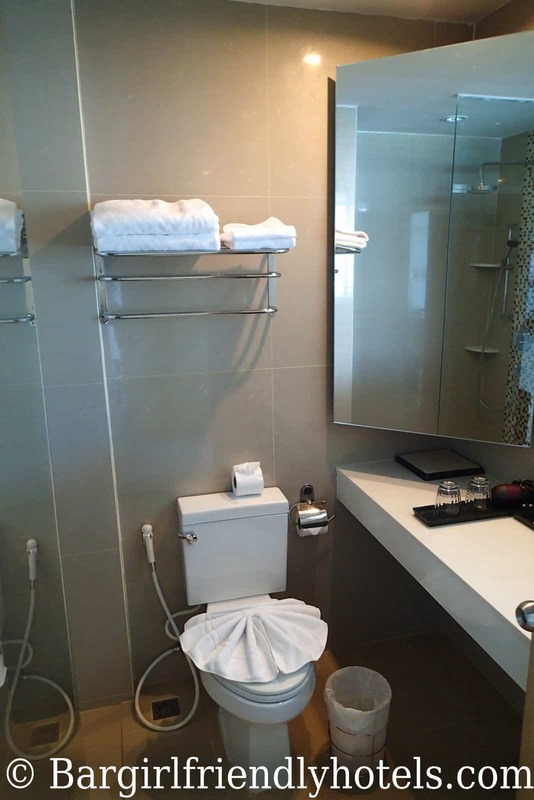 The maids do a great job with the daily cleaning and the staff are friendly with proper English skills. Last Date Visited: Pictures of the Tiger Inn Hotel were taken during my last visit in November 2016 and reflect their cheapest accommodation on offer found here Online : “The Superior Room”. 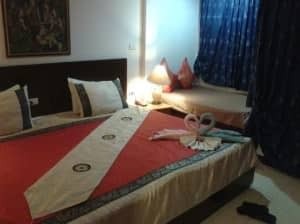 PROS: Only a few mins walk from Bangla road & beach, good king size bed, Free Wi-Fi, big rooms, quiet A/C. 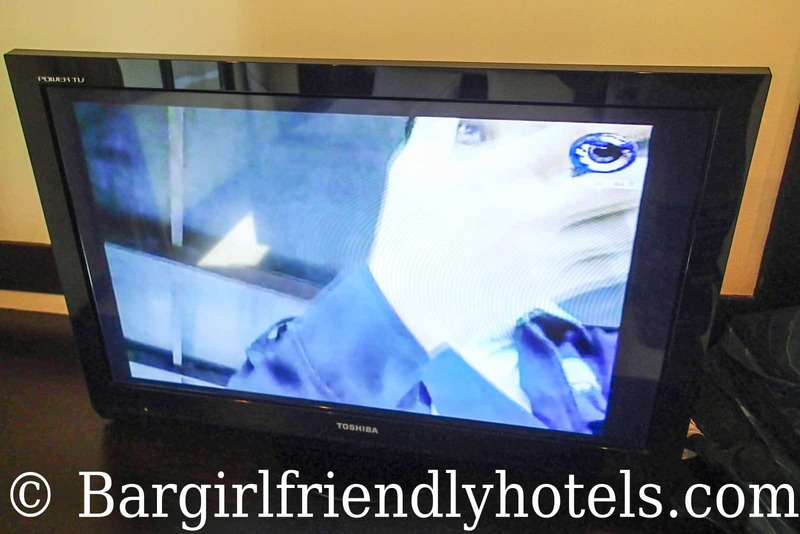 CONS: Old CRT TV, a little noisy at times from the band playing downstairs, no pool, rooms aren't modern. Guest Friendly policy reply by the Tiger Inn Hotel: "Please noted that our hotel not charge any more for Joiner. But you must take care of your value thing by your self. Best Regards, Nonny. Reservation Manager Tiger Group Patong". 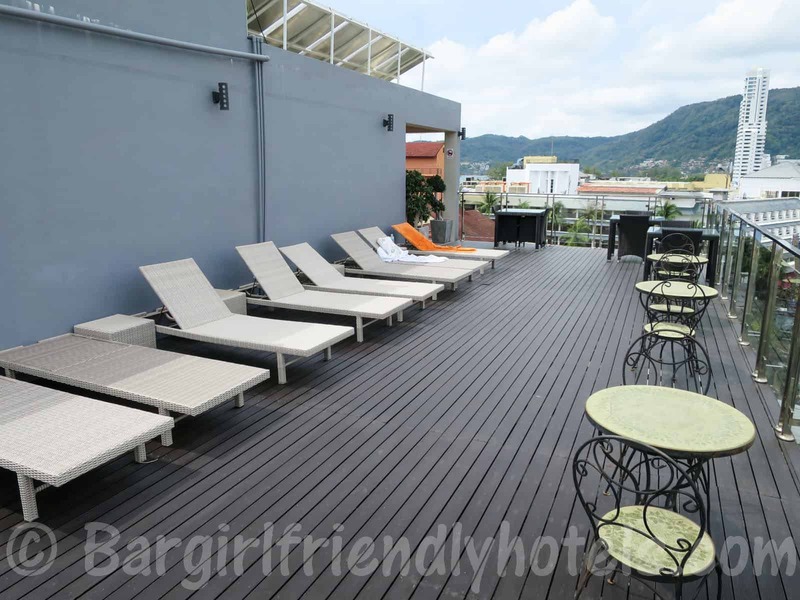 Simply put with prices in the 800-1500 Baht range depending on the season, the Arya EightballRecords HotelRoom is one of the best value for money hotels in Patong. 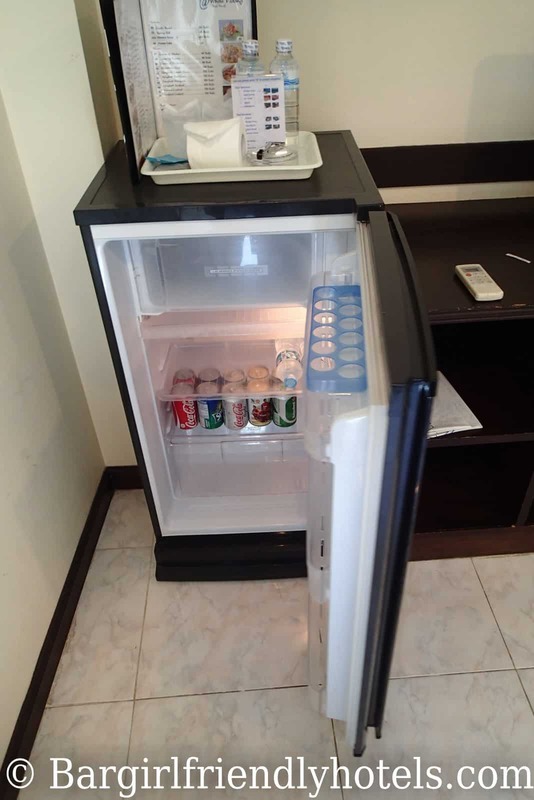 So if you are on a budget and looking for a clean, comfortable and cheap room with all the basic amenities within walking distance of the beach (15 mins) and Bangla road (10 mins), this should be an easy choice. 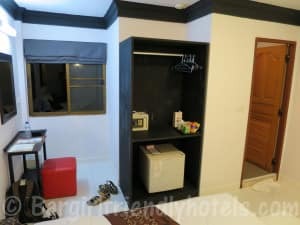 PROS: Value outweighs the price, Free Wi-Fi, good air-con, clean rooms, comfy beds. 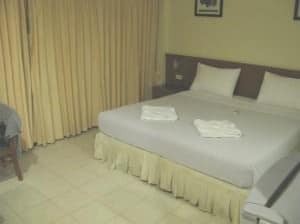 Guest Friendly policy reply by the Arya EightballRecords HotelRoom: "The room rate is include for 2 person in 1 room (if you stay alone is no fee charge for Joiner) Best regards, Arya EightballRecords Hotelroom". 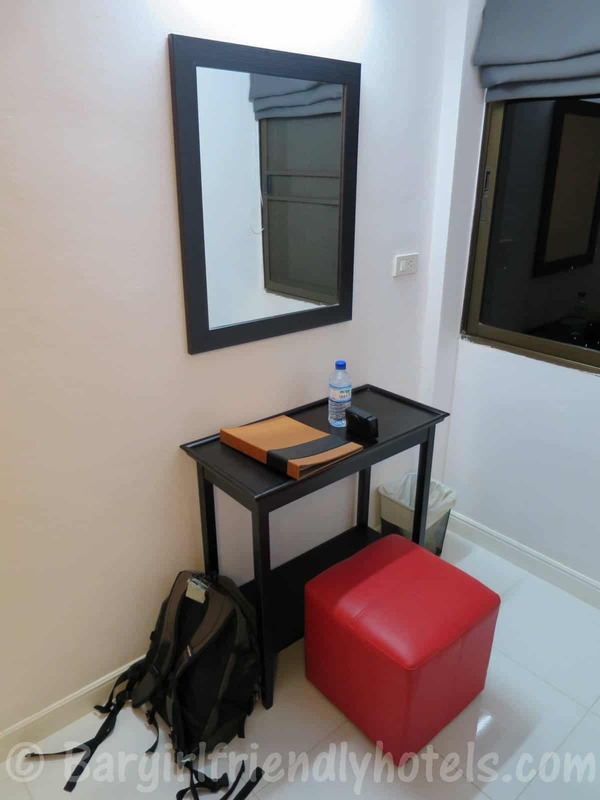 The AsiaLoop is a nice little guest house located a bit out of the way from Patong's center (15 minutes walk from beach and 20-25 from Bangla road) but perfect if you are looking for somewhere peaceful and quiet to sleep at night. 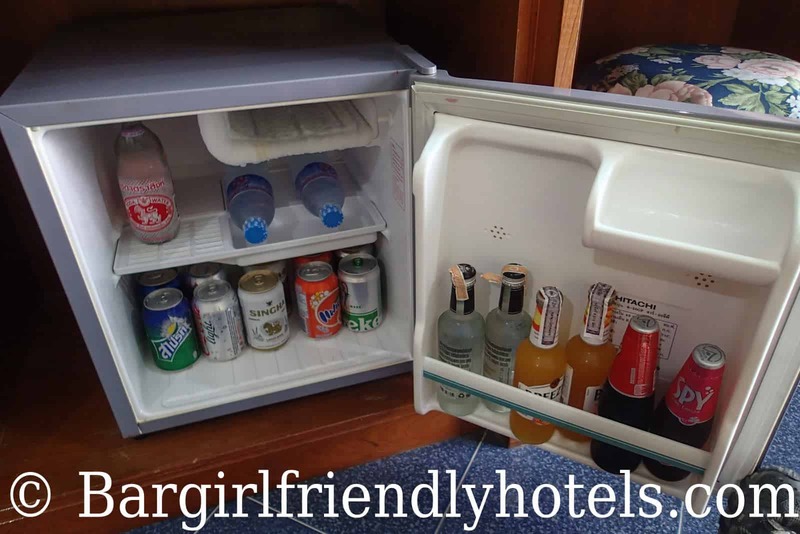 Their superior rooms are large, clean and modern with everything you need: Double bed, TV, air-con, fridge, balcony, modern bathroom with hot shower, etc. The economy rooms on the other hand while well furnished for the price can be a bit claustrophobic as they don't have any windows or balcony. The AsiaLoop has a rooftop swimming pool which is a cool place to hang with a beer after a long day at the beach. The only negative point is they have no elevator in this 5 floor building. 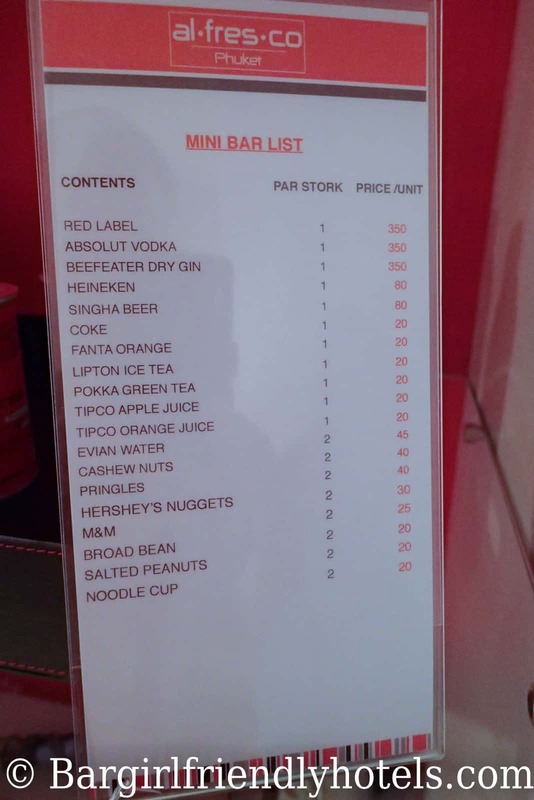 Otherwise a good deal while in Phuket! 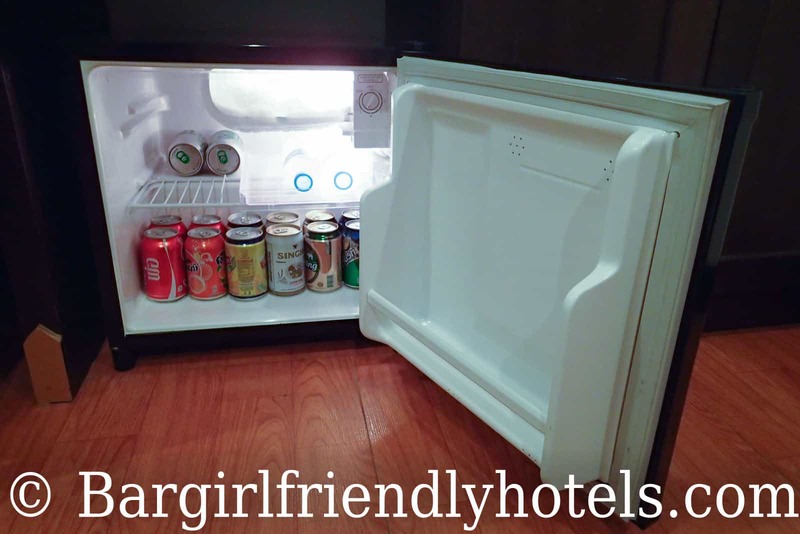 Guest Friendly policy reply by the Sharaya Patong Hotel: "Hello, the Hotel is guest friendly no worry 🙂 no extra charge !! Rgds, Marco - Managing Director AsiaLooop". 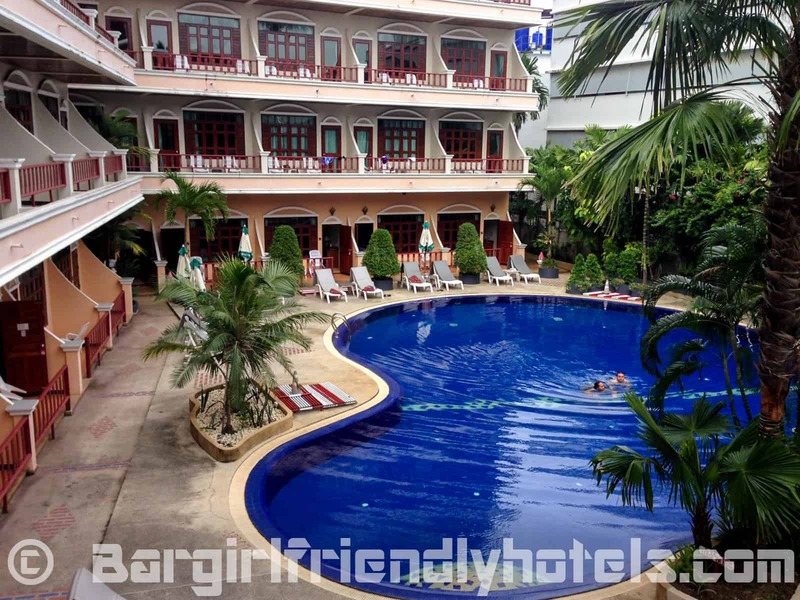 The Boomerang Inn is a very short walk from Patong beach and about 10 to 15 minutes to Bangla Road. 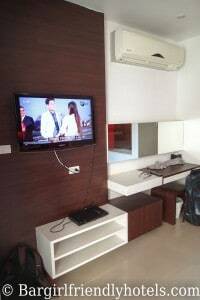 Rooms are cleaned everyday, beds comfy, flat screen TV has a good range of channels, A/C cools quickly, balcony, fridge, free Wi-Fi, etc. in short all the basics are covered here. PROS: Clean & Everything works, staff is friendly and english speaking. 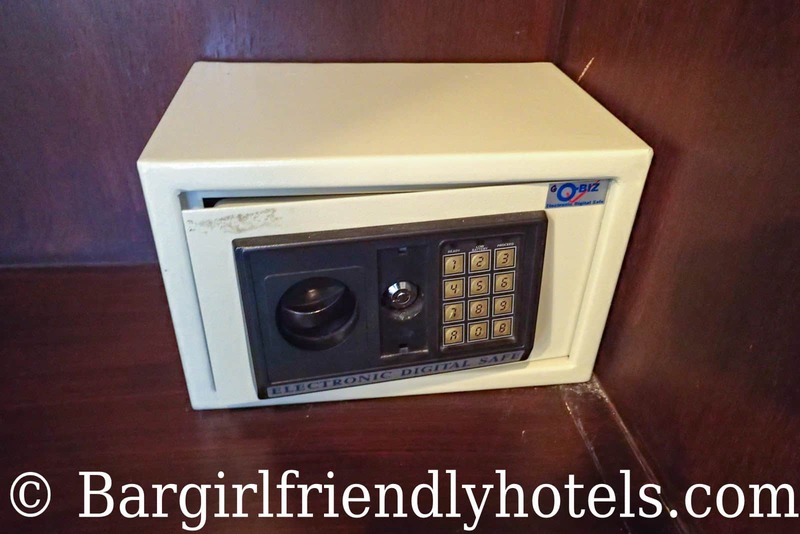 CONS: No in-room safe, thin walls, The furniture is a bit old. Guest Friendly policy reply by the Boomerang Inn: "Our policy is that if you have booked a double room you may have an overnight guest but your guest must leave her ID at reception as this is a requirement of the police. Boomerang Inn". 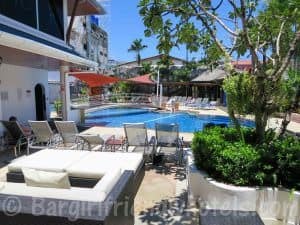 The Casa Jip Guesthouse is pretty well located in Patong with Bangla Road less than 10 minutes walk away and only 5 more from there onto the Beach. If you are looking for a clean, cheap and friendly guest house this is a great option in Phuket. 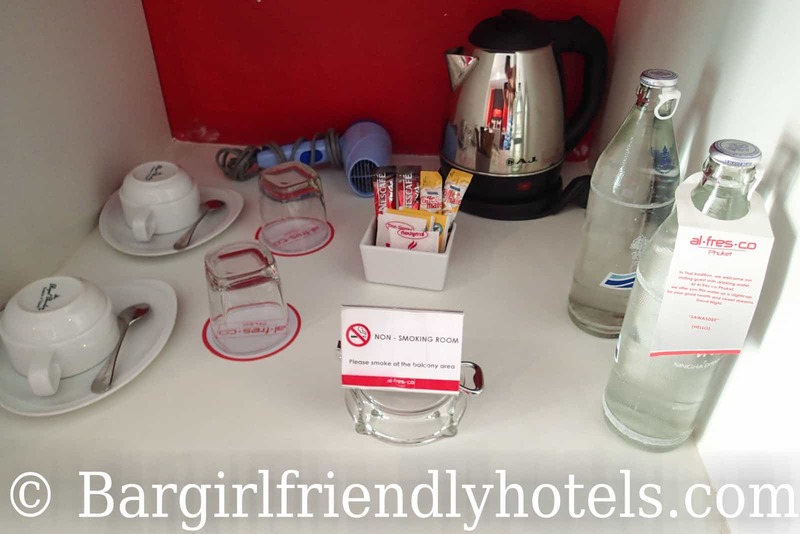 They offer big rooms with queen-sized beds, TV with plenty of channels, air-con, free high speed Wi-Fi, minibar with very decent prices and hot water every time you take your shower. The downsides is like with many other guesthouses there is no elevator so if you end up with a room on the 5th floor that's going to be a lot of stairs to climb stairs before you get to your room. In the end, a good combination of value of money and location. Guest Friendly policy reply by the Casa Jip Guesthouse: "There is NO FEE for an overnight guest but the guest MUST REGISTER their Thai ID card at front desk". Stayed here once for four nights, the stay was comfortable, staff was friendly, room was very comfortable with a big bed & lovely bathroom, free wifi was not that good though. 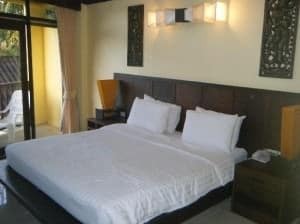 Located 15 minutes walking distance from beach but has a free shuttle service from 9am to 11 pm that was good. 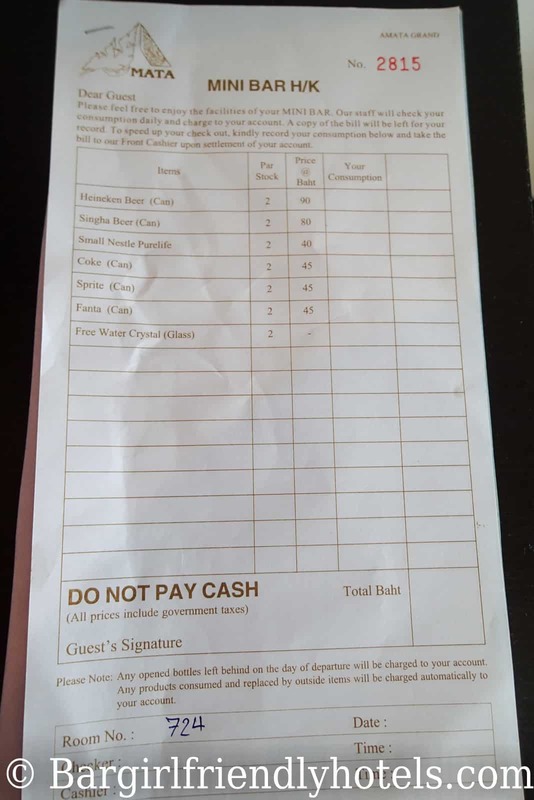 Guest Friendly policy reply by Club Bamboo Boutique Resort: "Yes we are free of charge for guest over night but they have to leave ID card at the reception. Kind Regards, Waraporn Bunkongkeaw. Resevation Manager/ Guest Relations Manager". The Duangjitt Resort is a large and peaceful oasis of calm (36 acres site) located just up the street from the southern end of Patong Beach. This is a very upscale hotel set among in 36 acres of beautiful lush gardens with several fantastic swimming pools. 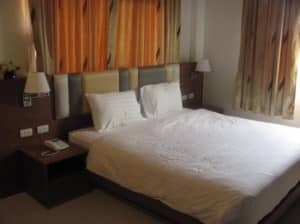 Rooms are cosy and of very high standard with all the amenities expected of a four to five-star hotel. PROS: Location, amazing pools, awesome gardens, great rooms, friendly staff, great rooms, very clean, quiet, nice buffet breakfast. 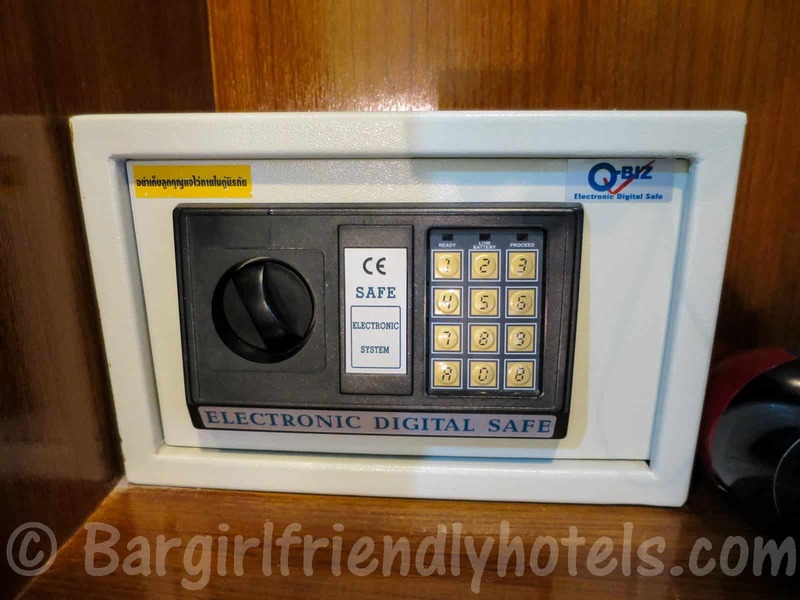 CONS: The Wi-Fi which the resort charges an exorbitant 1500 baht/day (30USD) is slow and has frequent dropouts (Otherwise is free in public areas). 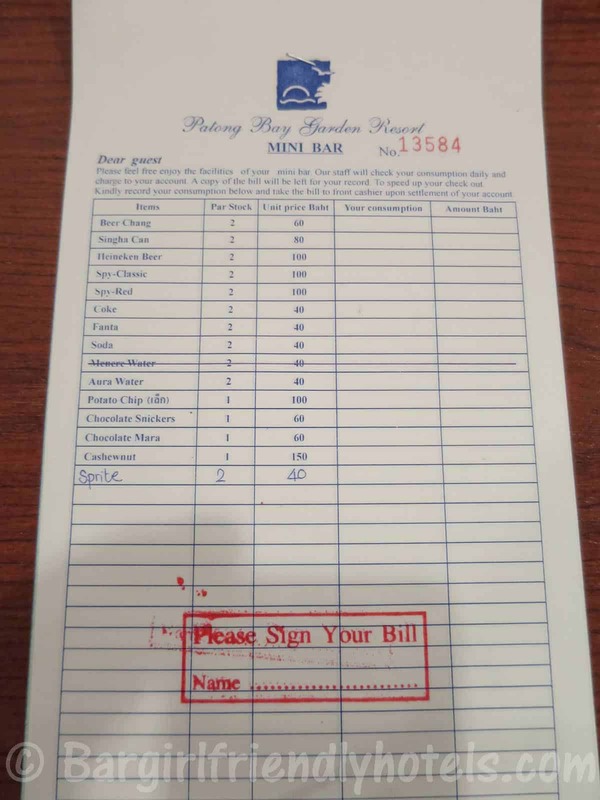 Guest Friendly policy reply by the Duangjitt Resort: "Dear sir, For Joiner we must to charge 1,000.- per person per night not include ABF With best regards, Ms.Nisa /Rsvn.". 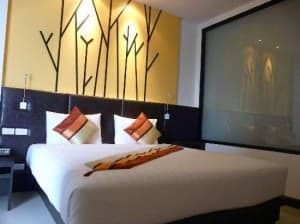 The Forest Patong Hotel is a new property located on the north and starting point of Patong city. Not for those who need to be in the middle of the party scene or alongside the beach as it's a 20 to 25 minutes walk to reach either. 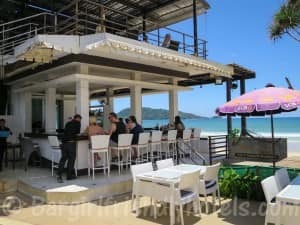 But, if you plan on renting a scooter or don't mind paying the 50-60 Baht for a motorbike taxi you can very easily get anywhere in Patong within 10 mins. 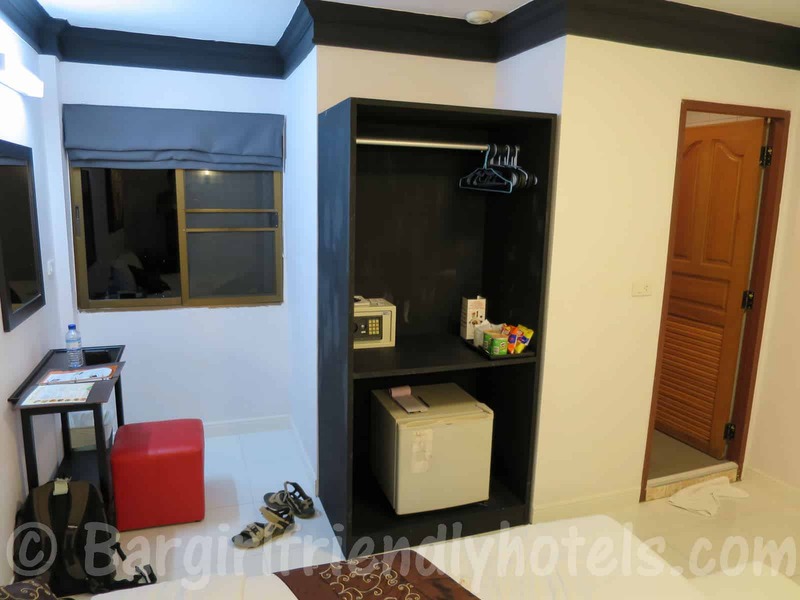 Where the Forest Patong really shines is with the type of accommodation you get for the price. 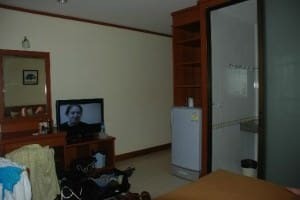 The rooms often go for just around 800/1000 Baht Online and are really big on amenities. The superior room had a 42-inch Plasma TV with DVD, your own personal desktop computer, Free Wi-Fi, large sofa, mini-bar, hot shower/bath with good water pressure, balcony, etc. 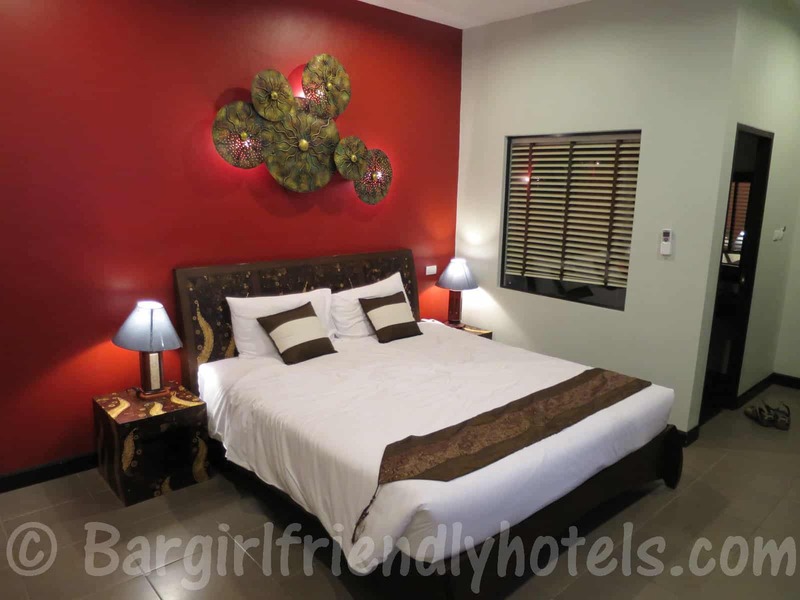 So for the price the Forest Patong hotel hard beat! 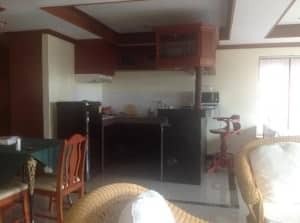 PROS: Great facilities at budget prices, Free Wifi & computer, 42-inch TV, new property. CONS: Far from the beach and nightlife. 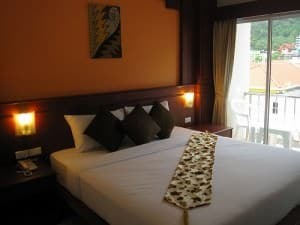 Guest Friendly policy reply by the Forest Patong Hotel: "Thank you for interested in our hotel. 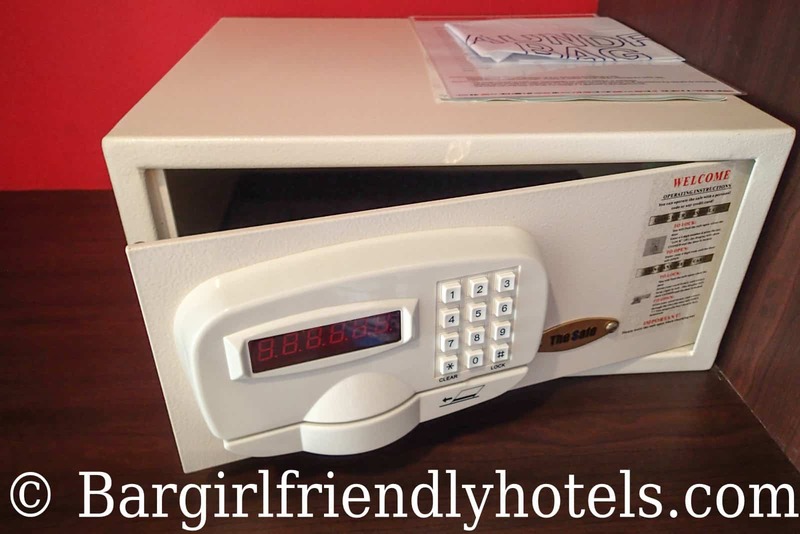 Our policy have no joiner fee for unregistered guest just leave her ID at the reception.". 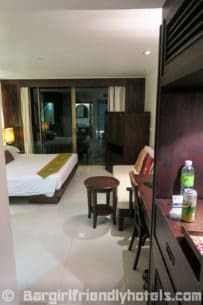 The Forty Winks Phuket Hotel is tucked in the back of Patong about 5 minutes walk from Jungceylon, 10 mins from Bangla road and 15 to the beach. The rooms are rather on the small size but clean and equipped with all the basic amenities expected: A/C, TV, Wi-Fi. Pretty decent considering the 1300 Baht I paid for it in high season but nothing special neither. PROS: Quiet at night, nice little pool, good housecleaning. 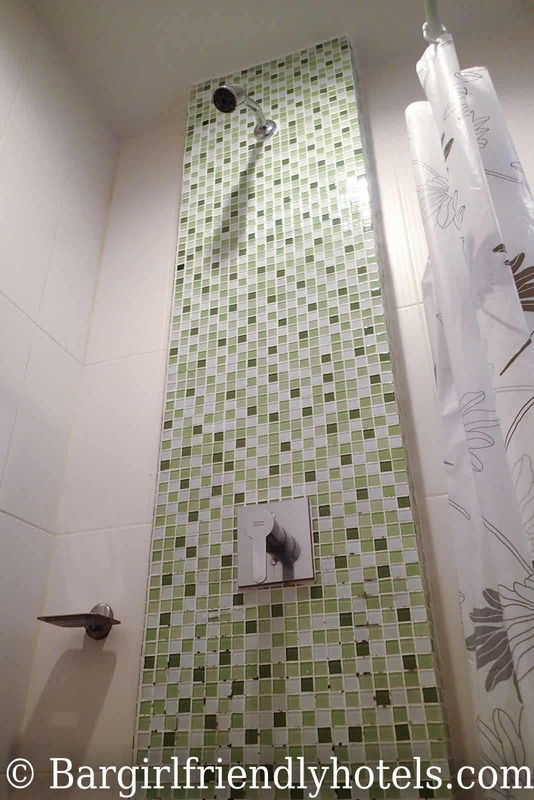 CONS: Shower water not always very hot. 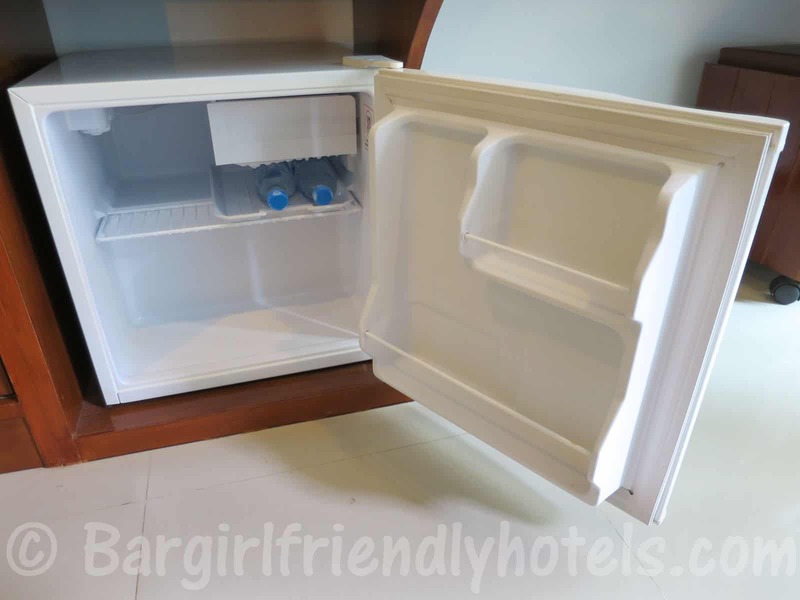 Guest Friendly policy reply by the Forty Winks Phuket Hotel (Formerly: Arimana Hotel) : "Please be informed that there is no extra charge for bringing joiner to hotel. However, the joiner is required to leave his/her ID card at the reception desk. If you need further information, please do not hesitate to contact us. Best regards, Forty Winks Phuket". 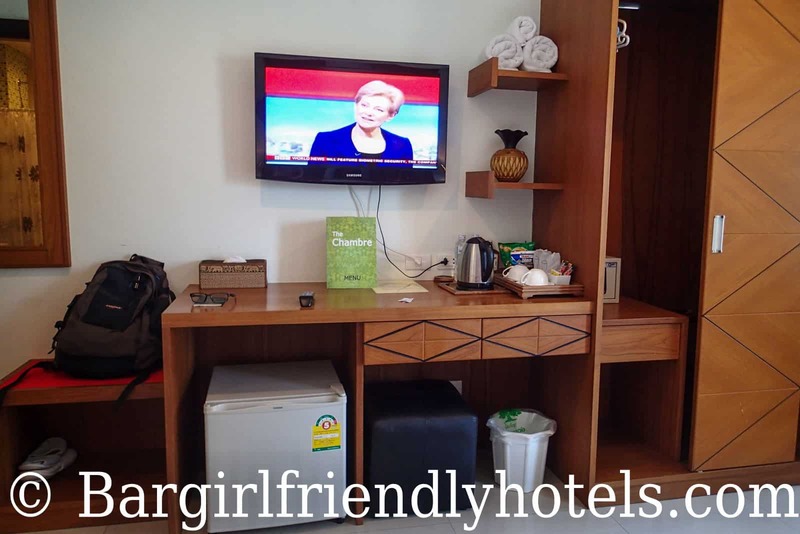 Green Harbor & Service Apartment is a new hotel that offers fully equipped rooms (comfy beds, big LCD TV, quiet A/C unit, free Wi-Fi) with a kitchen area and cooking facilities at great prices! 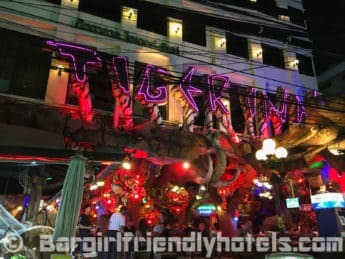 Location is the only slight downside as it's a 15 to 20 minutes walk to the beach or Bangla Road where all the nightlife is. CONS: A little far from beach and Bangla Road, no pool. 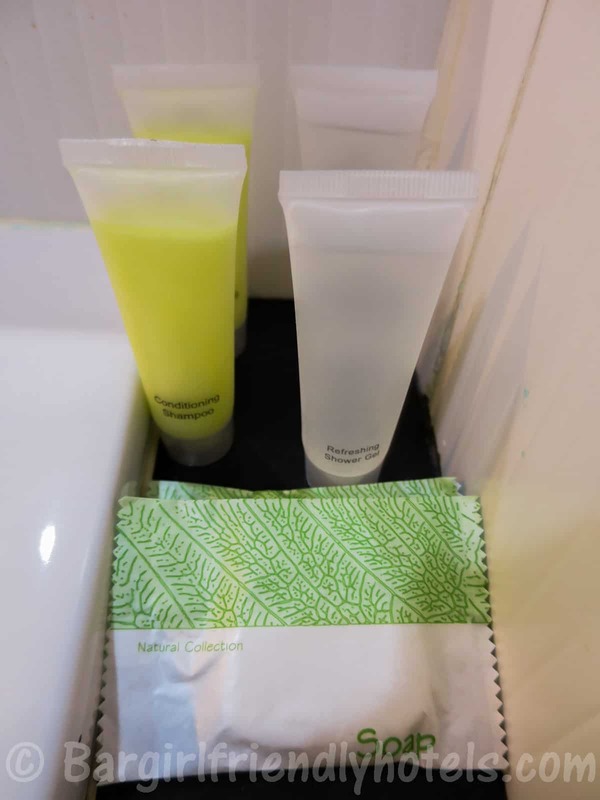 Guest Friendly policy reply by the Green Harbor Hotel: "You can take every girl short time or overnight however we not charge Best Regard Sukanya Wayobut". 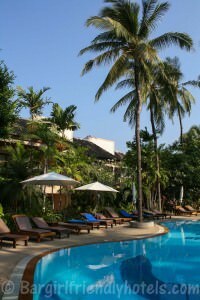 Located in Kalim Bay, the IndoChine Resort is best suited for those who want to keep at a distance from the madness of Patong. Since you need somewhere in between 30 to 45 minutes walk to get to Patong it's recommended you rent out your own motorbike if you plan to stay here or accept paying the taxi mafia 300 Baht ride each way. 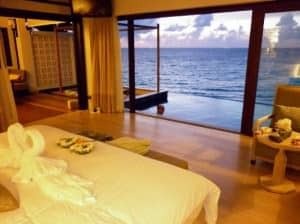 Rooms look nice both inside and out and the villas have their own private pools or Jacuzzi. 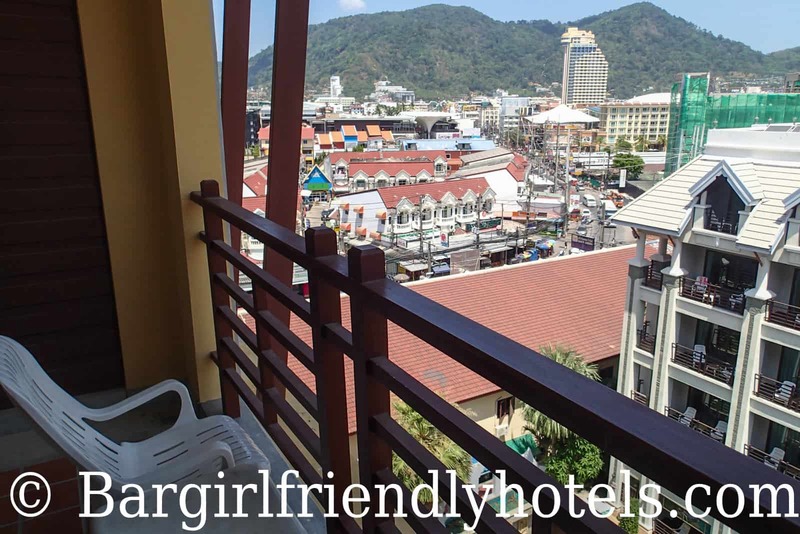 The views of Patong and the Andaman Sea from here are simply stunning! 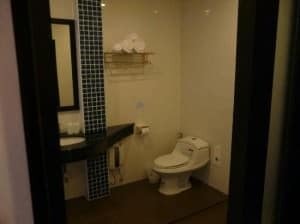 PROS: View is amazing, very quiet, rooms with pool or Jacuzzi. 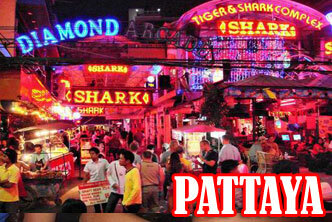 CONS: No free shuttle service, distance from Patong. Guest Friendly policy reply by the IndoChine Resort & Villas: "Our rooms can accommodate 2 persons and all visitors are required to leave their ID card at the front office. We look forward to welcoming you at IndoChine Resort. Regards, Amrish -Reservation Office". 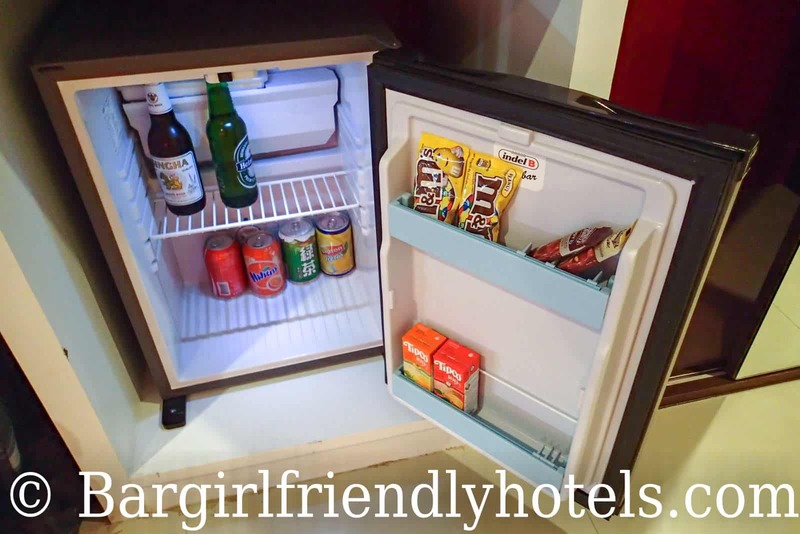 The La De Bua Hotel is located only 5 minutes from Bangla Road or beach. 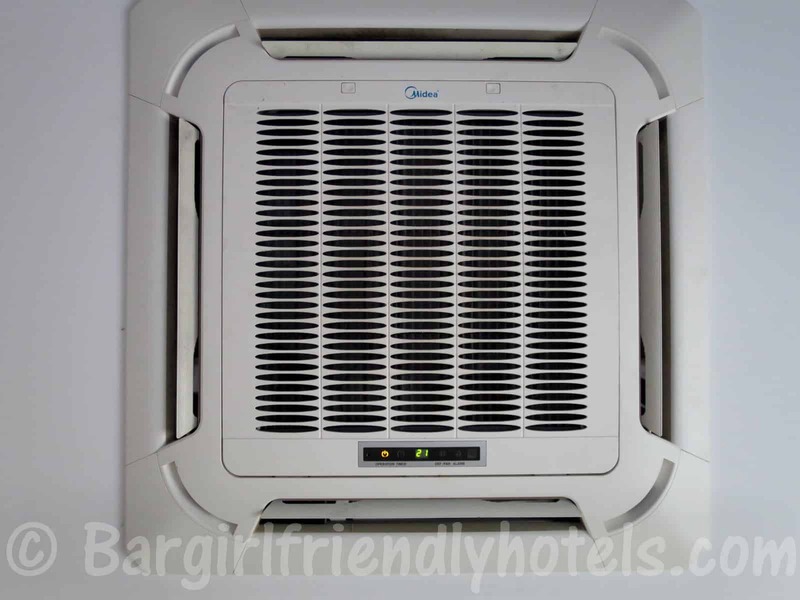 Rooms are clean and spacious, nothing fancy but everything is nice: Comfy king sized beds, good A/C, no noise. 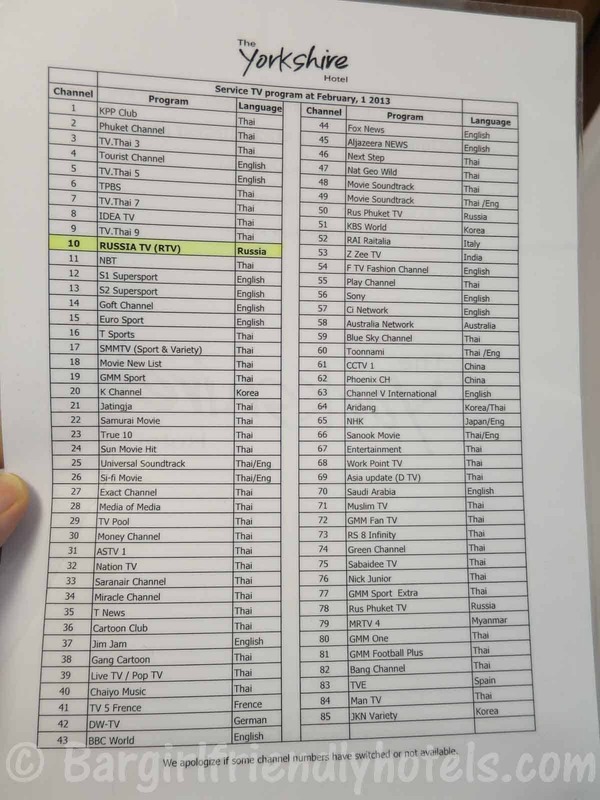 Only downside is the internet isn't free and is charged 100 Baht/day. PROS: Clean and spacious rooms, easy waking distance to beach and nightlife. CONS: Wi-Fi available but not free. 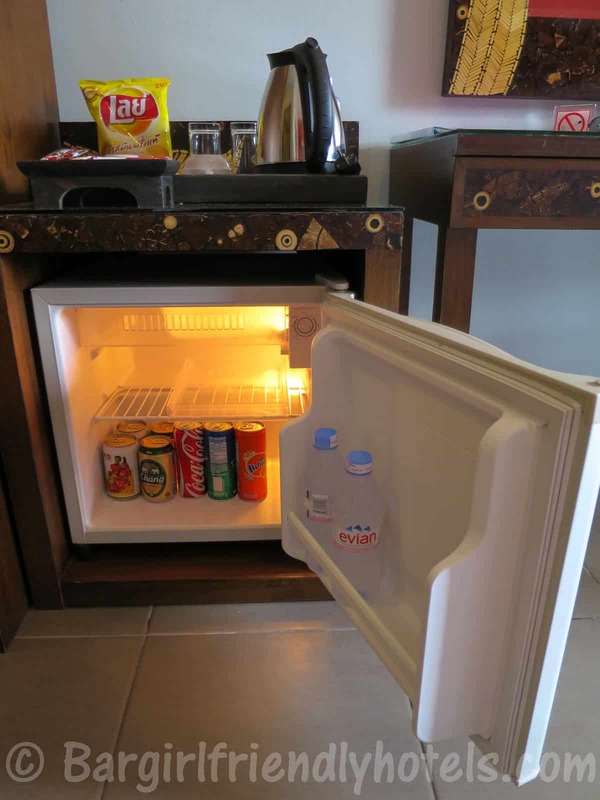 Guest Friendly policy reply by the La De Bua Hotel: "As your query, For room with single occupancy (one single adult upon check in), guest could bring one joiner to stay overnight without charge. 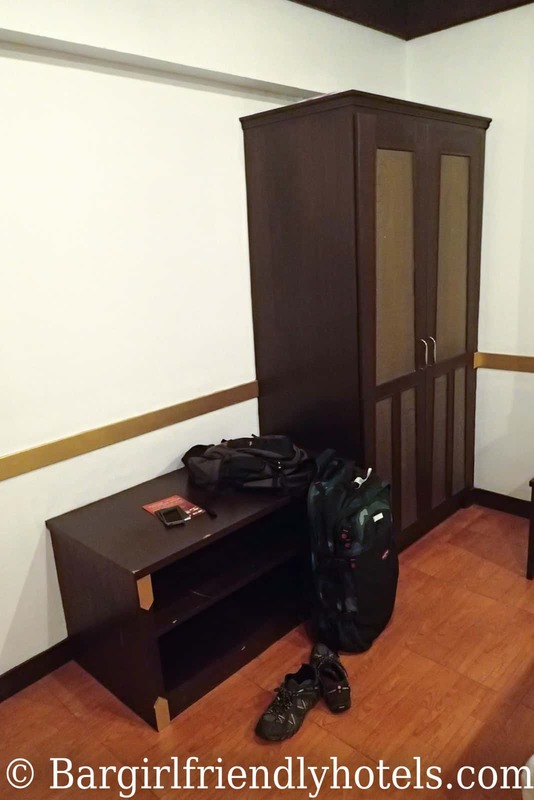 For room with double occupancy, guest who would like to bring joiner to stay overnight will be charged 300 Baht per night per room per joiner. Thank you very much. Best Regards, Ms. Monticha - W. Reservation Agent Ladebua Hotel". 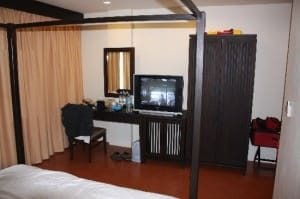 Don't expect 4/5 star but it is really good value for money with very clean rooms, good food and very obliging staff. 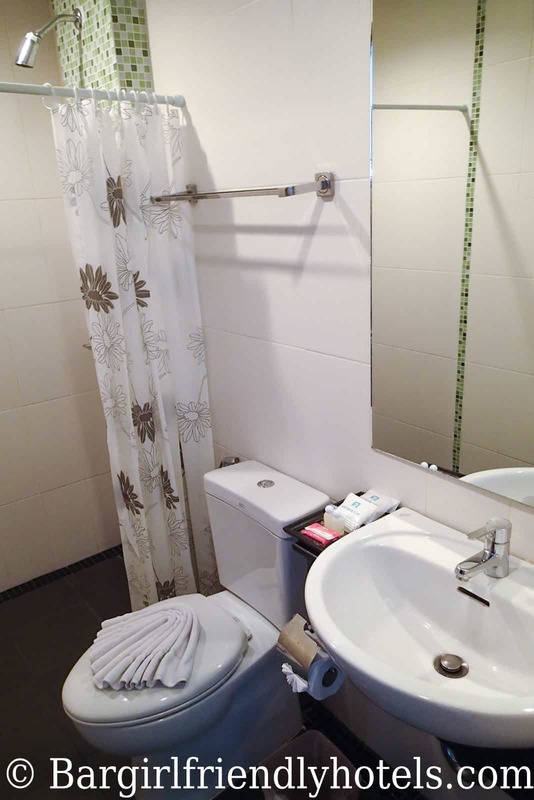 Excellent position to be able to walk most places in central Patong including beach road and Bangla Road. 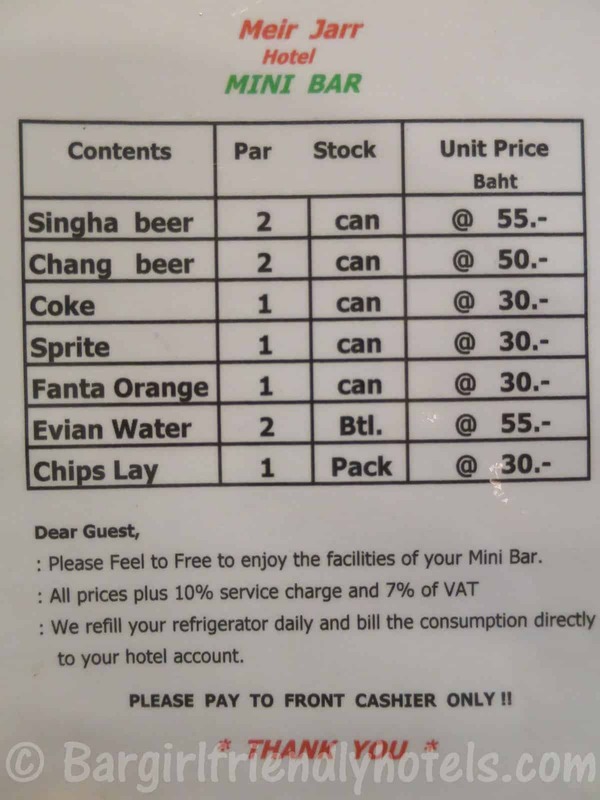 Guest Friendly policy reply by the Lamai Hotel: "Dear Sir, We are not charge joiner. But we have to keep ID card or passport of joiner when a joiner at the hotel. Best regards, Olive". 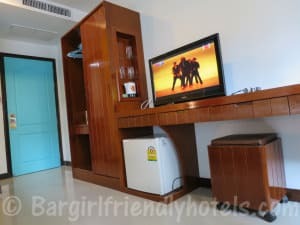 The Orange hotel is a modern property that has recently been refurbished with prices often in the low 1000 Baht range on online. 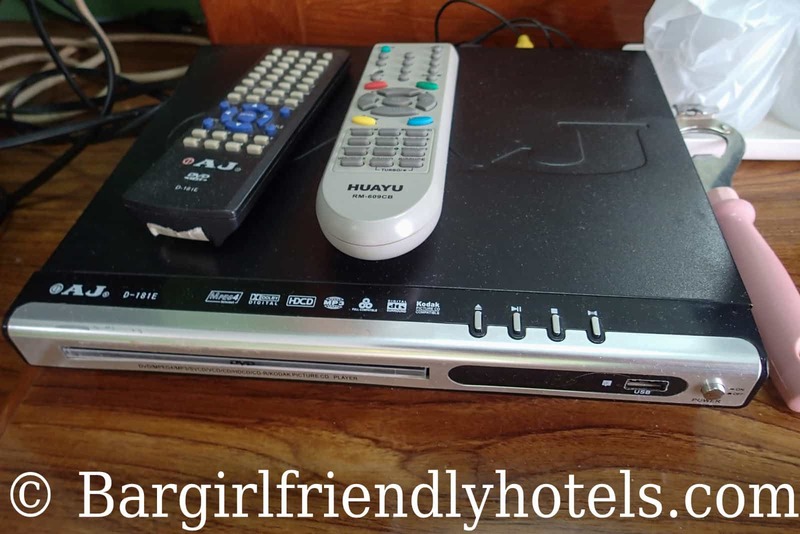 For that low amount you get a queen sized bed, big TV with around 50 channels, A/C and fan working great, free Wi-Fi, mini bar, clean bathrooms & room cleaned with sheets and towels changed every day. 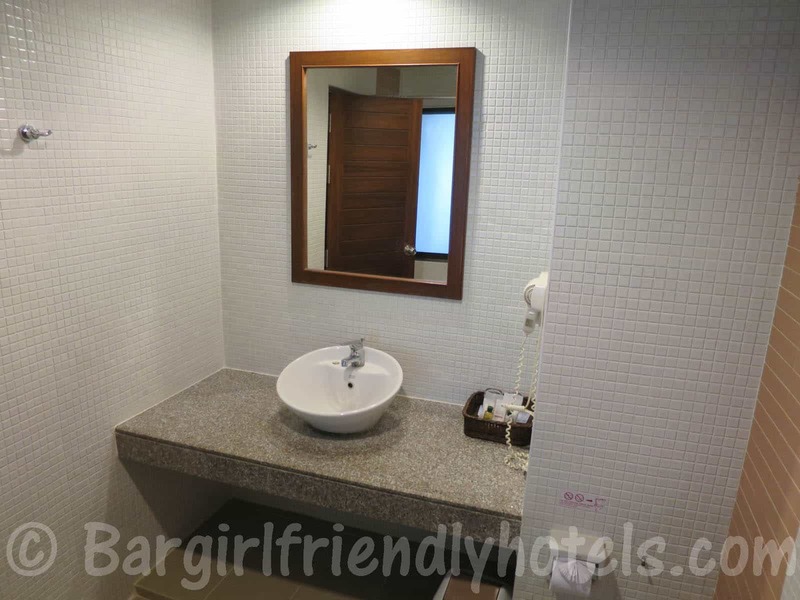 Location is 5 minutes from the beach and around 10 to Bangla road. 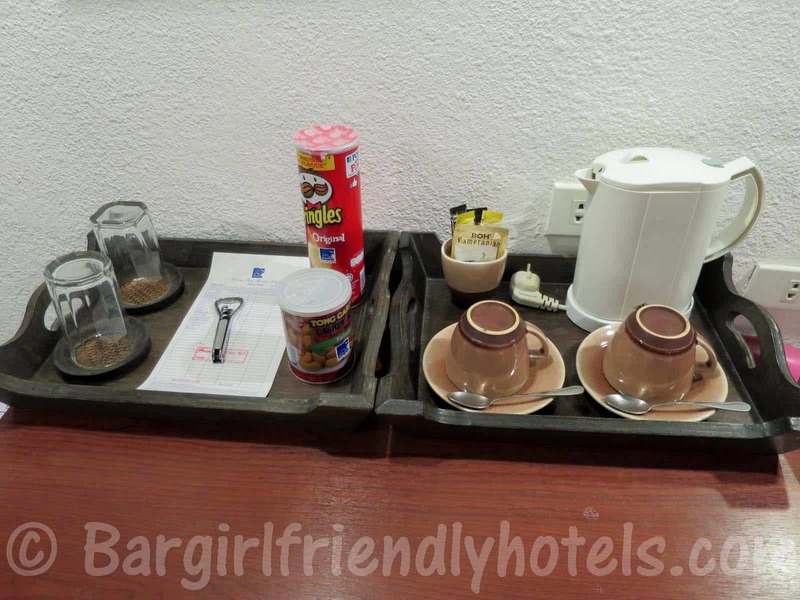 Great Value budget hotel in Patong! Guest Friendly policy reply by the Orange Hotel: "to answer you, we don t have guest friendly policy. You can come and bring an unregistered guest, it s free. Because our rooms are for 2 so you don t have to pay for additional joiner. Best regards, Orange Hotel". 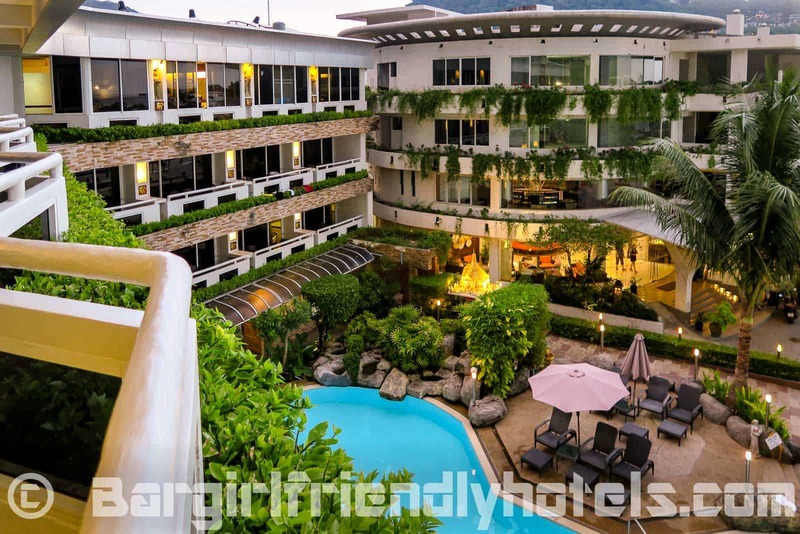 The Prince Edouard Apartments & Resort is located on the Northern hillside and offers superb views over Patong bay. 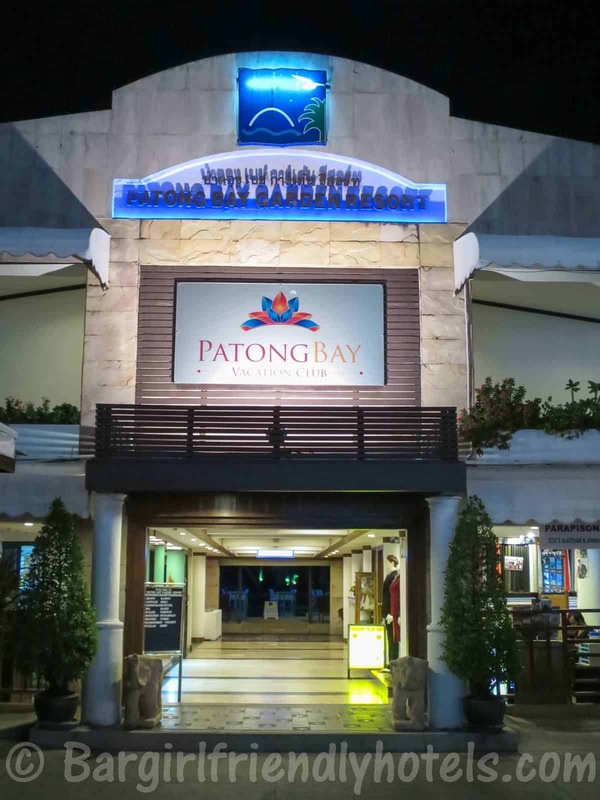 The resort provides one way complimentary drop off service to anywhere in Patong (takes 10 mins) so you only need to pay the return trip by tuk-tuk if you don't plan to rent a car or motorbike during your stay. 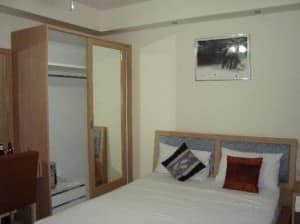 The apartments are very spacious and furnished with all you need to feel at home. 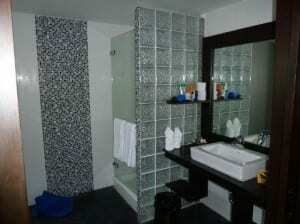 Facilities include a swiming pool with great views, restautant, jacuzi, sauna and fitness center. 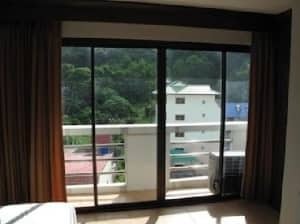 PROS: Quiet location, great view over Patong bay, spacious apartments. 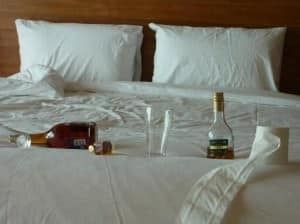 Guest Friendly policy reply by the Prince Edouard Resort: "You can bring the girl from bars can sleep overnight no charge joiner. Best regards, Bee". 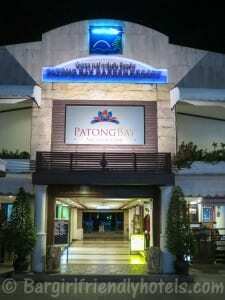 Located 20 to 30 minutes walk from the beach up Patong's Southern hillside the PS Hill Resort is ideal for those who wish to avoid the crowds. The resort provides every two hours or so a free shuttle service to the beach & Jungceylon mall until 10PM otherwise it's around 150 baht by tuk-tuk. 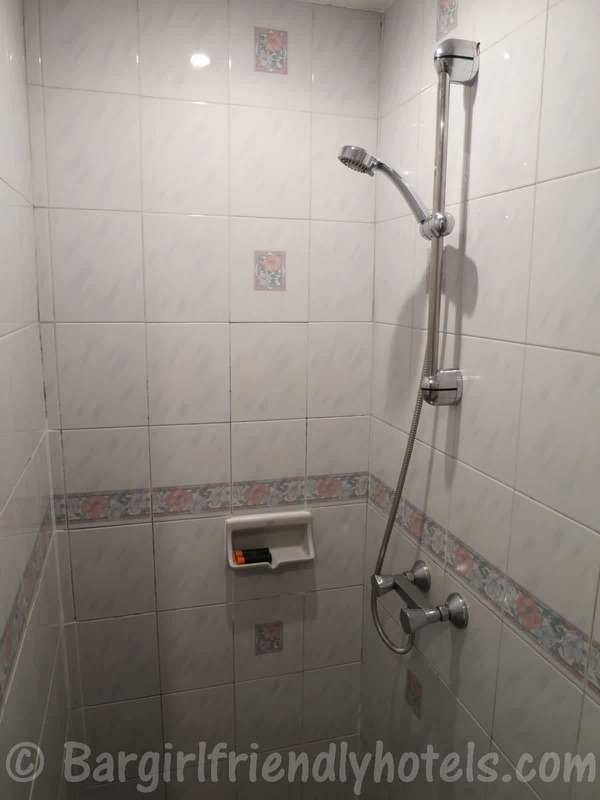 Rooms are clean and spacious with everything you need: TV, fridge, A/C unit & Wi-Fi work great, in room safe, bathroom have a separate shower and toilet. PROS: Quiet location, good value for money, great pool. 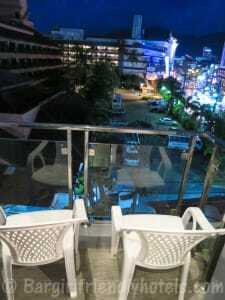 CONS: 20-30 minutes walk to the Patong beach & nightlife. 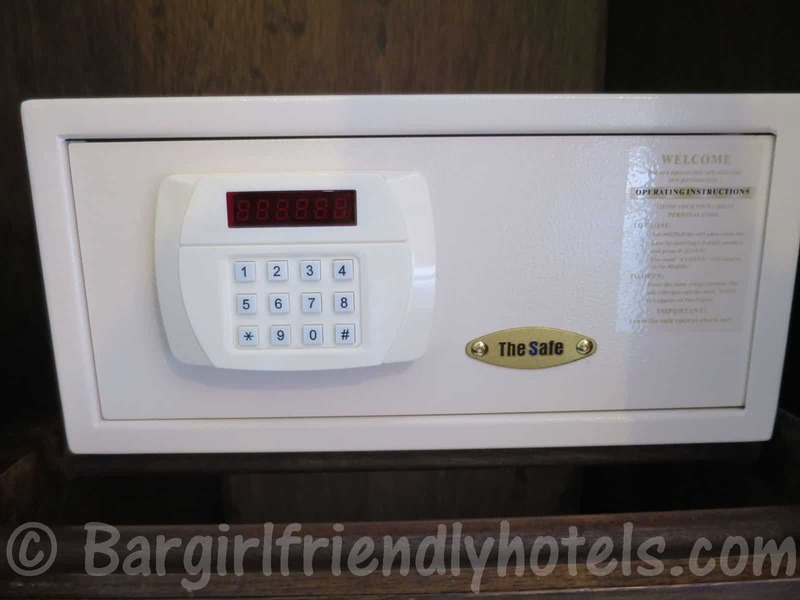 Guest Friendly policy reply by the P.S Hill Resort: "Regarding to your kindly email, we would like informed you that our resort not charge fee of joiner but we will keep her ID card at our receptionist only. Best Regards, Khanittha". 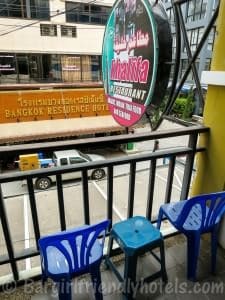 The SoleLuna is located on the edge of Patong and while you can reach the beach in just about 10 minutes Bangla Road is a good 20 minutes away or more if your stumbling home drunk at night. 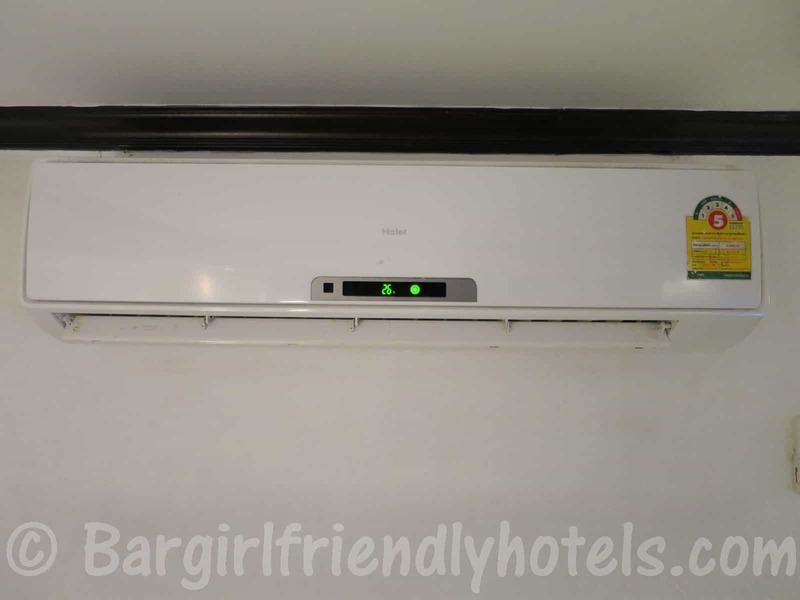 The hotel was inaugurated in 2010 so the rooms are new and clean equipped with A/C unit + fan, cable TV, mini-bar, free Wi-Fi and private balcony. Good value if you don't mind the distance. 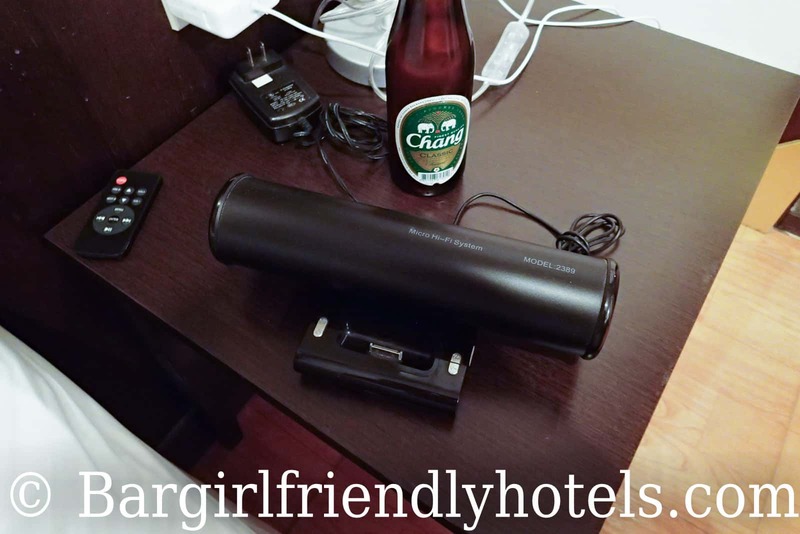 PROS: New hotel, good value for prices. CONS: 20 minutes walk from Bangla road. Guest Friendly policy reply by the SoleLuna Hotel: "Yes we are an hotel guest friendly, nothing to pay for have girl in room. She must only leave the id in reception. You are welcome in Soleluna hotel." 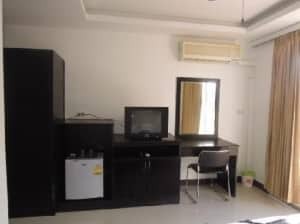 PROS: Centrally located & less than 10 mins to both Bangla road & Patong beach, large 32 sq.m. 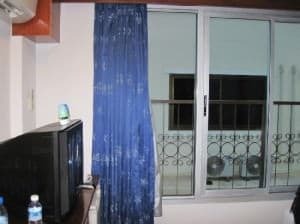 rooms with balconies that overlook the pool, nice swimming pool & bar area, good value for the price. 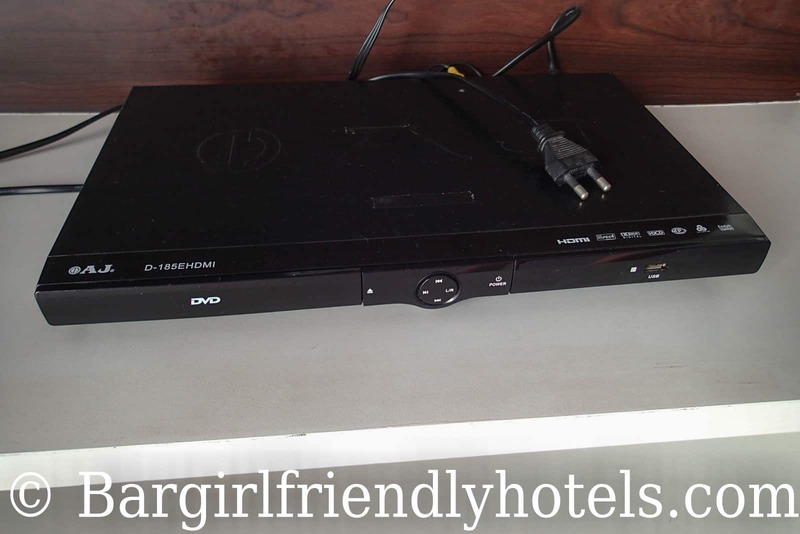 CONS: Older Resort starting to show it's age, Pool closes at 8PM, Can't bring your own drinks by the pool, beds a bit firm, still have older generation TV's in some rooms. Guest Friendly policy reply by the Tony Resort: "If you stay alone can bring one with free of charge same name same person, another one in the day 500 baht will be charge. 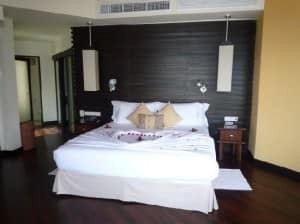 If you stay 2 person in room any one coming 500 baht will be charge. 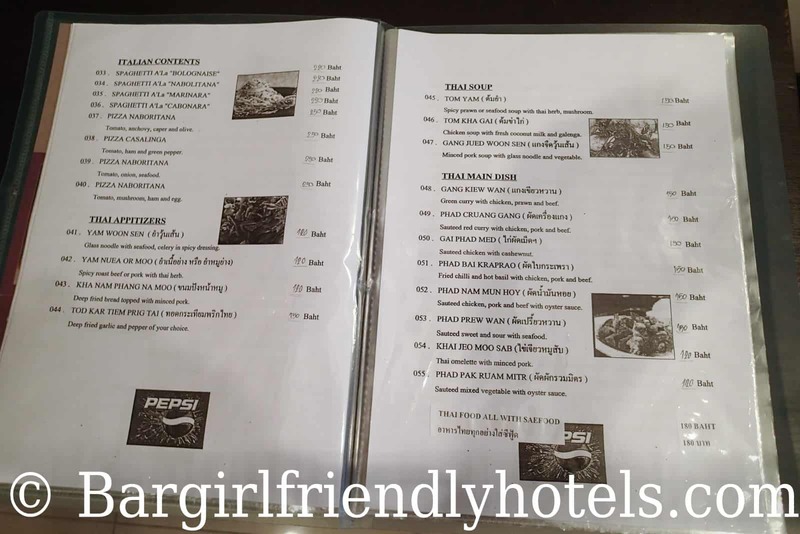 ** She cannot have breakfast with you in case of your room including breakfast, you have to pay for her 280 baht". 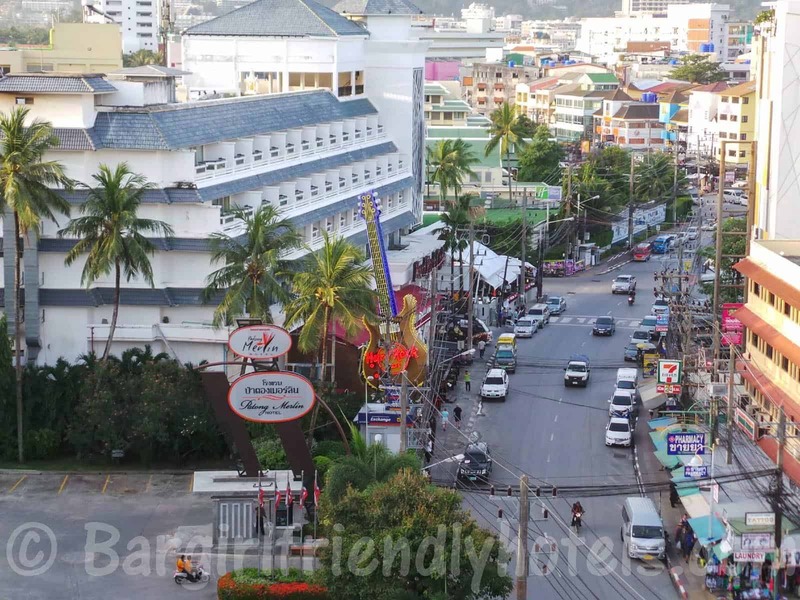 The Bamboo House Phuket Hotel is located right in the center of Karon with plenty of restaurants and bars surrounding it. Beach is also very easy of access only a few minutes walk away. 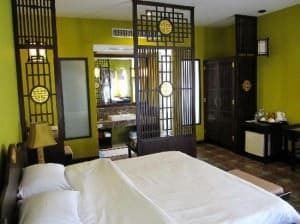 Rooms are nice with a modern decor and comfortable Japanese style low beds. 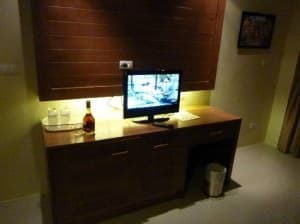 The biggest surprise was they provide an Apple Mac Mini hooked up to the flat-screen TV with free access to the internet, Wi-fi is also available for your own portable devices. 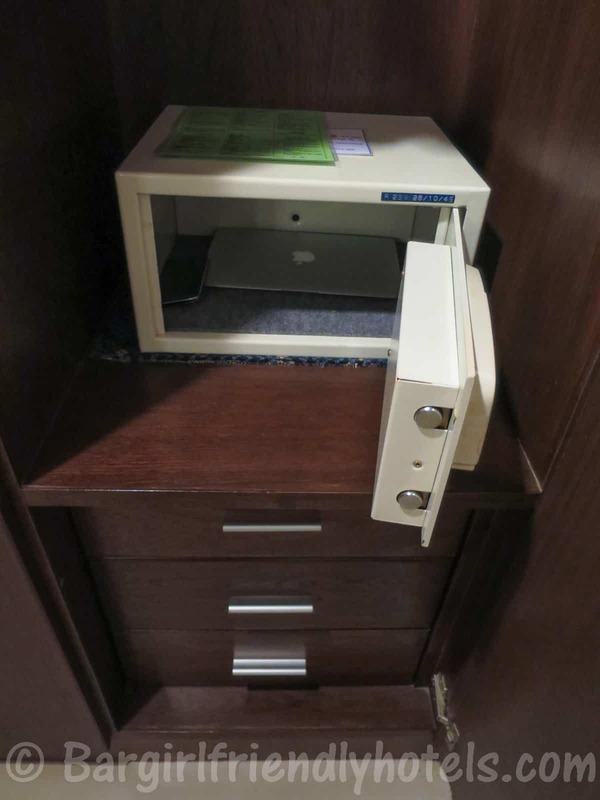 PROS: Location, Apple Mac Mini in every room, Pool gets sunshine all day, beach bag with towels. Guest Friendly policy reply by The Bamboo House Phuket Hotel: "Thank you for your email, inquiring about a guest friendly policy (joiner fee). We are pleased to inform you that there is no fee for the joiner and her ID card has to be left at the reception. We look forward to welcoming you to Bamboo House Phuket. Yours sincerely, Wanida Phermpoon Reservation Department". 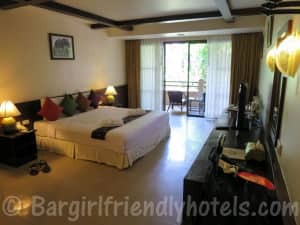 The location of the Karon Cliff Bungalows Bungalows is its greatest advantage. 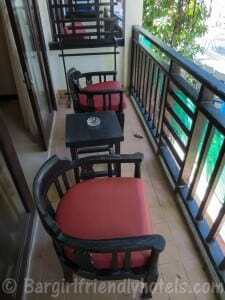 Set on the slopes of Karon you have great views of the beach and Andaman sea below. Access to the beach is easy all you need to do is follow the stairs leading down to a quiet part of the beach and from there on it's only a 10 to 15 minutes walk to the center of Karon where all the restaurants and bars are. Otherwise don't expect a 5-star hotel. 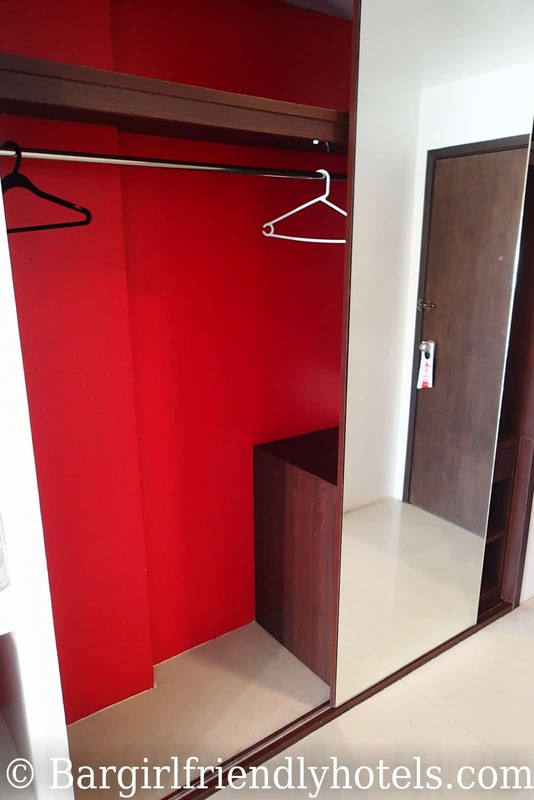 Calling it boutique is already far fetched but you do get clean rooms of decent size with all the basic amenities. PROS: Views, peaceful & tranquil resort. CONS: Entry level rooms are bare and basic. 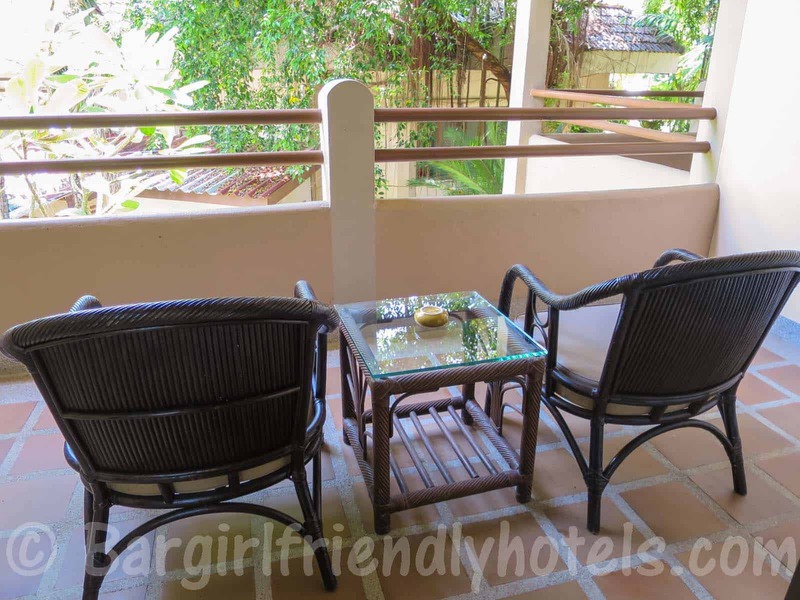 Guest Friendly policy reply by the Karon Cliff Bungalows Bungalows: "Booking for 1 room is maximum 2 persons occupancy (2 persons staying) You are able to bring a friend together with for 2 persons of total. With kind regards, Sandy, Ms.Sommanus Pongpraporn. -Sales and Marketing Manager". 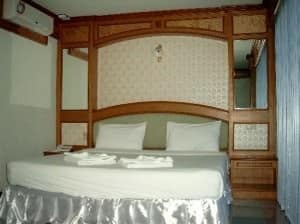 The rooms at the Manohra Cozy Resort are divided up into two sections. A newer and more modern garden wing with really nice rooms VS the original main wing with older ones. 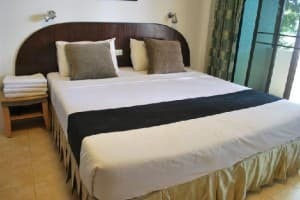 Both are of good quality rooms with all the expected amenities but for the small bump in price I'd strongly suggest booking the Superior over the Standard. The downside for many is it's location, a good 15 minutes walk from the beach. PROS: Grounds, pool & bar, staff, food. CONS: 15 minutes walk to the beach or 10 minutes to Karon circle. Guest Friendly policy reply by the Manohra Cozy Resort: "That is no problem, no additional charge. Best Regards, Klas". 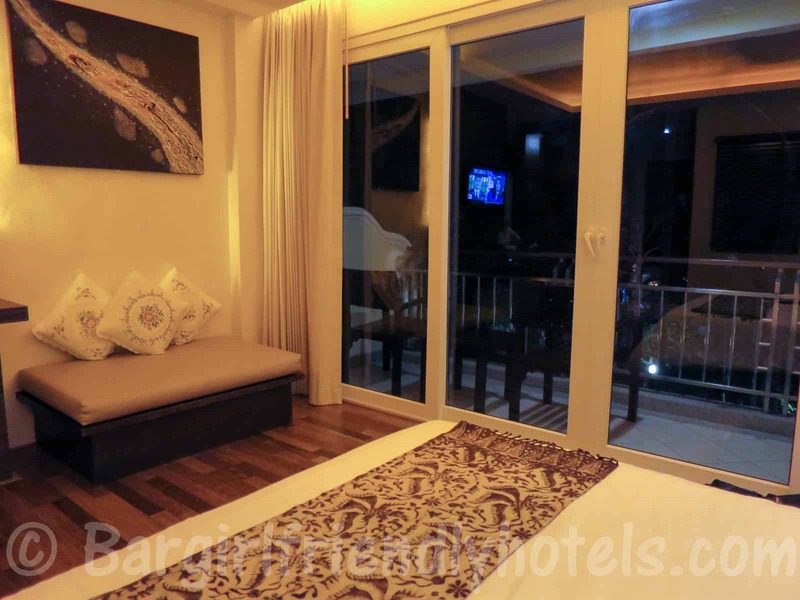 The Karon Living Room Hotel is located on the main Patak Road about 10 to 15 minutes walk from the beach. 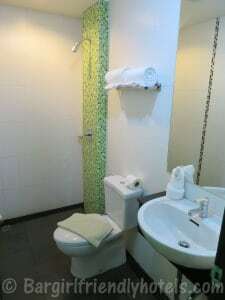 Rooms are clean spacious with all the basics: Firm but comfy beds, A/C, TV, fridge, Wi-Fi, wet room with shower & toilet. 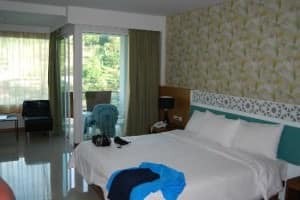 While this is no 5-star luxury resort, for the price you pay I would consider it one of the best budget value for money hotel I've been to in Karon during the high season. Highly recommended! PROS: Excellent value, free Wi-Fi, great staff. CONS: 10 to 15 minutes walk to the beach, no pool. Guest Friendly policy reply by the Karon Living Room: "It's free if she leave her ID at the reception desk. Best Regard, Neung -Reservation Dept. Karon living room hotel". 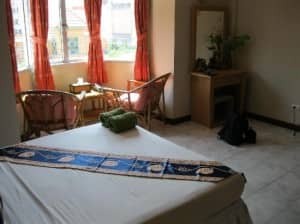 The Karon Sunshine Guesthouse is located less than 5 minutes walk from the beach. 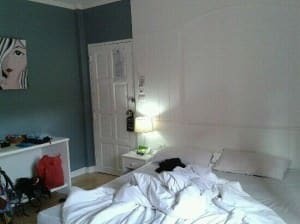 The Superior room I booked (under 20$) was very clean and had plently of space. 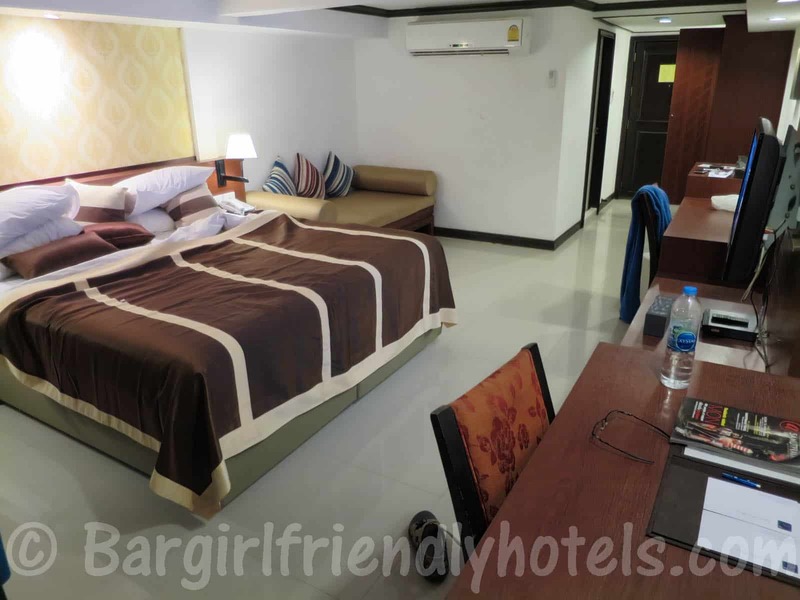 Rooms are supplied with AC & ceiling fan, TV(plenty of channels), minibar, seating area with chairs and table, decent size bathtroom with toiletries. 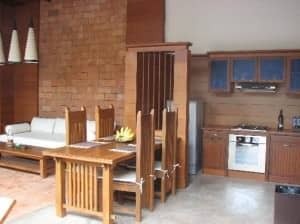 For the price this is another great budget accomodation in Karon. Highly recommended! 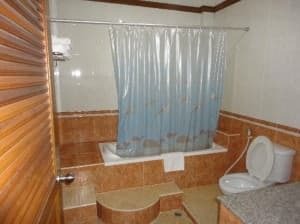 PROS: Excellent value, free Wi-Fi, friendly atmosphere & staff, 5 mins to beach, full size beach towels for free. 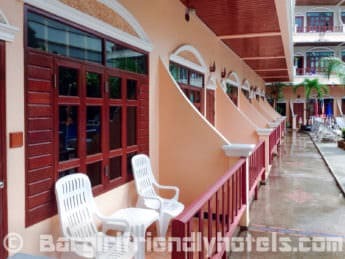 Guest Friendly policy reply by the Karon Sunshine Guesthouse, Bar & Restaurant: "Hello, We do not have a problem with guests as long as they respect my other guests, my staff and my property and their host remains responsible for them. There is no additional charge for 1 guest. Best regards, Greg". 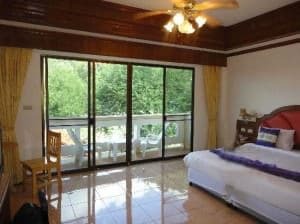 The Pineapple Guesthouse is a great option for those looking to save up as much money as they can on accomodations while retaining some level of comfort. 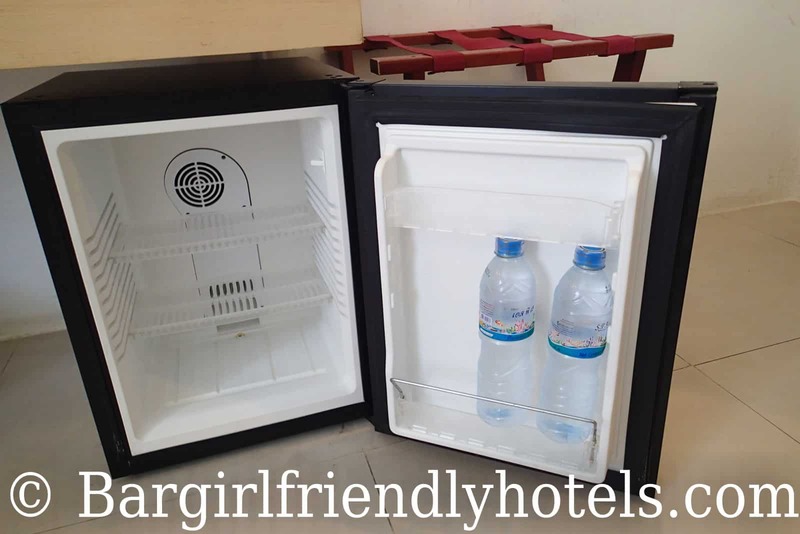 Depending the season, the price varies from 500 to 1000 THB and for that amount you can expect clean rooms of decent size with: Big beds, TV, A/C, fridge with 2 bottles of water every day, safe, hot shower and good Wi-Fi. It's only a 5 minutes walk to the Karon beach or 20 minutes if you want to go all the way to Kata beach. 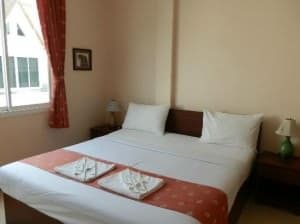 While unspectacular, the rooms are of good value for money all year round. PROS: Low prices all year long, good Wi-Fi, Location, clean rooms. Guest Friendly policy reply by the Pineapple Guesthouse: "Yes, we are guest friendly and there's no charge. Regards, Steve". 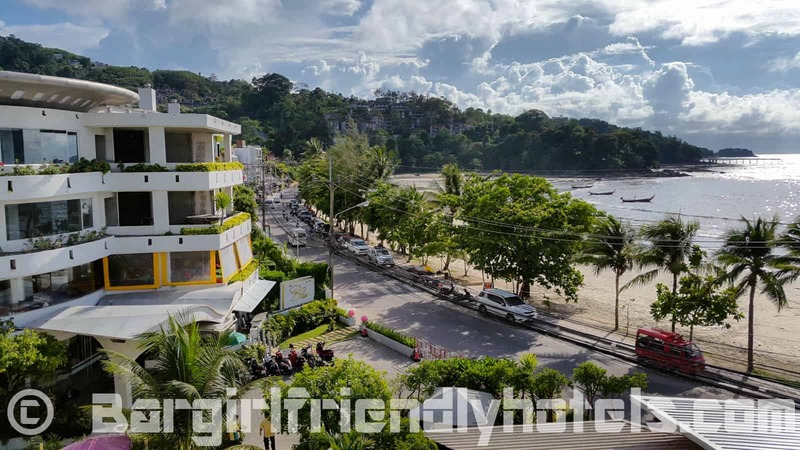 The Be My Guest Boutique Hotel is located at the nortern tip of Kata just 300 meters from the beach and about a 5-10 minutes walk from Karon beach. 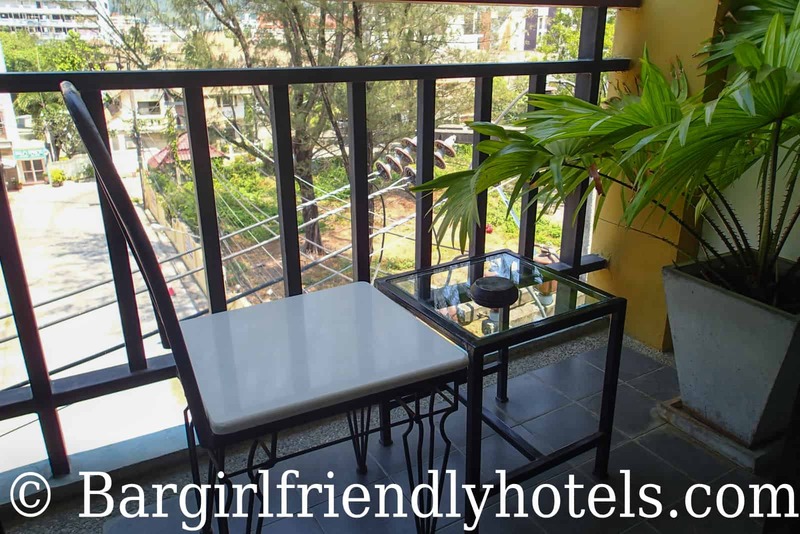 While this is not a boutique hotel like their name would like to make it sound the rooms are spacious and clean room with a private balcony, TV with a good range of channels, A/C unit (a little noisy at times), fridge, fast WiFi (free) and a safety box. 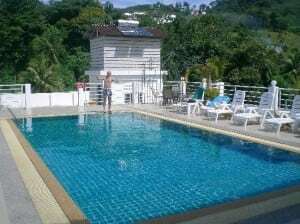 They do not have pool but for the price it's a good deak in Kata. 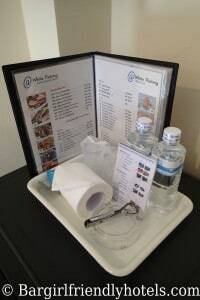 Guest Friendly policy reply by The Be My Guest Boutique Hotel: "Hello, no problems) You are welcome) Enjoy". 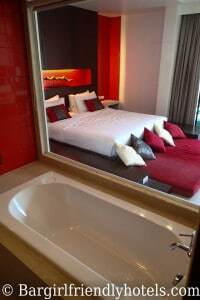 The BluEco Hotel brand new and very clean where the furnishings are modern and the rooms spacious. 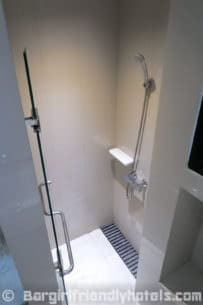 The bathroom is a bit on the smaller side but there was always plenty of hot water for the shower. Downsides I found are that the bed is a little hard and there is no in room Wi-Fi (only in the lobby). 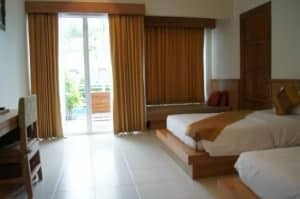 Located a street back from the main road it's a 10 mins walk to Kata beach or 15 mins to Karon beach. 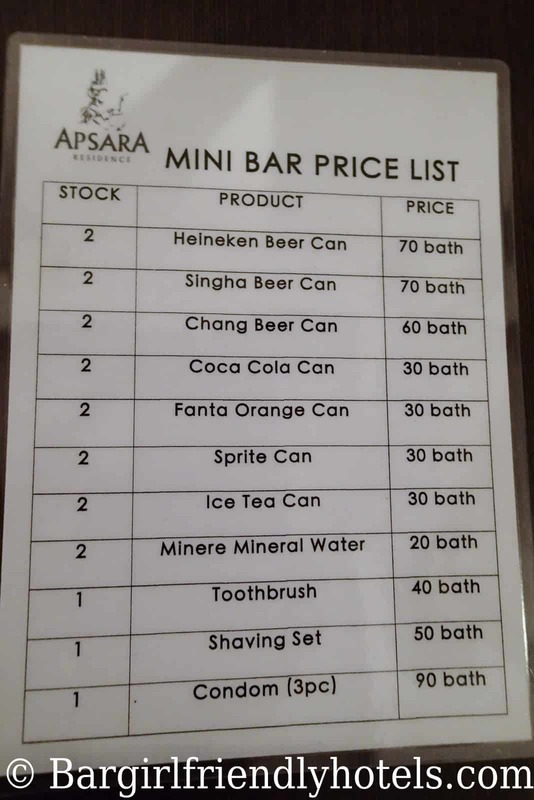 While not exactly a luxury resort for a 3 stars at that price I would say it's good value. Recommended! Guest Friendly policy reply by The BluEco Hotel: "Dear sir If you book 1 room for 2 person when you come check-in you check-in 1 person yes, You can have 1 lady but if you check-in 2 person you can't have lady ,if you have i charge 1000 THB/night If you need only one lady stay with you to long time about 1 week i block her for Guest Hotel If you change lady every day give ID every day too !! lady 18 years up!! Best regards, Rung". Guest Friendly policy reply by the Capannina Inn: "Good Afternoon Of course, we don't charge. But the identification with us for safety. Thank you, Reception - capannina inn". 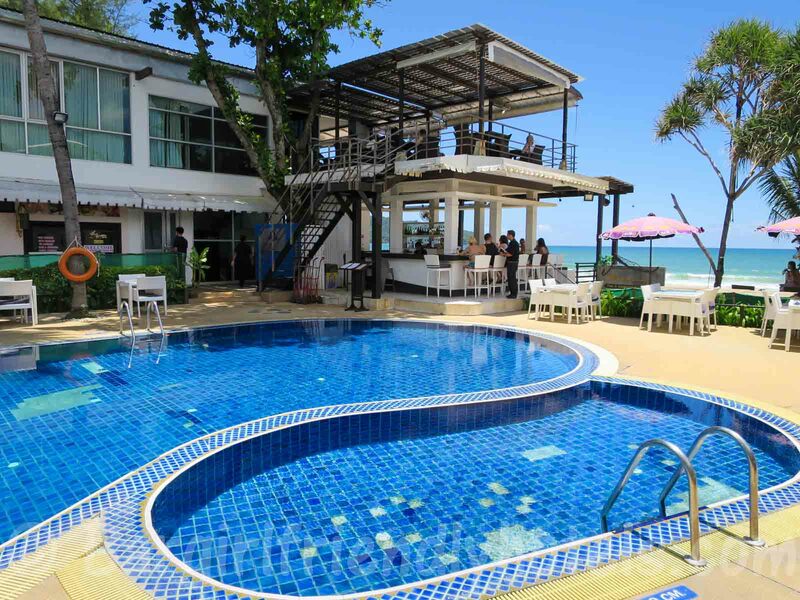 The Casa E Mare hotel is located on the Southern end of Kata up 300 meters from the main road so you have access to both Kata & Kata Noi beaches within 10-15 minutes walk. 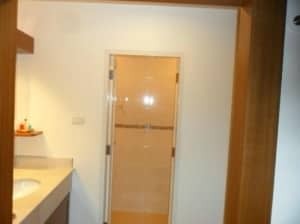 The hotel is approximately 5 years old so it's so is pretty new & modern. 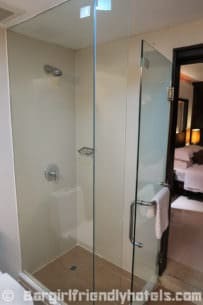 Rooms have large beds, TV, A/C, fridge, free Wi-Fi, safe, western bathroom (not just a wet room but a proper separate shower with glass doors) and balcony. For the 1000 - 1500THB range it's in, the price is very decent. Recommended! 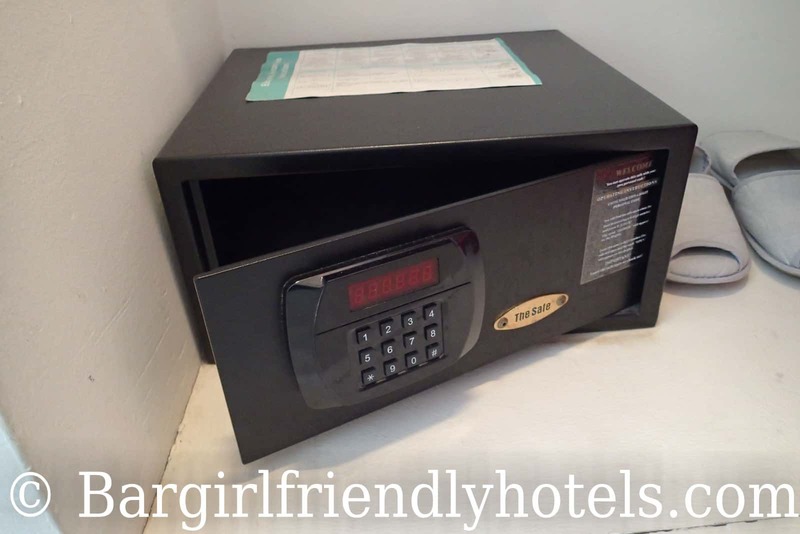 Guest Friendly policy reply by the Casa E Mare Hotel: "Hi, Isn't problem for the outside guest, just leave ID card, no extra charge. Hope to see your reservation. See you....". The Honey Resort is a nice clean little hotel tucked in a quiet and peaceful area so you don't get much of any street noise. 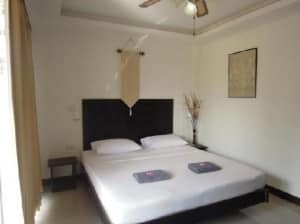 Rooms are modern and well furnished, comfy bed, air-con unit is efficient and quiet, ±70 channels on the flat-screen TV, the walls are thick, good shower and plenty of storage for clothes. They have a pool with a unique design that is perhaps 2 meters wide but runs the entire length of the front of the hotel. 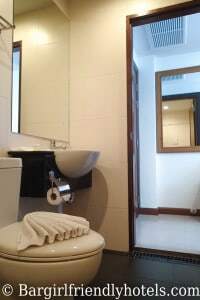 Located a 5-10 minutes walk from either the center or Kata beach. Downsides is there is no free in-room Wi-Fi (200 THB/day or 600 THB/week though accessible for free in the lobby. Guest Friendly policy reply by the Honey Resort: "Hi, Greetings from Honey Resort, Phuket! 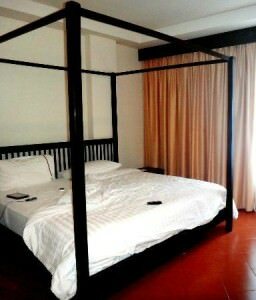 If you book for 2 persons in room, there will be no extra charge, but if you book only 1 person, there will be. Wish to welcome you to our hotel. Best regards, Thanathorn H. (Jazz) Asst. Marketing Manager - Honey Resort". 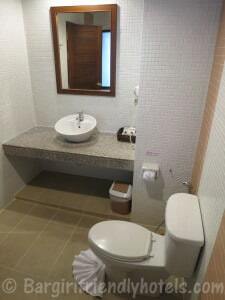 The Kata Blue Sea Resort is located in a very modern area of Kata surrounded by new buildings. Only a 5-10 minutes walk to Kata beach & all the bars and restaurants of it's centre. 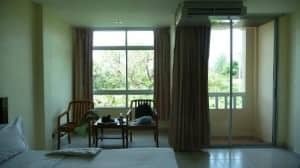 Rooms are comfortable and of decent size with A/C, flat-screen TV, safe, good shower, balcony (some with view other just a metal fence). They offfer good service with daily linen change, free breakfast & a nice little pool area. The surroundings are clean and quiet. The one downsides is they charge 100 baht a day for the Wi-Fi. 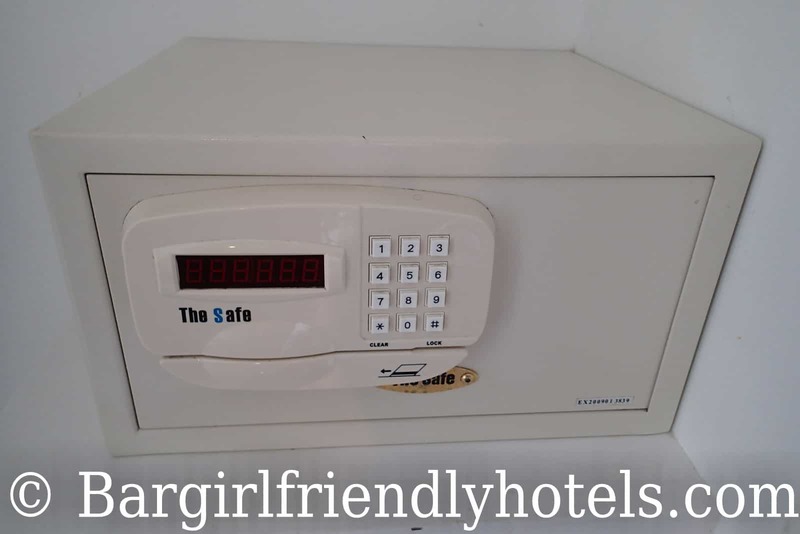 Guest Friendly policy reply by the Kata Blue Sea Resort: "Hi, Welcome to hotel kata blue sea 1 Room can stay 2 people not Charge for girl beer bars want only Real ID card lend for Reception Thank you and see you soon, sudsiri ". The Kata Lucky Villas aren't the least expensive property in the Kata area, but was worth paying a little more to enjoy the direct pool access some of their rooms have. I loved the fact we could have a dip stright from on our patio area. 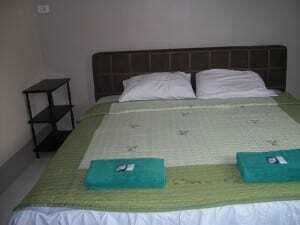 The rooms are great, spotless clean and very modern with comfortable bed and furnishings. Location also good, just a 5 minutes walk from Kata Noi beach while the road is littered with lovely restaurants & bars the way there. Downsides: No free Wi-Fi, disappointing considering the price of the room! 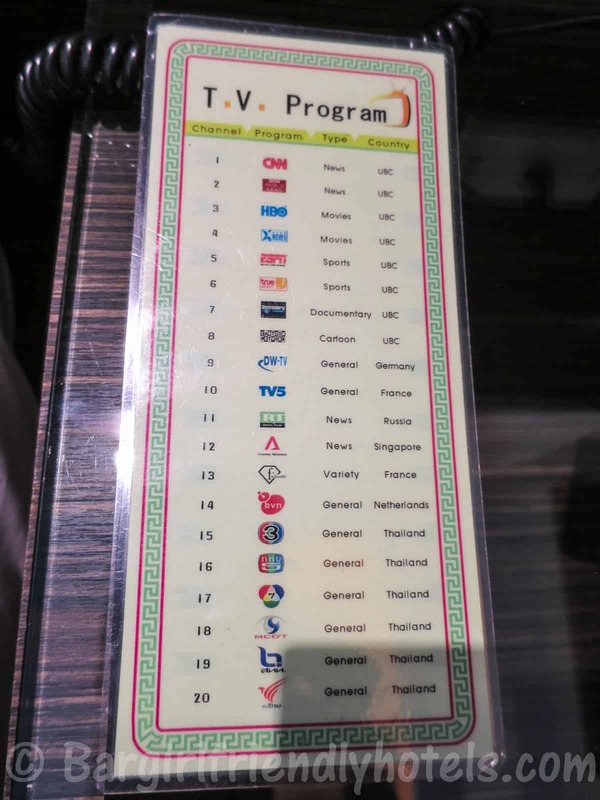 They do sell Wi-Fi vouchers at the reception for 50 THB/ hour. 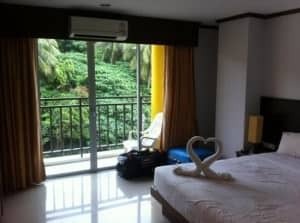 Guest Friendly policy reply by the Kata Lucky Villa & Pool Access: "You can bring the girl from outside to stay with you (You have to find by your self) and if you want extra breakfast for her cost 250 THB / day , and she has to leave her I.D. card at the lobby between stay here. Regard, Ae -Reservation Team KATA LUCKY VILLA & POOL ACCESS". This hotel was really amazing. 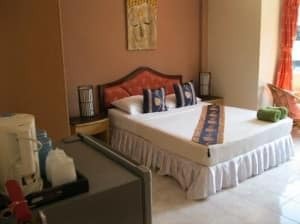 Each room has a pool with a spacious living room, kitchen, dining room, large bedroom, huge and uniquely decorated bathroom with a jacuzzi. 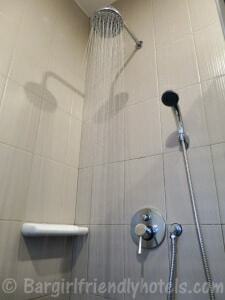 The place was very clean and the staff was really nice. 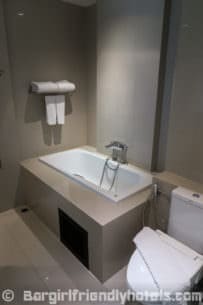 I loved the clean jacuzzi and everything about our stay here. The hotel is within a few minutes walking distance of the beach.. 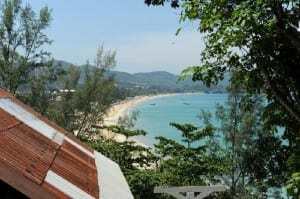 The Manohra Cozy Village is a small resort with just 12 rooms tucked in a quiet back street on the northern portion of Kata where both Karon and Kata beach are within 10 minutes walk. 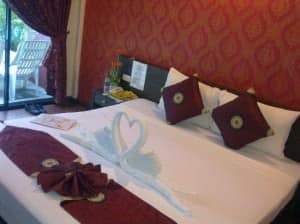 Both the Standard & Superior rooms are nice and spacious. 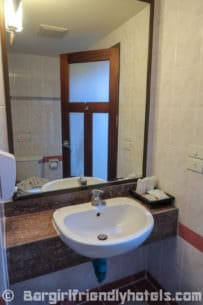 Both seem to have been renovated recently and come with good beds, Flat screen TV's, air-conditioning, minibar, safety box, Wi-fi. The Superior rooms are bigger and poolside. 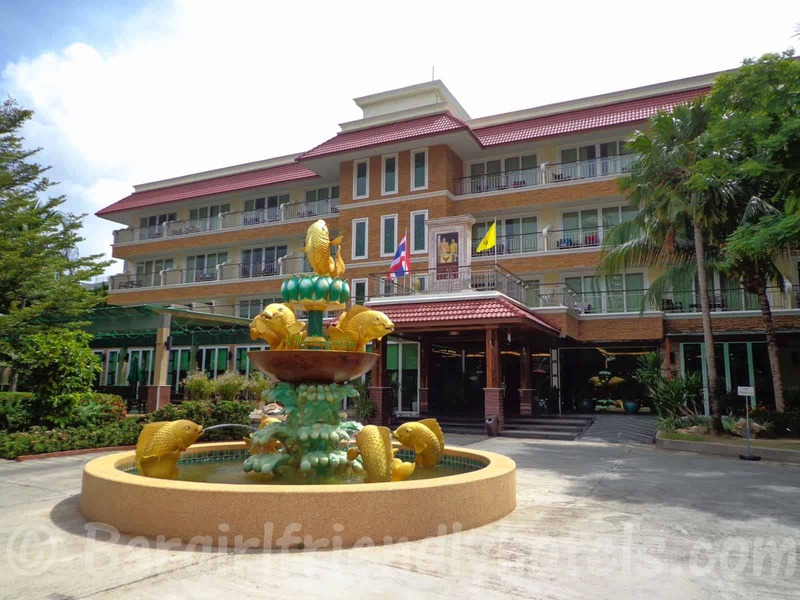 This place made TripAdvisor's Travelers' Choice 2013 for the Top 25 Bargain Hotels in Thailand so I Highly Recommended it! Guest Friendly policy reply by The Manohra Cozy Village: "Greetings from Manohra Cozy Village! We confirm availability for the month of March (the most available on superior rooms only) There is no surcharge for additional guests as we're joiner friendly. Best Regards, Dario Bortolati -Manohra Cozy Village Village Manager". 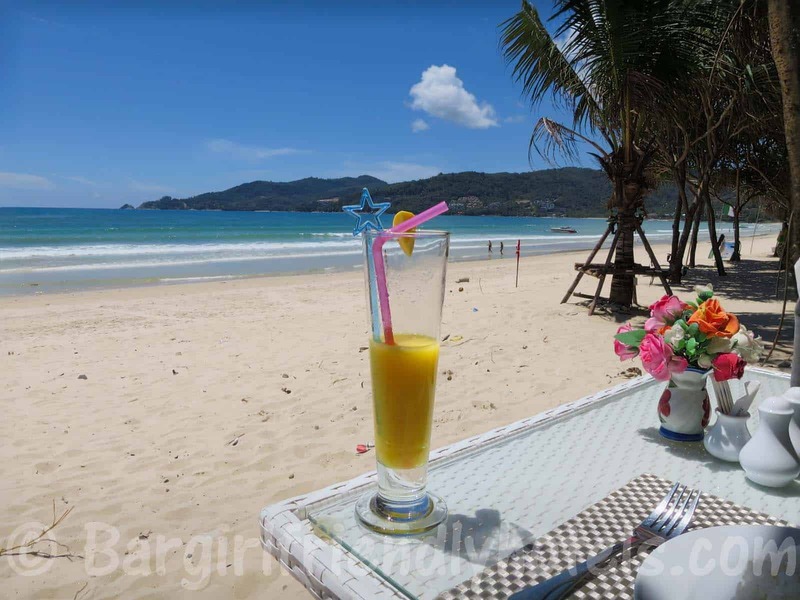 Outdoor Inn & Restaurant is located a short 5 minutes walk from Kata beach. 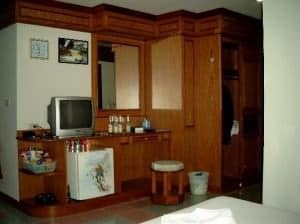 The hotel itself is pretty average, nothing really special but they often offer some very low rates via Agoda. 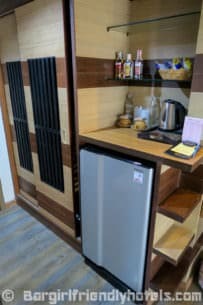 Rooms are spacious, beds comfy, A/C unit works properly, has a fridge, 28 inch TV, Wi-Fi, wardrobe, desk with chairs, safe & hot showers. Guest Friendly policy reply by The Outdoor Inn & Restaurant: "Dear! We don't charge girls bar just hold in cards see you". 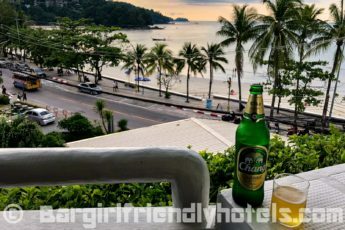 If you are looking for the absolute best five star guest friendly resort in Kata and have no budget restrictions look no further... Listed TripAdvisor's Traveler's Choice® 2013 Winner as one of the Top 25 Hotels of Thailand in not one but two categories: Luxury & Top, the Shore at Katathani Resort is the cream of the crop. Located up on a hill the setting is truly breathtaking and paradisiac. 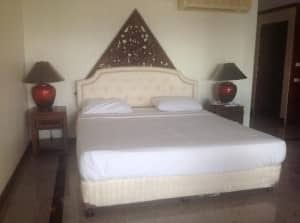 The villa rooms are very large and are equipped with every possible amenities, the staff and service exemplary always eager to satisfy your every wish. 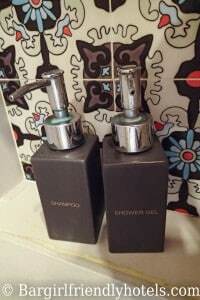 So if it’s true 5 star luxury you’re after and have the budget this is it! Guest Friendly policy reply by The Shore at Katathani Resort: "Please be inform that we can allow to bring the joiner without any additional charge as per requested, but we do not allow her to use any facilities in our hotel". 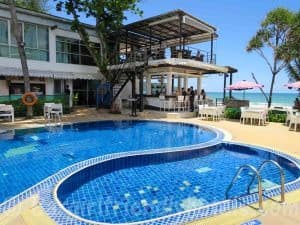 The Southern Fried Rice Guesthouse is located in a quiet side street just 5 minutes walk from Kata beach, 10-15 min to Karon Beach & around 30 minutes to Kata Noi further south. The rooms (only 8 in total) are very spacious and well lit by large windows. 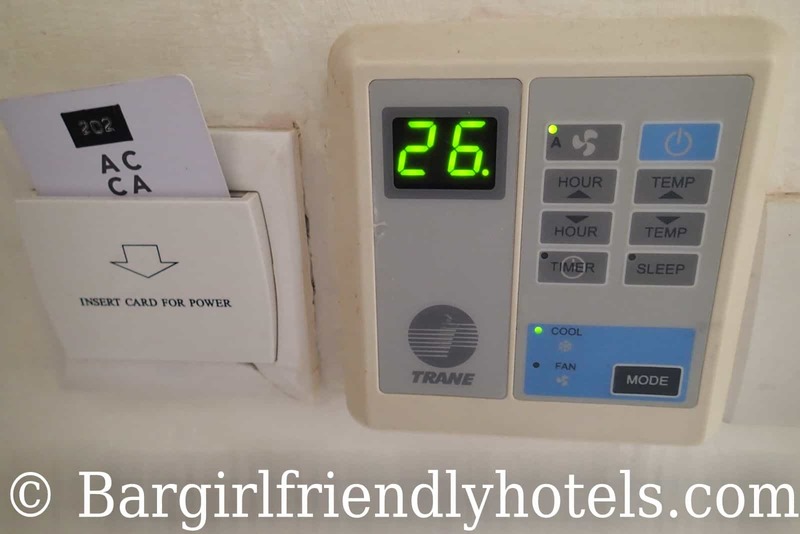 The bed was comfy, A/C unit works just fine, TV has a few English channels, mini bar, very good wifi connection ,in room safe, hot shower with proper water pressure and free continental breakfast. The staff and owner Terje are super friendly and always helpful with guidance, good deals on taxi and tours/ferry transfer. 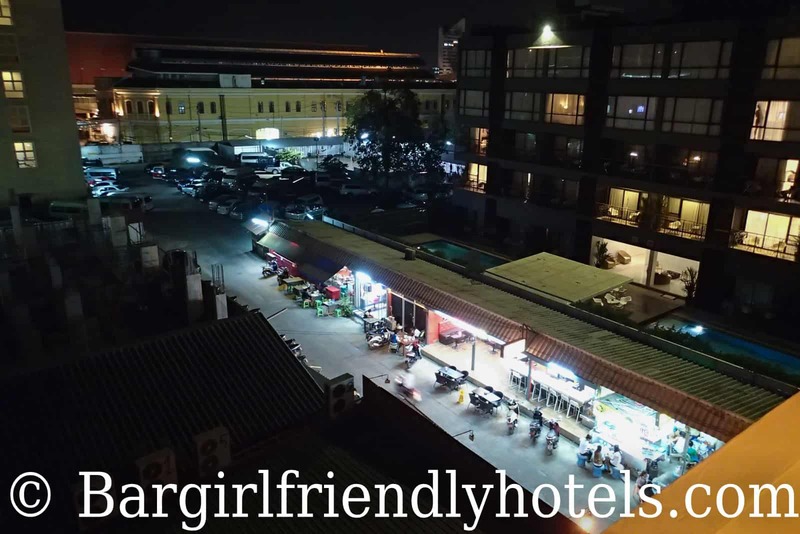 Guest Friendly policy reply by The Southern Fried Rice Guesthouse: "Hello, There are no restrictions on bringing a girl to the room. Kind regards, Terje".